For years I've admired and wanted a Simplicity Carry-all like this one. Maynard had 2 and when he passed I made a mistake not requesting one when sold. 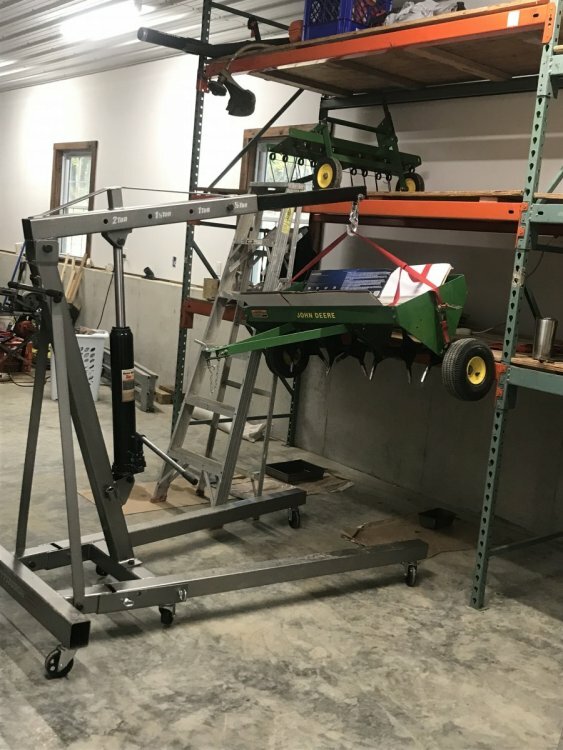 We just don't see 'em in Missouri as it seem the farmers who bought garden tractors were fiscally conservative and they just didn't splurge for equipment. 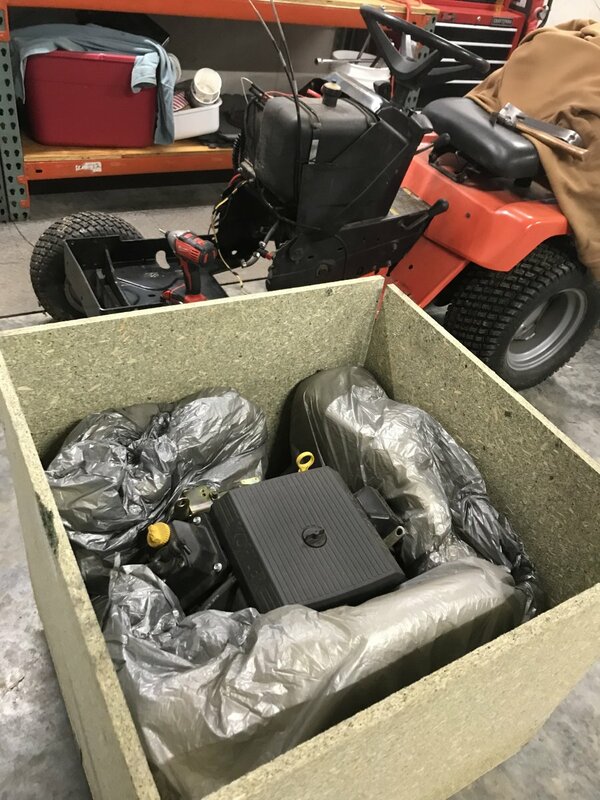 Heck, you don't even see many hydro garden tractors around here from the 1960's as farmers opted for "the poor man's hydro" variable speed units because of their familiarity with similar drive units on harvester/combines. But I digress..
ACken fabricated the top link for me. I cut, drilled, and welded the rest of the skeleton from new bar stock purchased locally. Again, the skeleton is similar but different than the original (we can say to protect infringement on patents but in reality I'm no engineer so it is what it is). 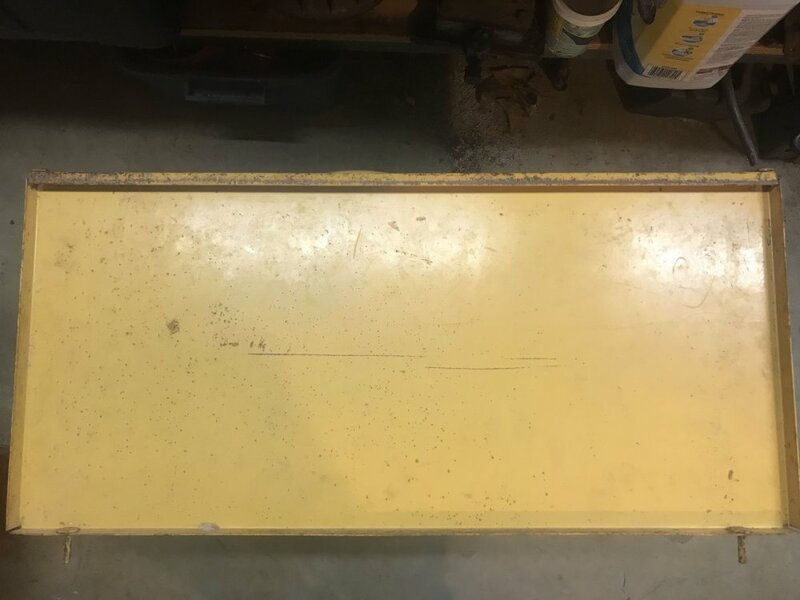 You can see I also used some angles cut from a Cub Cadet frame I had from a part out. I may fab up a set of longer lower arms. I think this would make carry-all have a steeper incline when dumping a load of whatever. I have the tailgate too. I'll post a picture mounted in a few days. How about my climbing wall? More on that sometime later but you can't get to it w/o climbing over my garden tractors & equipment. 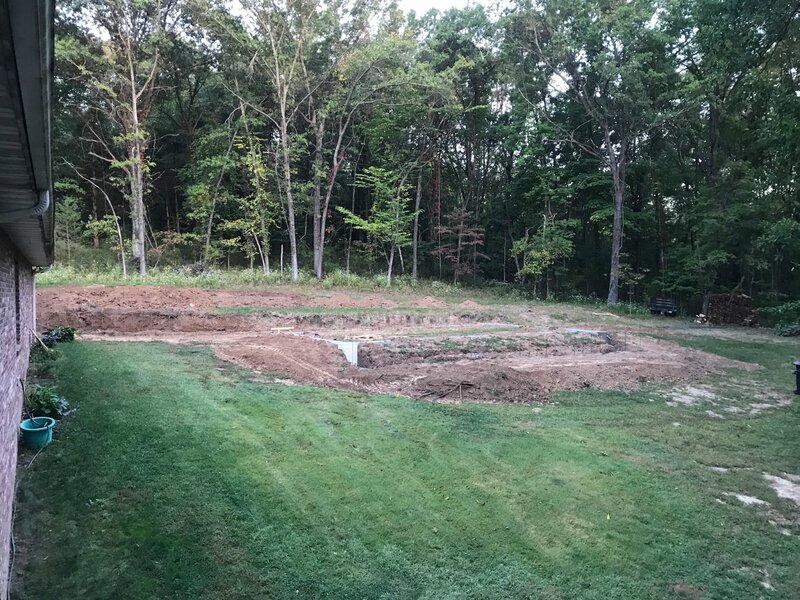 6 years ago I had a construction friend dig a diversion ditch above our house to take excess runoff rain water a different direction. That worked well until the last 3 years when our spring rains come anywhere from 2.5-5 inches at a time. There is a rock layer not far below the surface so water also percolates out as well as runs off the hill. I had failed to maintain the ditch so it had pretty well filled in at the breaking point so water just pooled and overflowed appearing like a pond dam overflow during rains this spring. I hauled out the long handled shovel, tiling spade, Allis Bumblebee 10 plus Agri-Fab cart, Simplicity 3012 and Agri-Fab Utility 10 carry-all. Had my own little parade. I haven't taken the carry-all off the Simplicity 3012 this spring; it is so handy and about the correct size to allow more frequent water and shade breaks. Also, the 3012 hydro lift has no problem lifting and holding a full load of dirt (even for long periods it doesn't leak down). 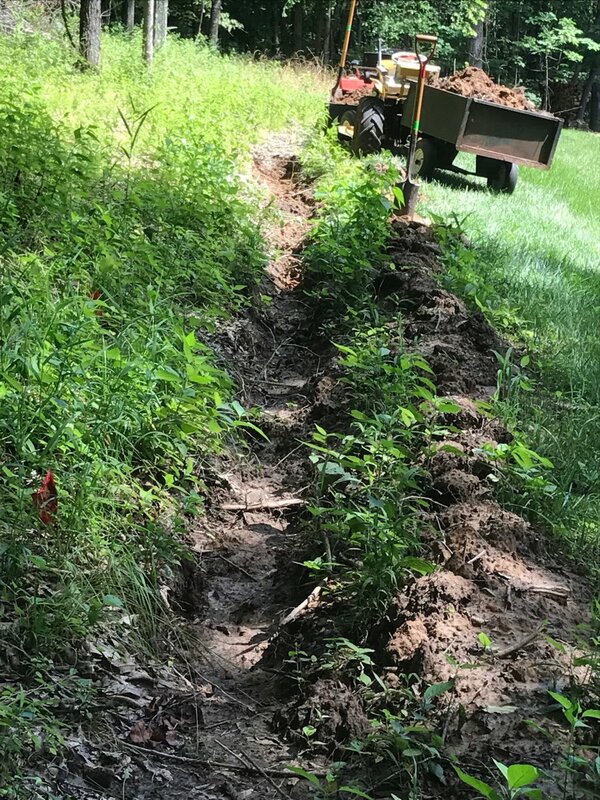 I started digging on the downhill grade side of the ditch clearing the channel so the water that pools on the upper side can have route of escape. I really don't work in a very systematic manner though as you'll see that I still need to dig on the downhill side in the next picture in order to make the grade work for me. Silt from the wooded hill above mixed with red clay dug pretty well after recent rains. I moved the soil from the ditch to areas of need in our backyard. The Agri-fab cart is an older unit, solid metal floor & built pretty darn tough. 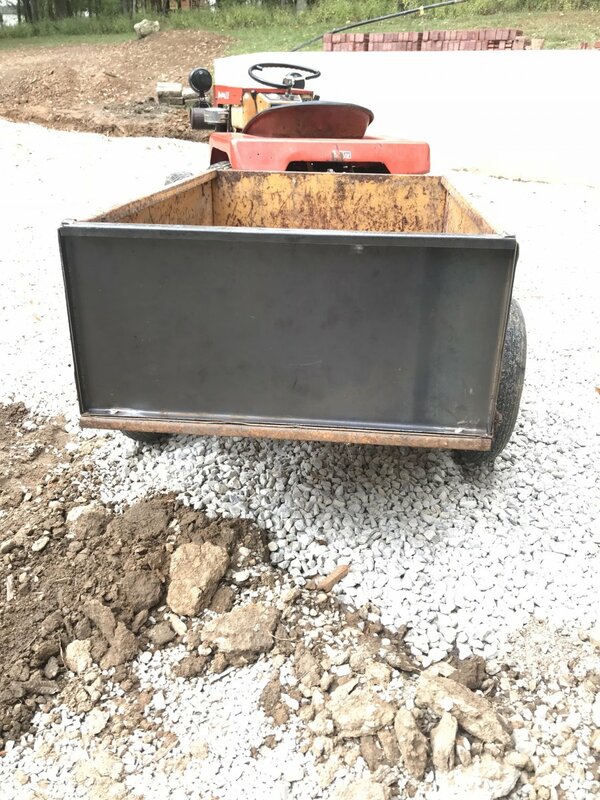 I filled it full several times and found right away the break-over-center point was not engineered correct for manual lift/dump by a short guy over 60. I needed some real umph to lift the loaded bed unless the rear of the cart was on a downhill slope. 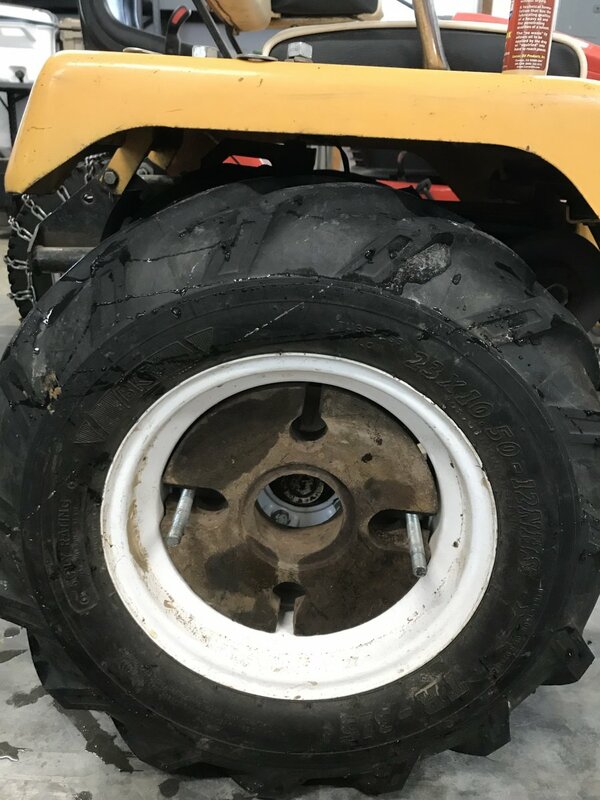 Probably loaded it a little too heavy (I'd bet 500+ lbs) bc I noticed the spot welds on the under gird popped in a few places after this use. Wasn't built to haul and dump full dirt loads. The Agri-fab 10 carry-all tailgate is very light constructed and bends too easily. 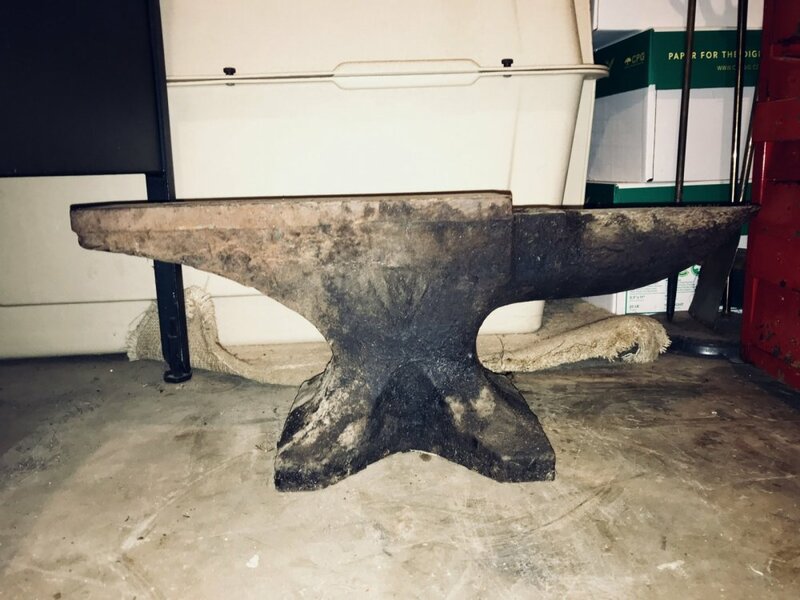 I am going to structurally strengthen it later with angle some light angle iron. That'll give me a chance to use my Hobart 125EZ wire welder I got at TSC on clearance last year. Wire welding is different for me. 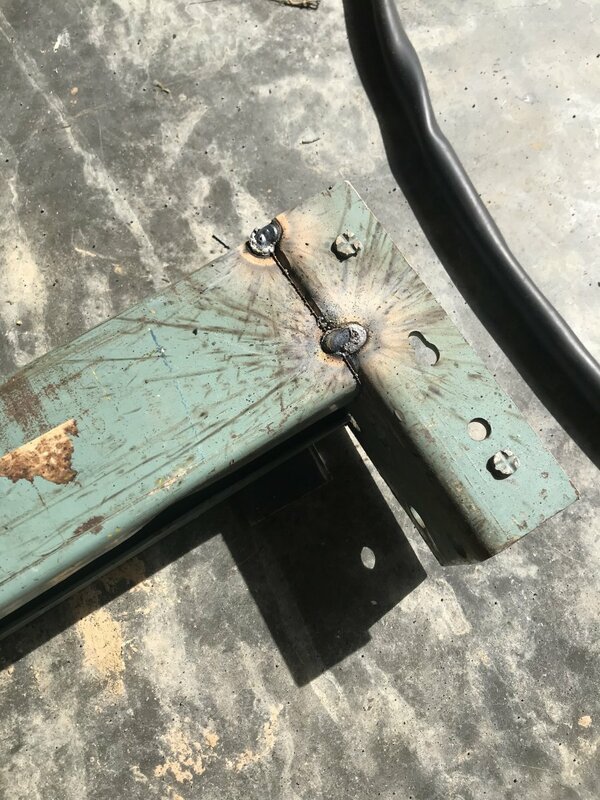 I learned to weld on Forney and Lincoln 240 stick welders using mostly 6011 and 6013 rods. I must say, this little 110 wire feed welder is so much easier to start and hold a bead; and so darn versatile. Another shot of my parade. I really like and have found so many uses for the carry-all. I do need to lengthen the 2 arms that pin to the lower hitch to give it more travel, but it works really well as it is. And thriller: fill it with dirt as below, drive up a small grade and you start wishin you had individual brakes to steer. 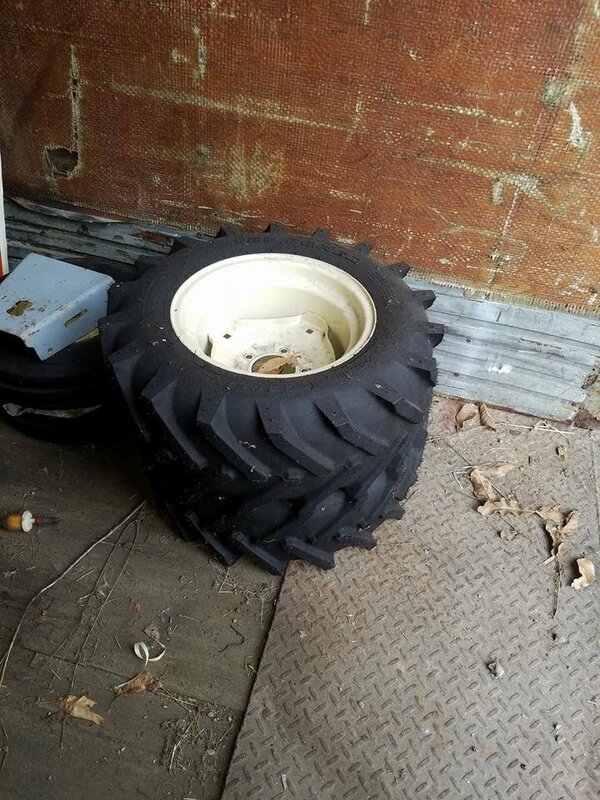 The front tires just float or ride a couple of inches off the ground and steering with them is by chance. 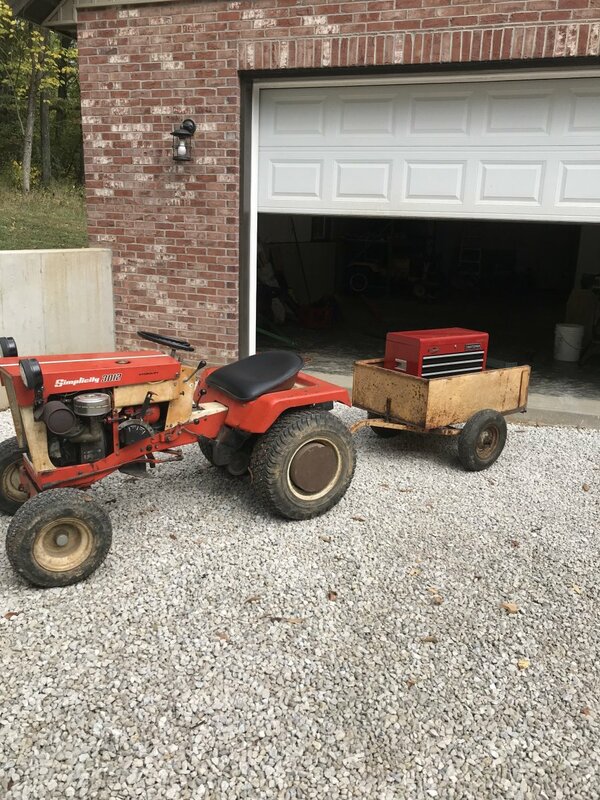 All in all I am just mystified by how these small garden tractors were engineered utility, strength, and reliability. And finally, our street is an older small community that has organized activities on holidays including Independence Day. At 10am kids games are held in various yards and, at noon there is a pot luck lunch. Immediately after lunch we hold a pet and wheels parade. This year I opened festivities driving an American flag bearing Allis B210 to the beginning of the street and back to our drive at the end. Then, as families began leaving the gathering, I drove the flag tractor up the street and back to close. I know, I need a new flag! Happy 4th of July SimpletrACtors. 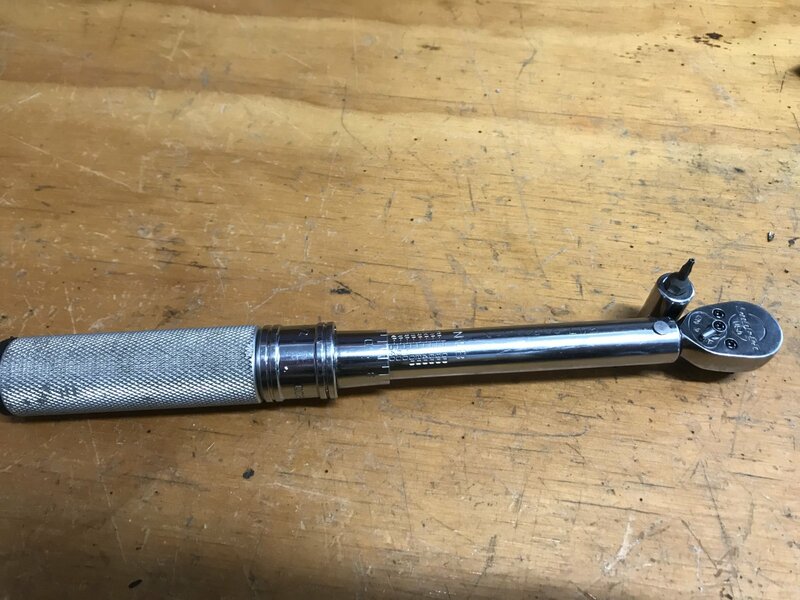 Recommendation: next time chase down the Snap-On truck & have the sales guy repair the torque wrench. 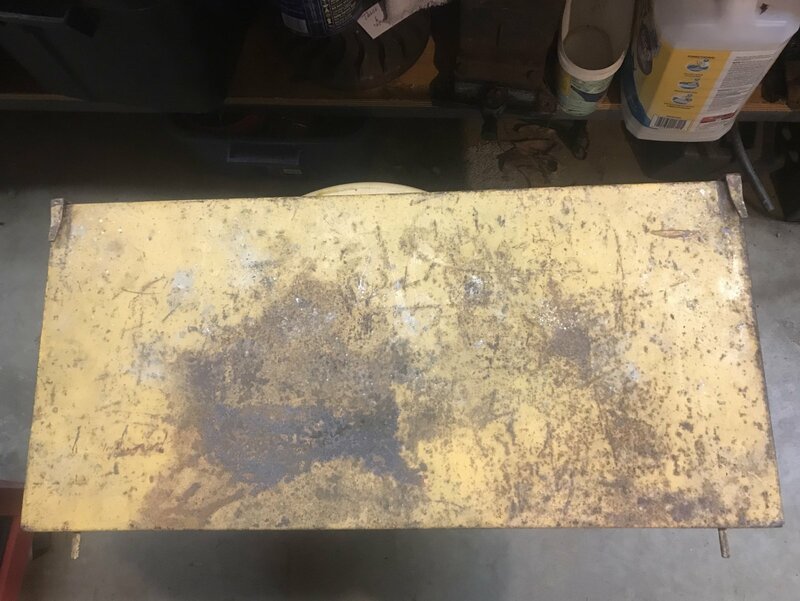 I’ve had it setting on a block of wood that Linda had in the basement. Worked alright but I needed to sit on the roller mechanic stool to use it. 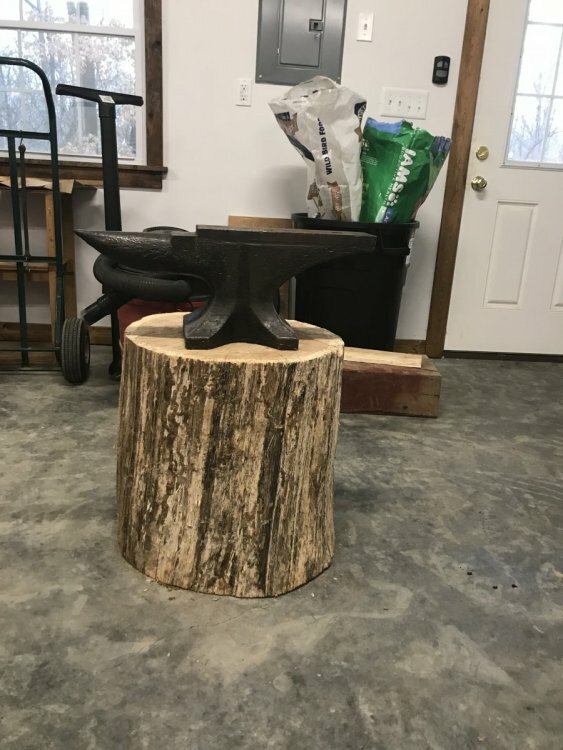 Told my neighbor I needed a stump to make an anvil stand. 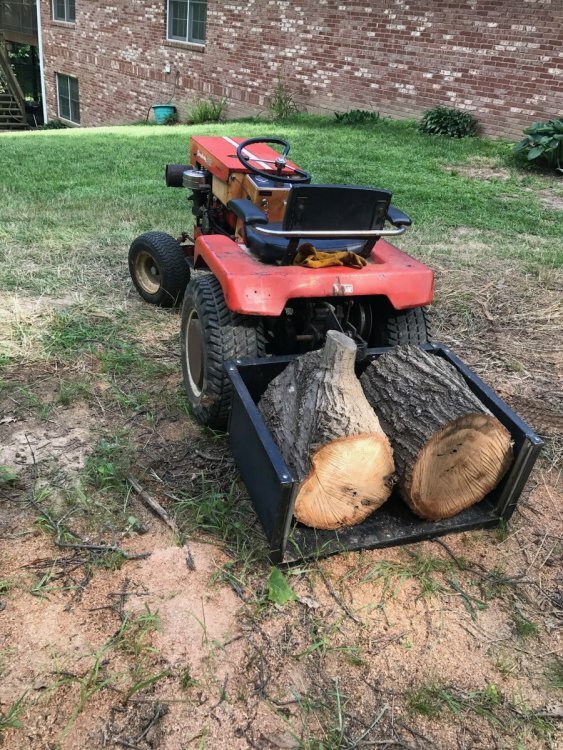 Shortly a tree service cut white oak in his next door neighbor’s yard and I got a call to come pick up my stump. 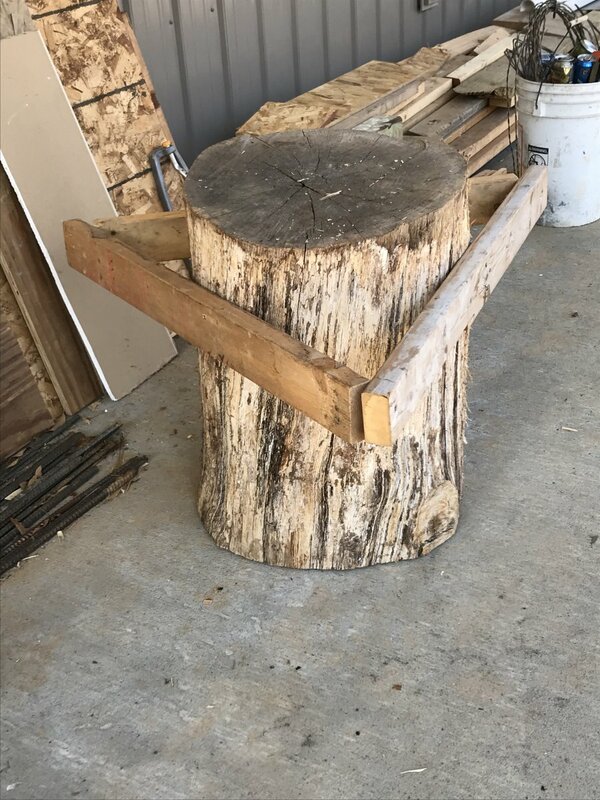 We debarked and let it dry on my shop porch until this week. 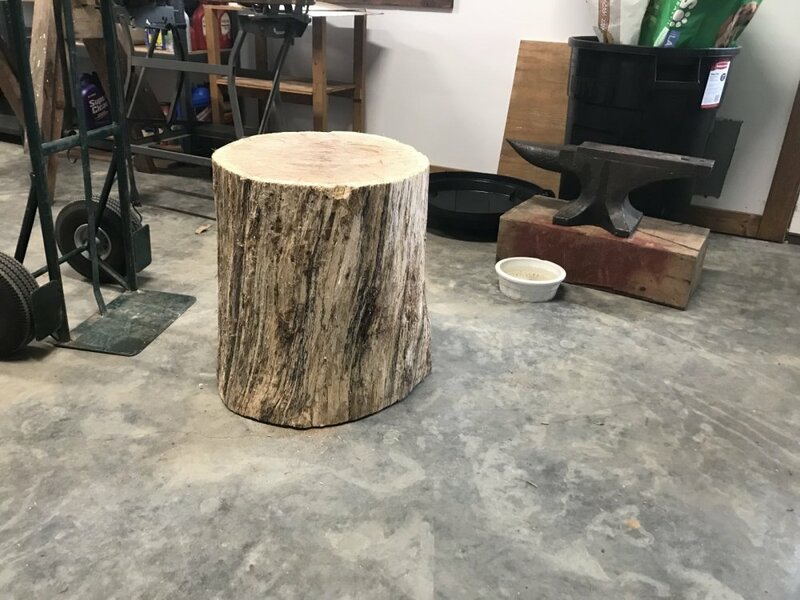 I watched a YouTube video on cutting an anvil stump/stand to correct height. 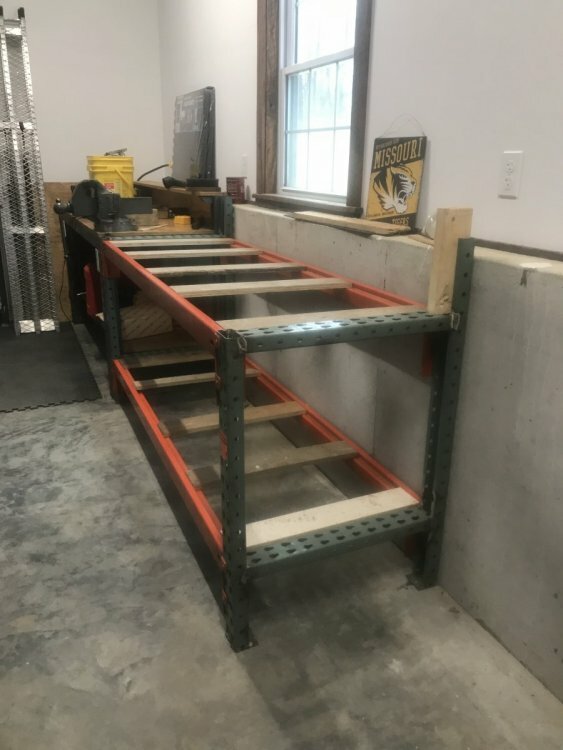 With 2x4s secured in decent level I turned it on it’s side. Will need to knock off a bit of the center of the underside as it has a slight wobble. 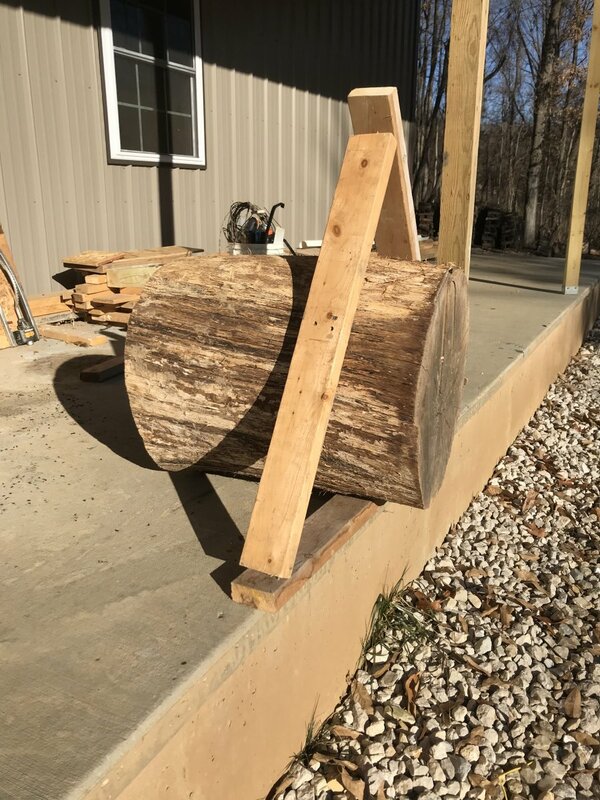 Neighbor has a belt sander.,. 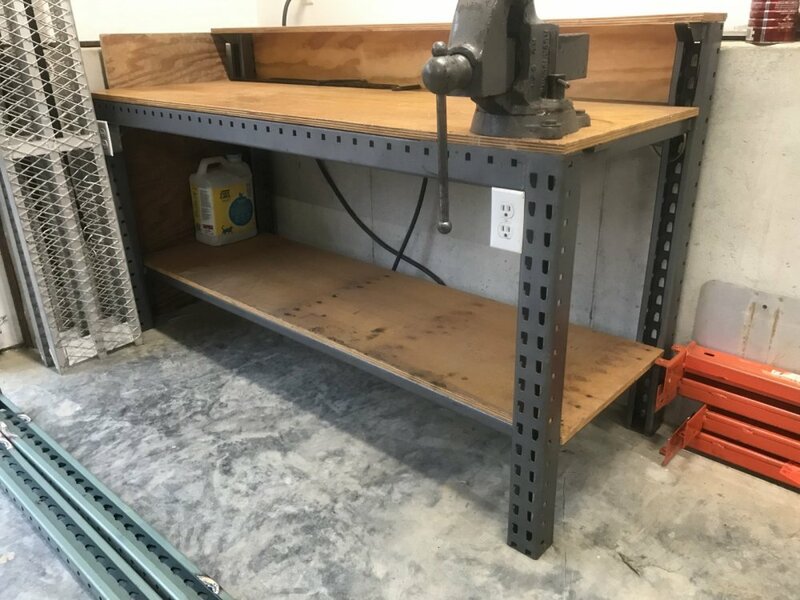 In 2010 I added a 6' beast of a workbench made from pallet rack metal and 3/4" plywood. The fellow that made it incorporated electrical outlets and a steel plate to mount my Rock Island vise. 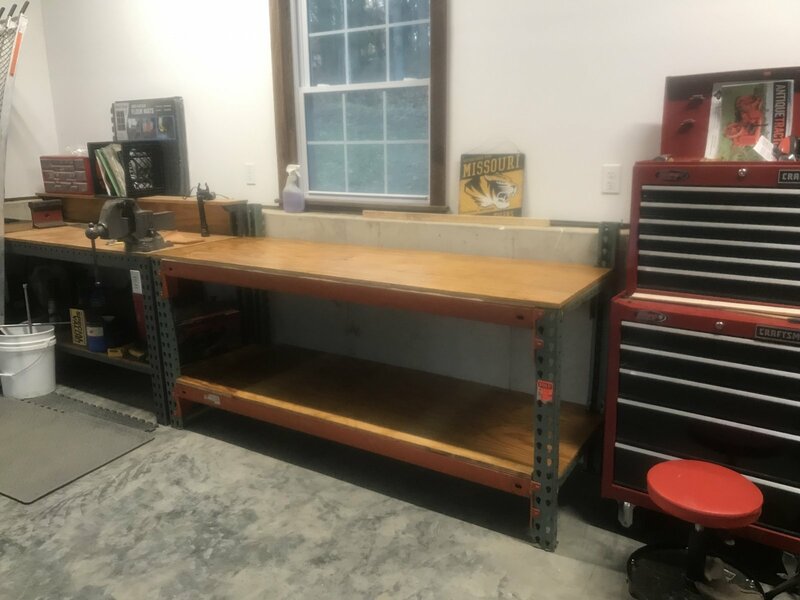 I really like its design so in my new shop there is adequate area for more workbench area. 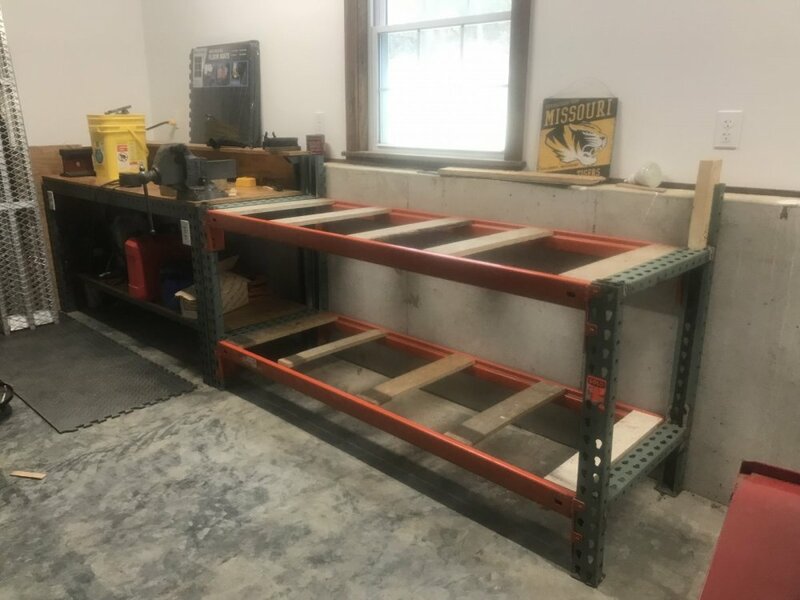 Mark, my neighbor who did the window treatment and wood trim around the walls cut the plywood on his table saw and helped me secure it in place on the new steel frame. No need at this time for extra electrical outlets but those can be added later if needed. We had to shim up the supports under the top +/- 1/4" to make up for my engineering gaps. 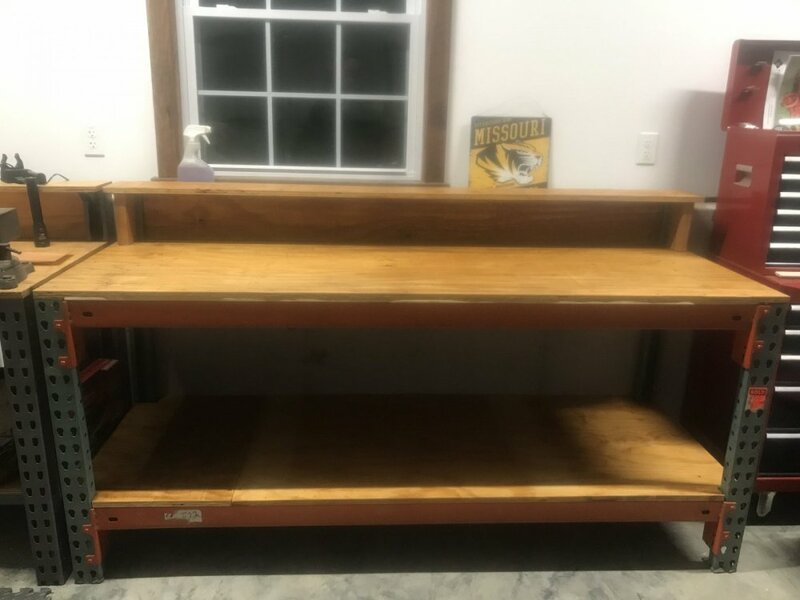 I need to drill and screw the top into the metal and then I'll decide if I want to sand and seal the plywood or leave it natural. Today is December 31, 2018 so its a good end to one year and start to another. As shown, mine are worn out and not ratcheting as deigned. 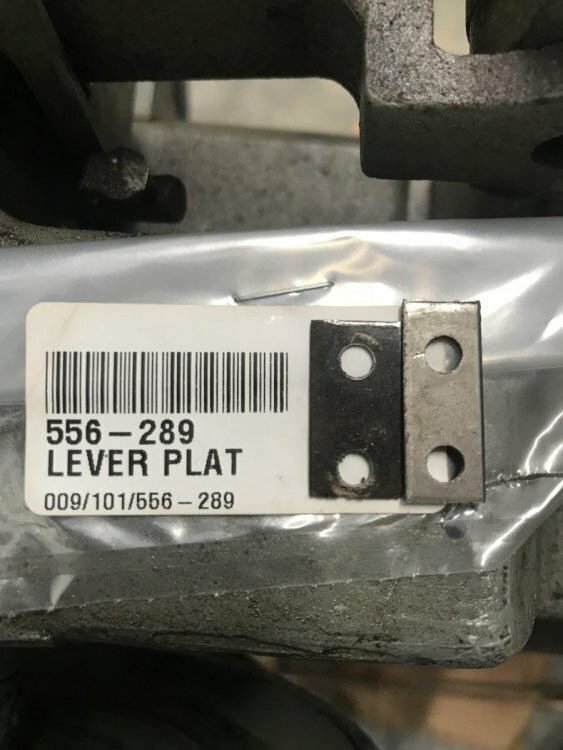 Not a big job to replace but I never expected to find the correct parts out there. For a total of $22 & change I received the new parts and know where to get more if needed. And after picture with new lever plates installed. Ever tried to acquire a tailgate for your Simplicity or AC dump cart? 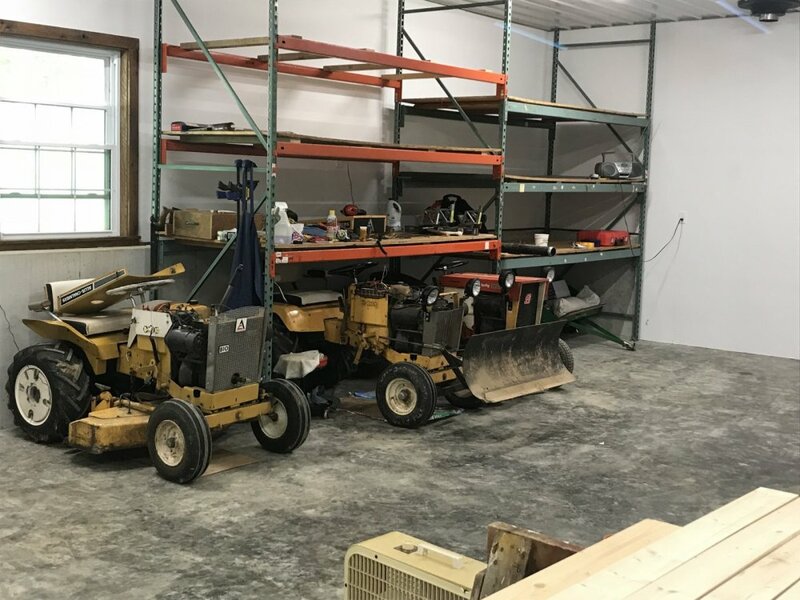 Well, I came back from 2018 Garden Tractor Daze in Portage, WI with two nice AC implements for my collection: a 42" fdt snowblower w/hitch and an AC cart w/o tailgate. Posted want ads, negotiated with sellers of rough carts w/tailgates, but in the end I just couldn't fill my order in the market. Next I contacted a fellow from a different site who offered new fabricated tailgates but I received no reply (mustuf sold them quickly). So, I have a contact through work that does some metal fabrication and has done a decent job for me in the past. 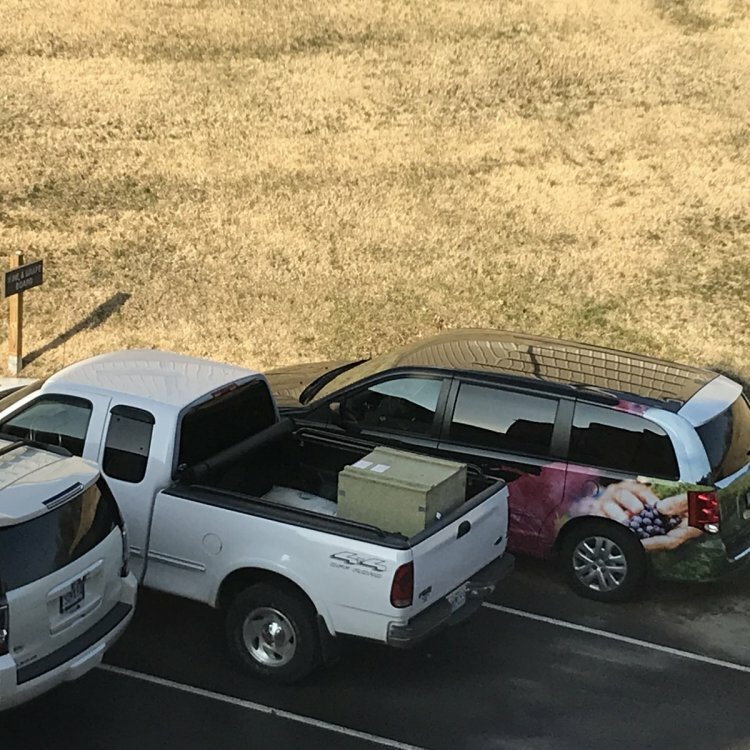 I took a chance and sent my (pretty good shape) original AC tailgate and asked for 2 tailgates made. And fyi - if you need one Briggs still has these torsion springs for sale. I bet there is a cheaper source but was easier for me to order one from my dealer and pay the $14 total including tax & shipping. Well. 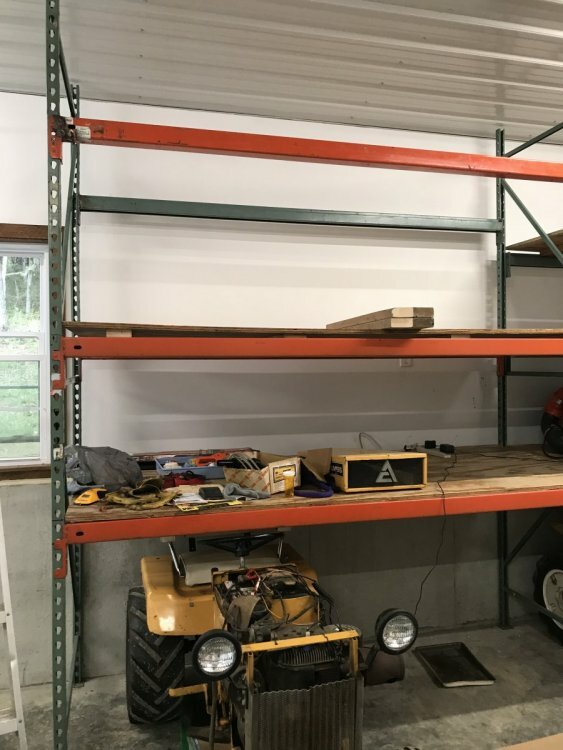 I am finally beginning that garage build I've discussed and planned for some time. 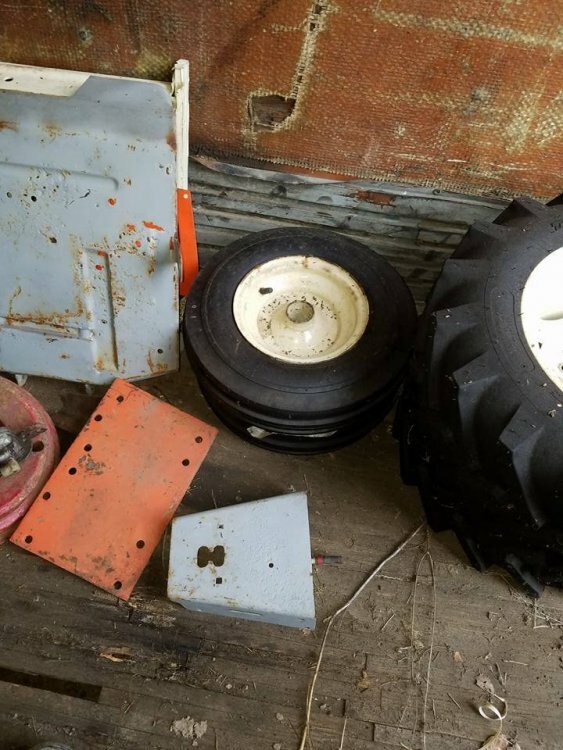 Linda really wants my shop, tractor, equipment, & parts collection out of the basement. So, with her blessing, I began the process October 2016. I have been intentionally slow to allow myself analysis time to decide what exactly I want and, to allow some adjustment in Linda's expectations (looks, colors, landscape, etc). 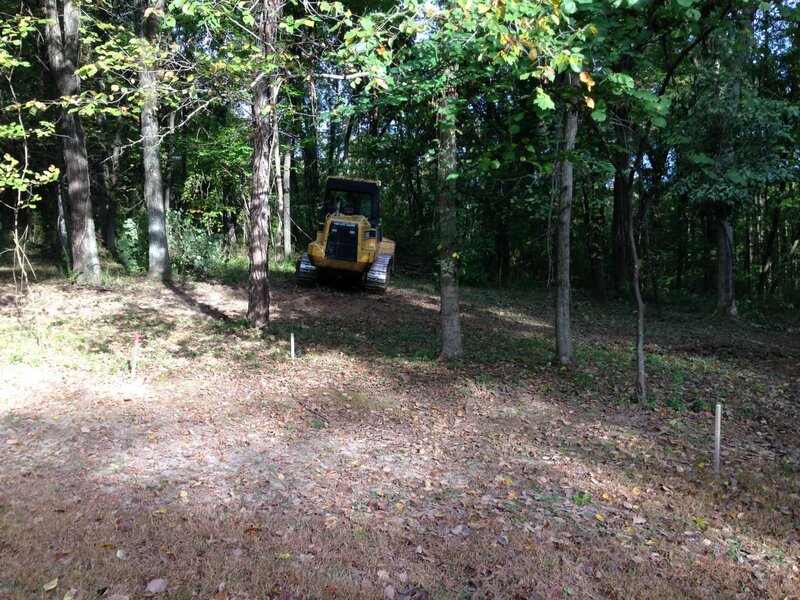 October 10, 2016 my friend and contractor Mike Schneiders brought his track loader in to clear and level our an area for a garage behind our house. Topography here is rough w/steep grades so it was critical to excavate in the location chosen to get the area I wanted (initially 30x30). 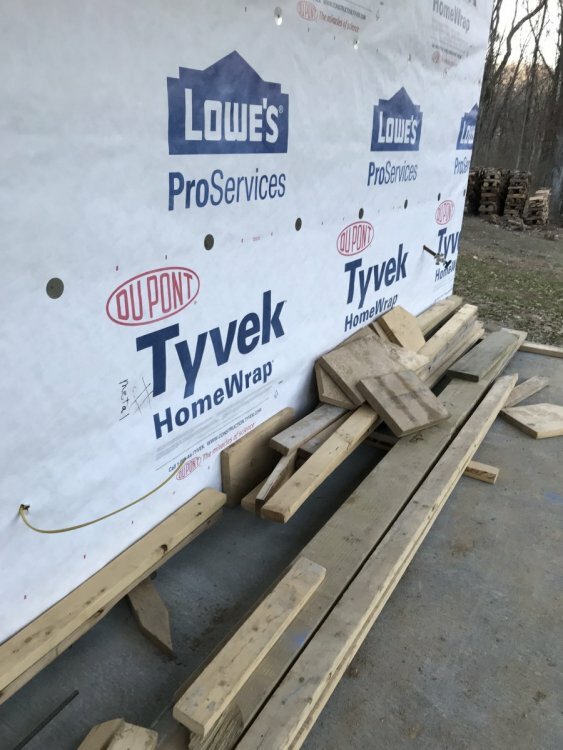 When finished Mke announced "it looks like you'll be building a 24x40 unless you want a deeper cut. 24x40 it will be. Above is the finished cut viewed from our deck. 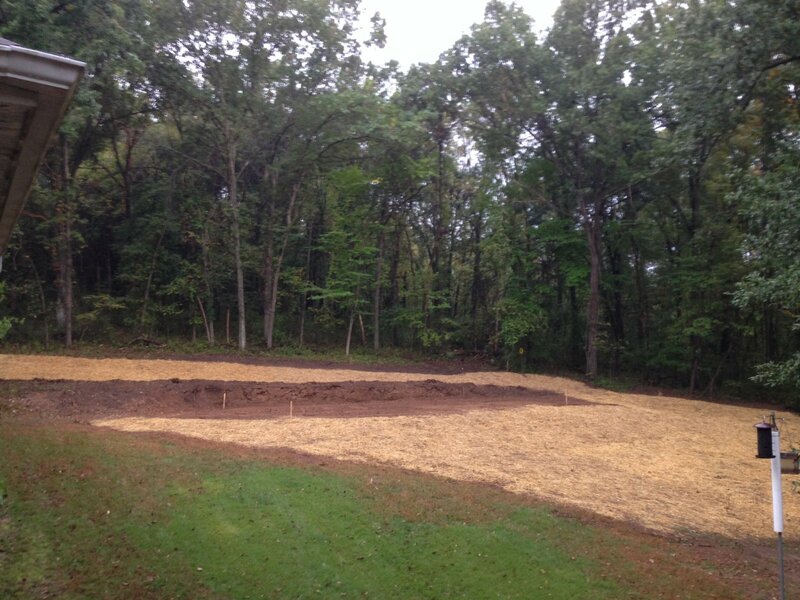 A neighbor & I groomed, sedrd & mulched quickly to get a grass stand to hold the soil. This shot is of a diversion ditch I cleaned out that runs along the hill just above the the garage site. Lots of rain water runs off the hill especially in springtime and it'll be helpful to divert from the garage area. 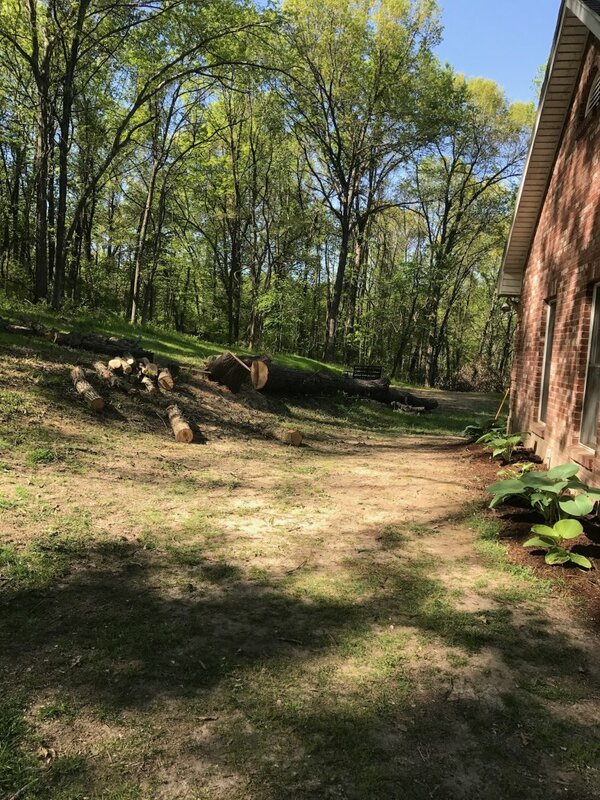 A tree beside our house was removed to make room for a drive. 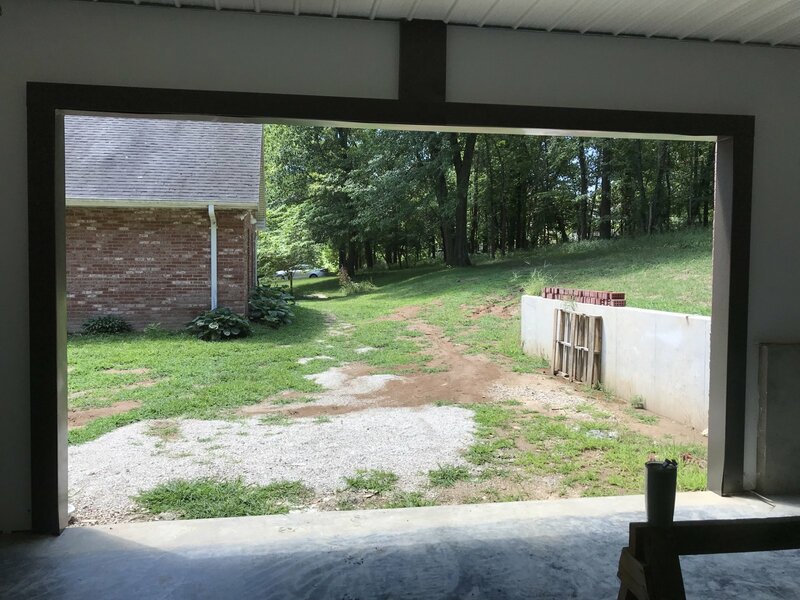 A shot from the site towards our deck and screened-in porch from where I'll take several pictures. Removing part of the tree w/my newly acquired Sovereign 3012 Hydrolift and Agri-Fab Utility 10 Carry-all. 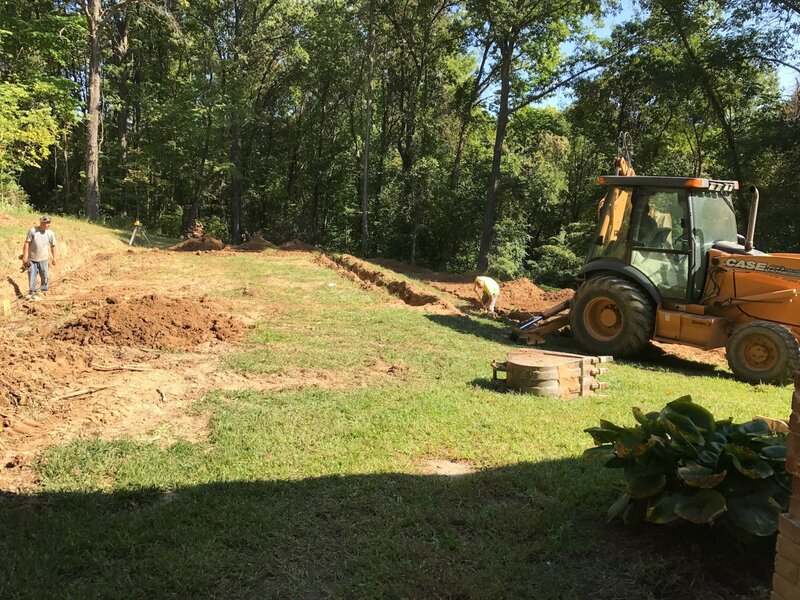 September 13, 2017 my concrete contractor, Greg Rackers and his crew (Grey Stone Foundations) dig and pour footings. 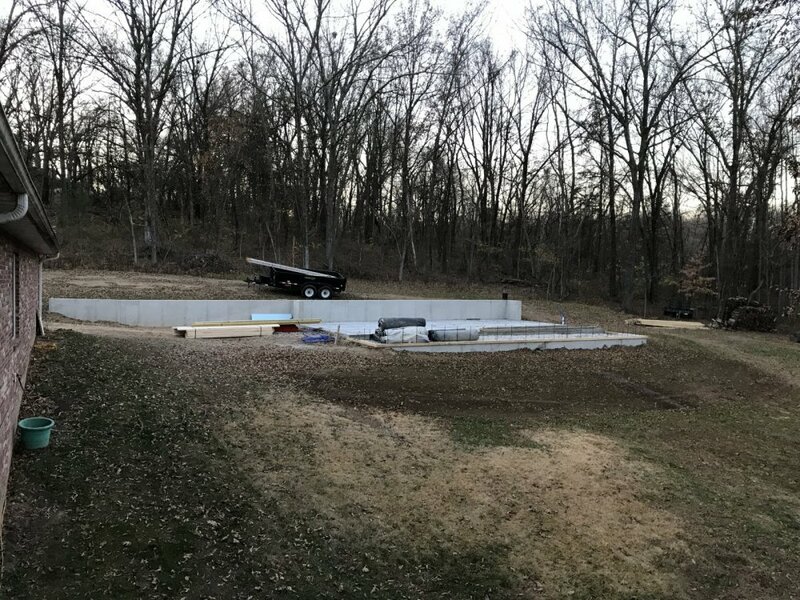 Cole County Industries, Jefferson City supplied the concrete. These drivers can back a huge concrete truck up, around, down and into some tight places. Kudos to their driving and backing skills! 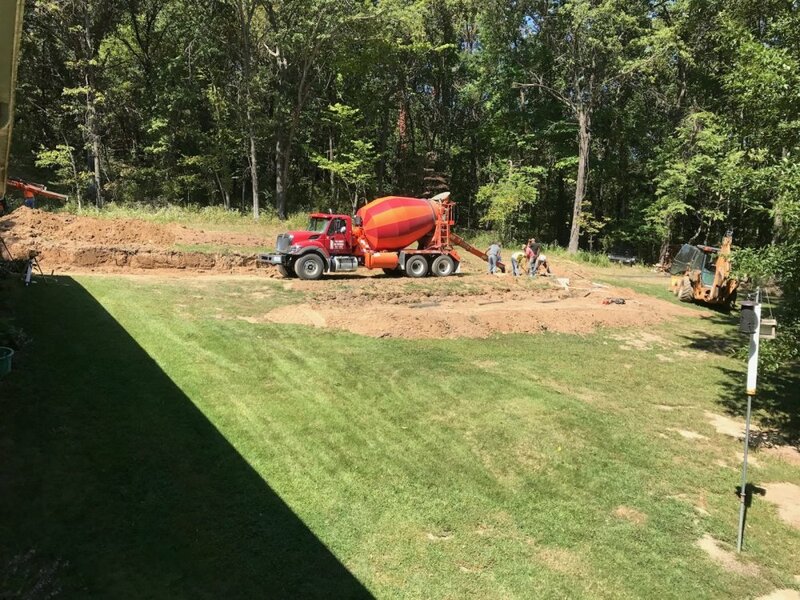 Greg Rackers, Grey Stone Foundations and his crew hard at work. On Sunday September 17, 2017 we received the nicest all day .07” rain you could ask for. On Monday, September 18 a 2” downpour came in 40 minutes. Needless to say I’ve been digging off the footings. Will finish shoveling today (Sept 23) then brush and blow dirt off concrete. Hopefully it doesn’t happen again before walls & floor are poured. I scooped, broomed, and blew off the footing to get as clean as I possible and ready for the concrete retaining walls. 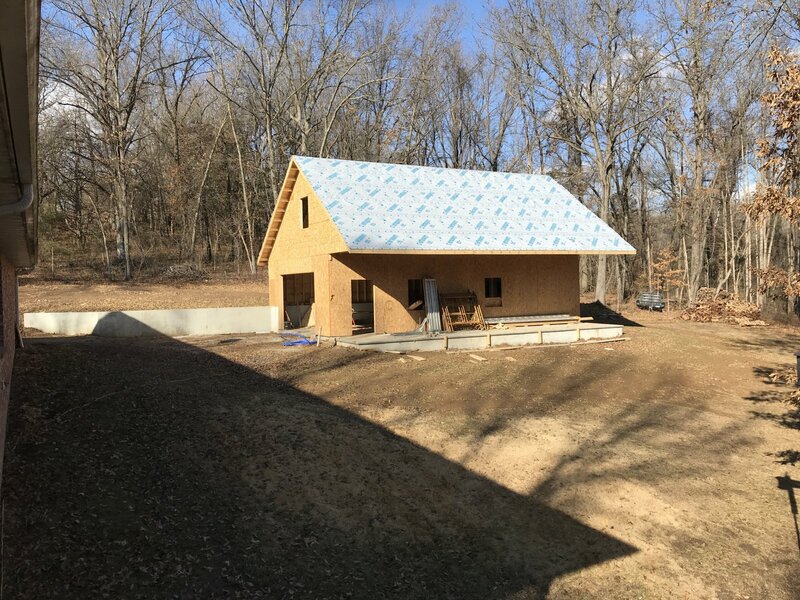 It was two hot and humid Indian Summer days in Missouri and I sweat a ton but it was worth it in the long run. 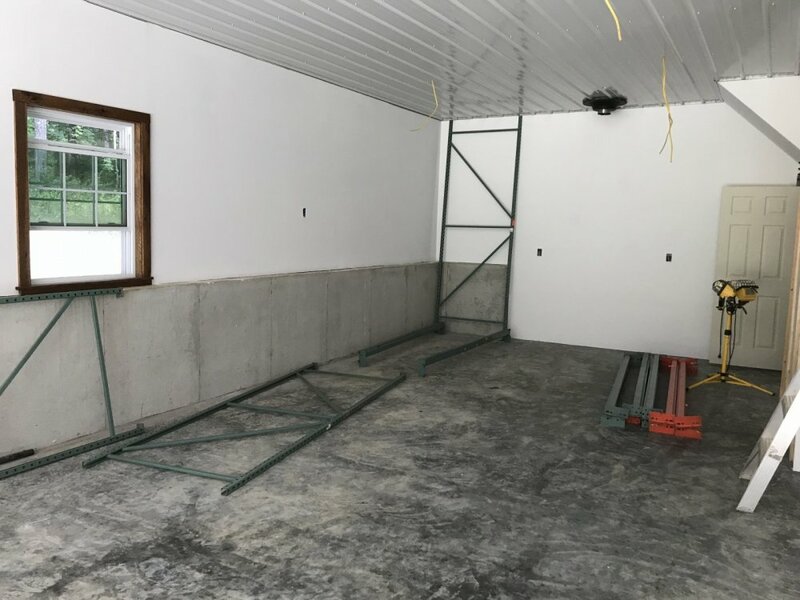 Ready for the concrete crew. Tuesday, September 26, 2017. 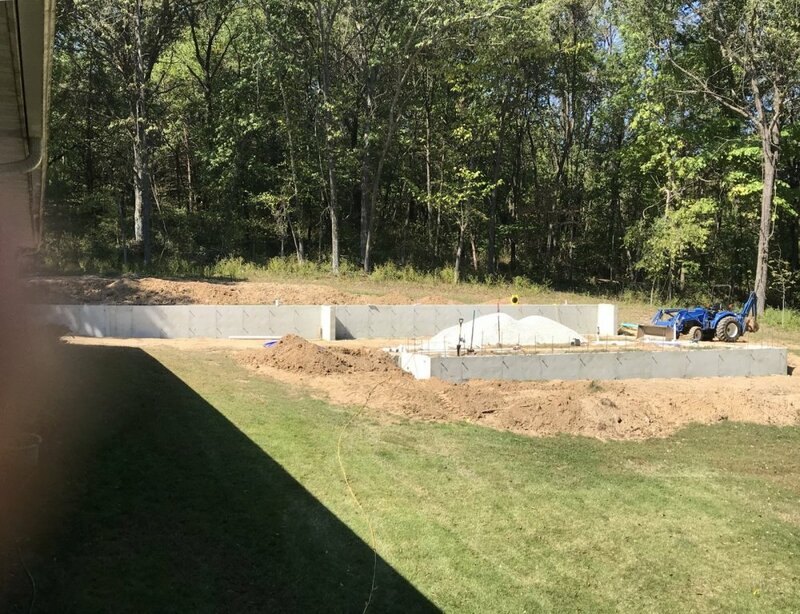 Our concrete construction crew Grey Stone Foundations arrived and began the process of setting forms. 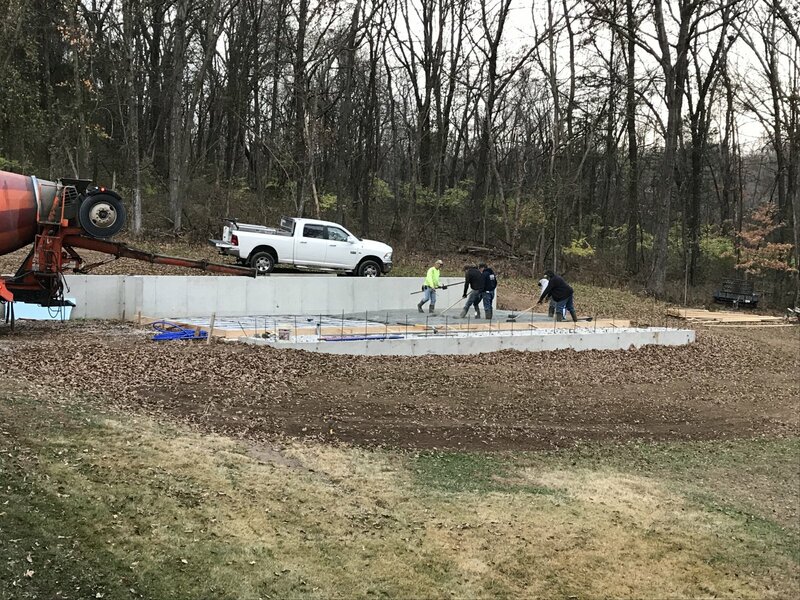 The 4 man crew worked non-stop through the morning and, just as the last of the forming was complete and inspected by the foreman, concrete trucks arrived (early afternoon). Forms removed Wednesday, September 27, 2017. Picture taken facing westward from our deck. 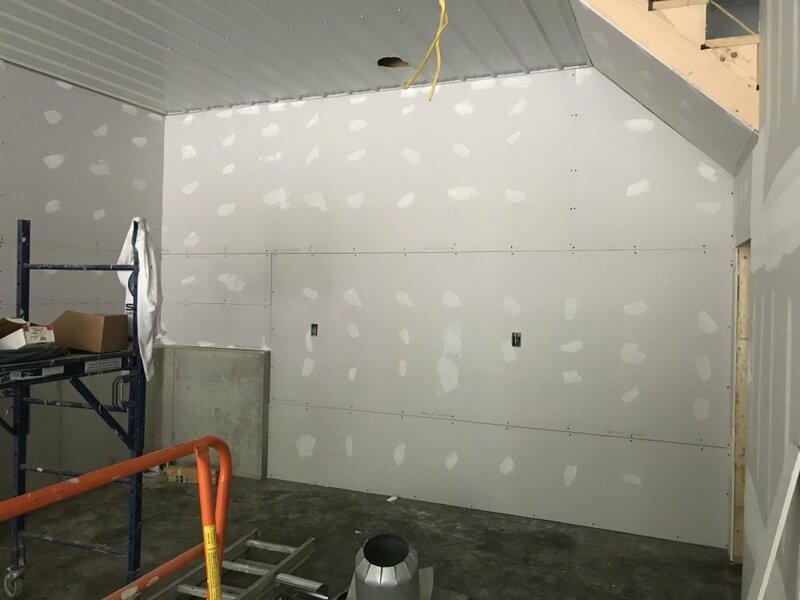 In the foreground is the retaining wall for the floor that will be under the 8' overhang on the east side of the shop. 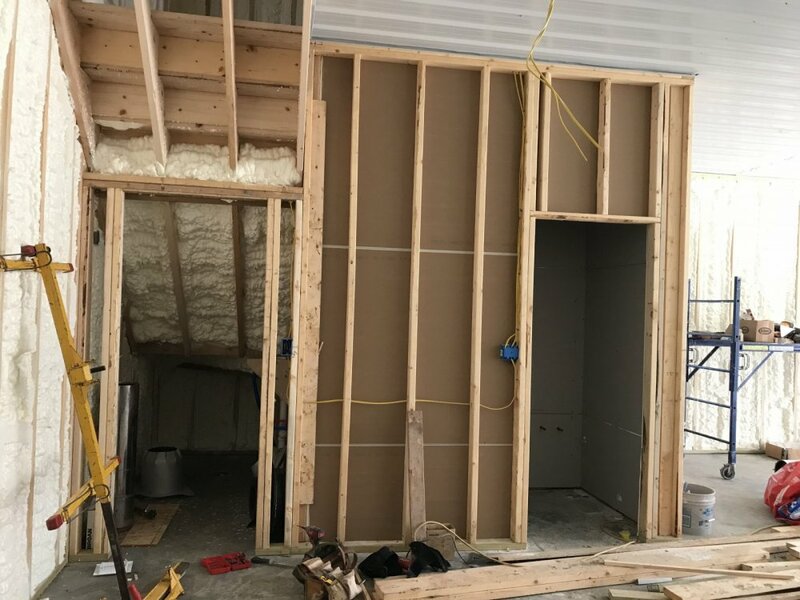 In the background is the 4' retaining west sidewall of the shop and front wing wall. 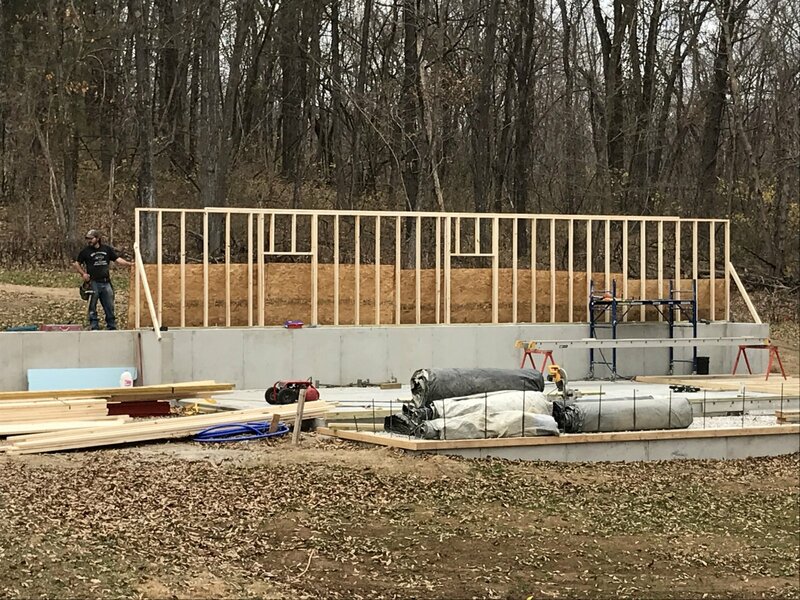 Standing on the west side of our house and facing northward, the wing wall and west sidewall of the shop. 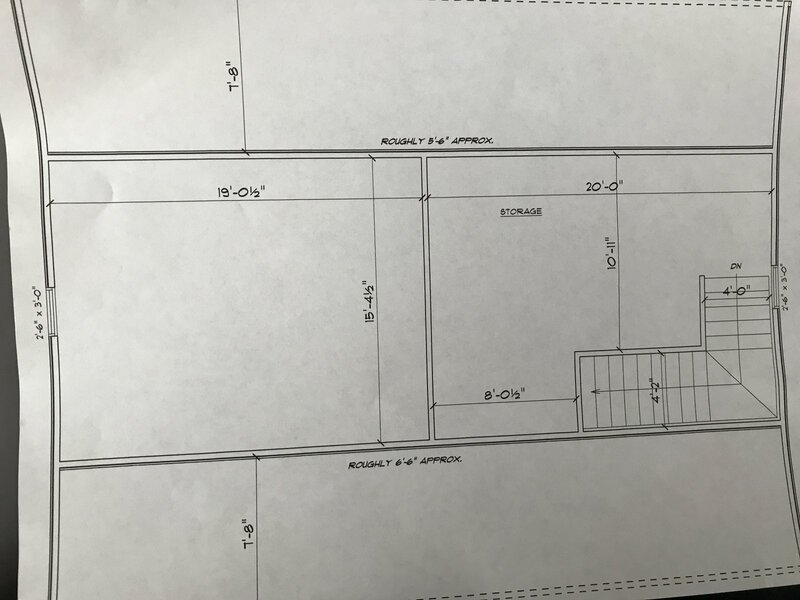 You can also see the 3'x 4' concrete front corner of the shop (southwest) and 3'x4' concrete rear corner (northwest). 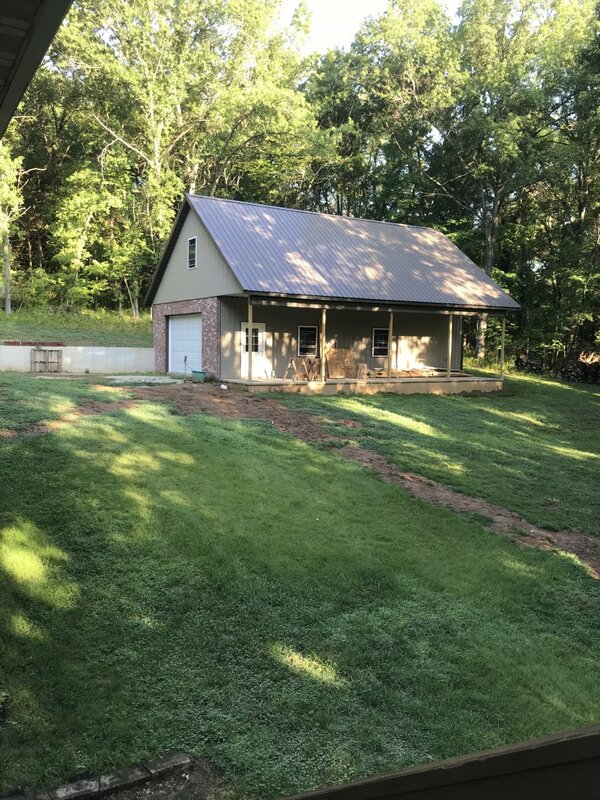 And of course, to the right is the retaining wall for the east side "porch". 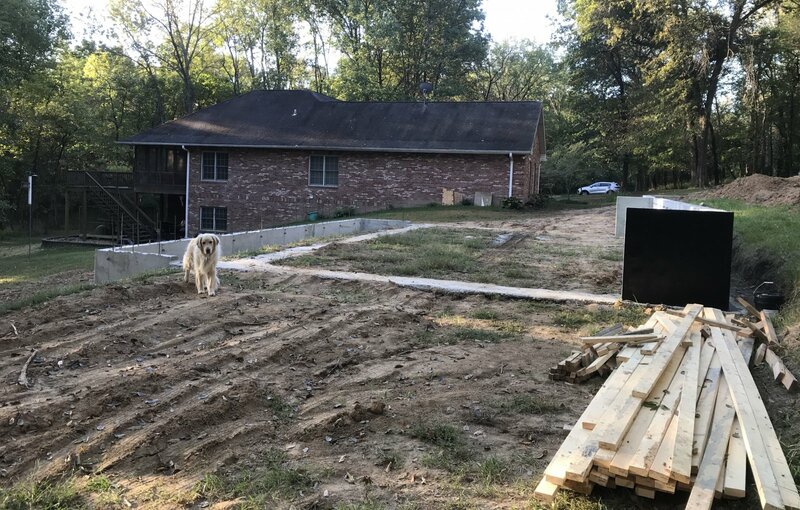 Friday, September 29, 2017: while I was in Bloomington IN at the Executive Committee meeting with Kent Thomas (Kent), Josh Thornton (Talntedmrgreen), and Carl Harcourt (CarlH), my carpenter Dale Feeler coated the sealed the retaining wall. 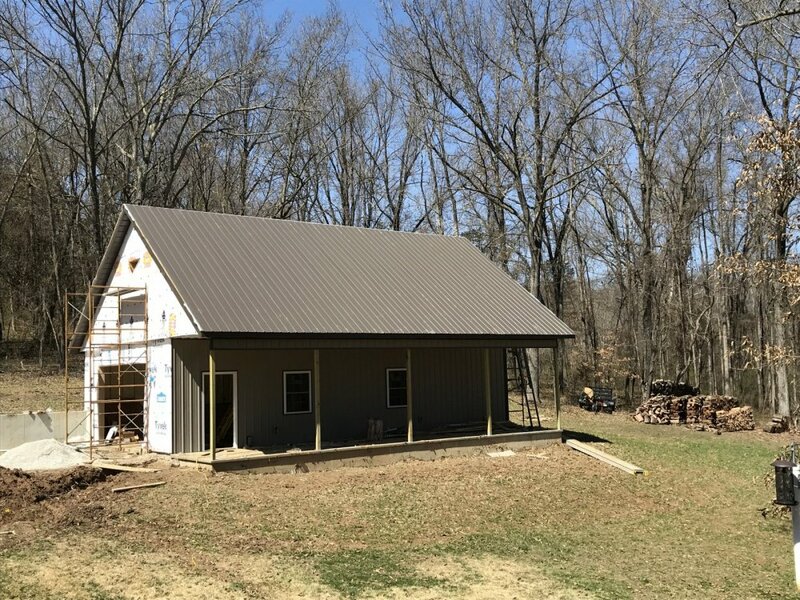 Pictured looking southward from the rear of the building toward the back (north) and side (west) of our house. 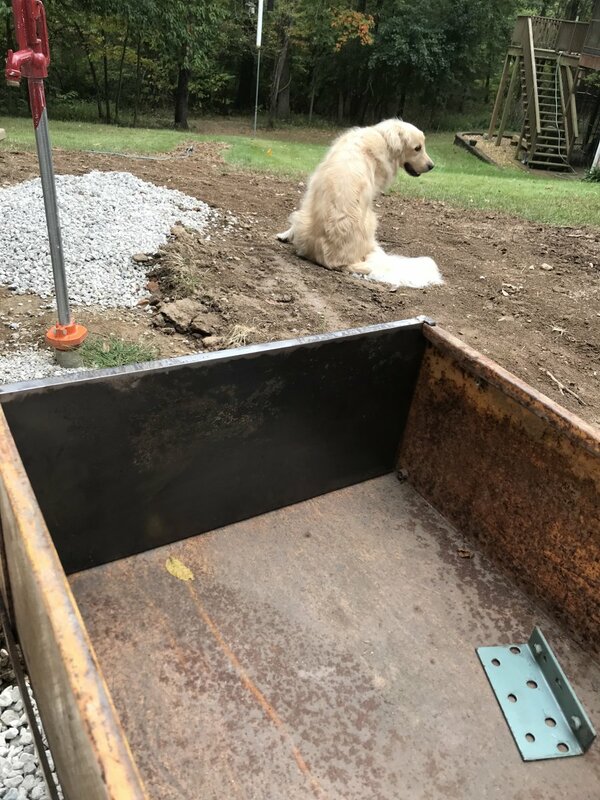 Cooper, our English Cream Golden Retriever surveying the work. From the back northeast side of the shop building site. The topography of our property is shown better here and we are lucky as most Jefferson City construction jobs encounter bedrock. As you can see we are blessed with soil, heavy clay soil that dries hard as a bulls horn! 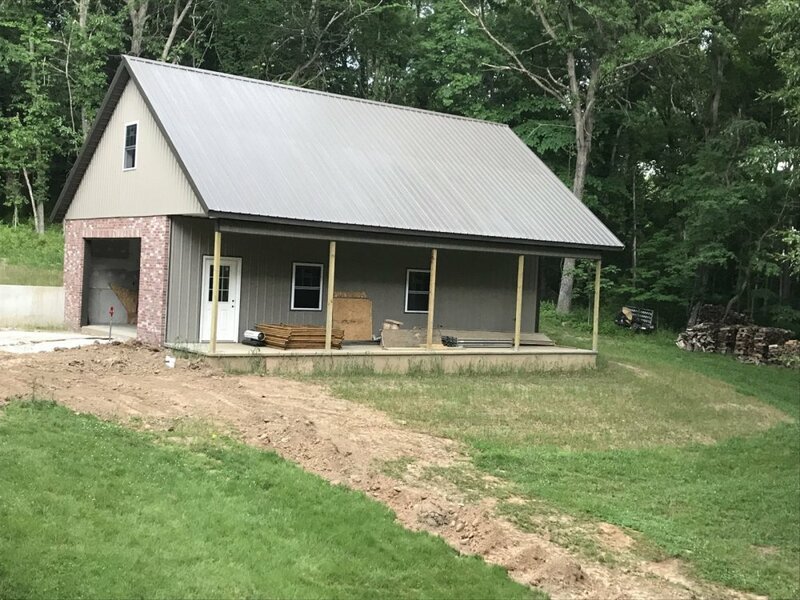 Dale delivered drainage tile that will be laid on top of the footing and next to the outside of the west sidewall, then covered with aggregate. 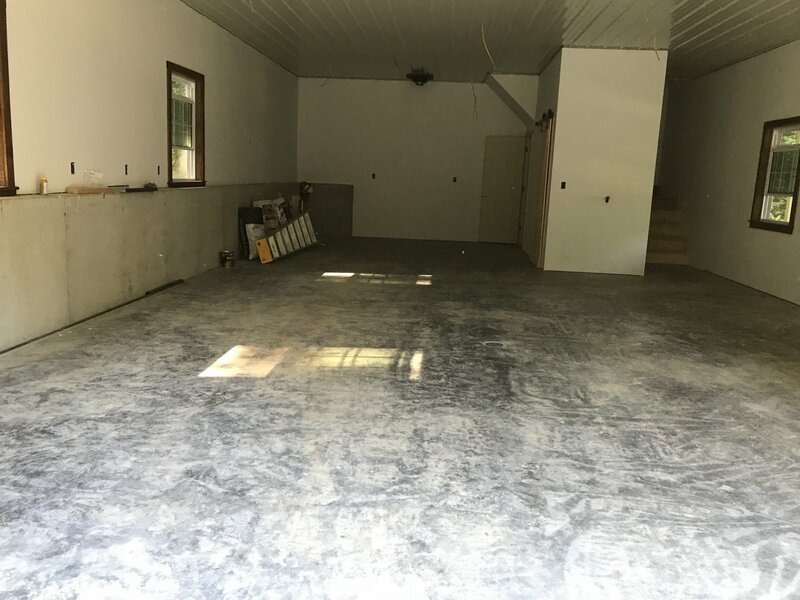 So on Saturday, September 30, 2017: I decided to have a little fun and to get an idea of how much floor space these guys will take. 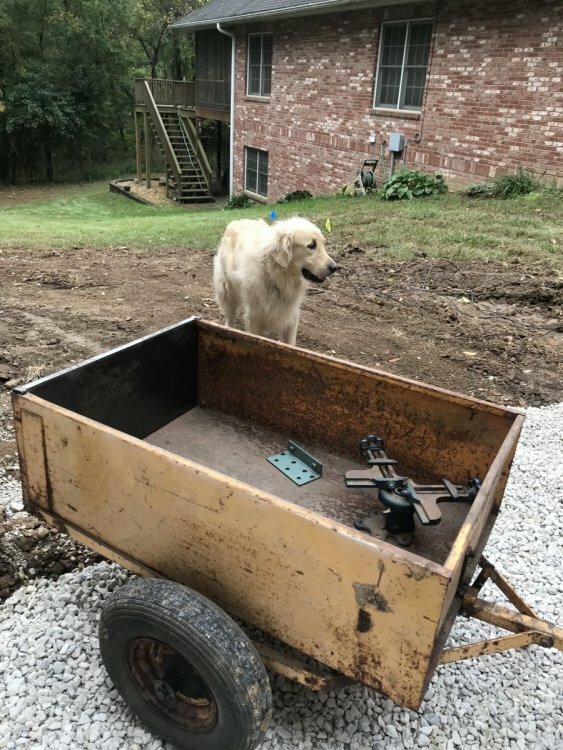 I needed to remove the sickle from the Early B-10 anyway and pallet it for shipment, knock down and smooth some of the dirt around the construction, and mow some grass so this was justifiable... A neighbor showed up during the operation and asked if I wanted to borrow a tarp. 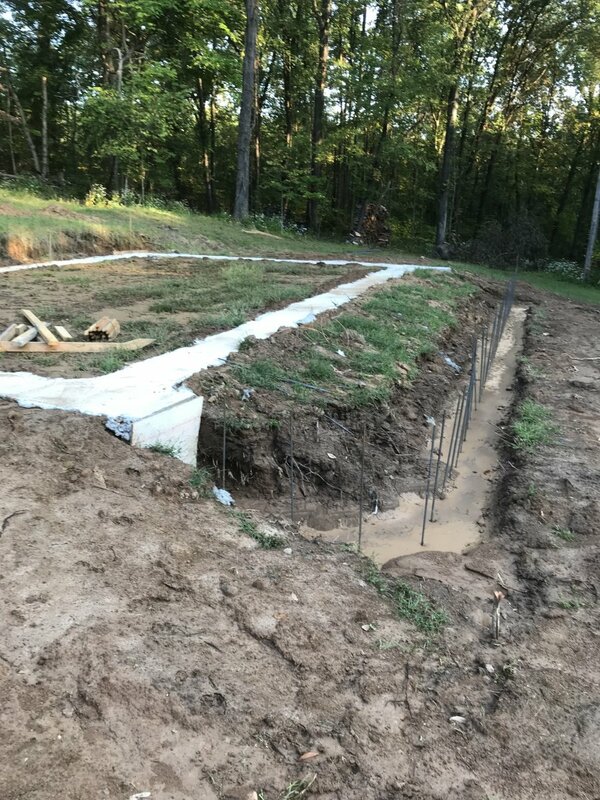 Forecast of rain this brought the Raithel Plumbing in ahead of schedule on Monday, October 2, 2017. Tractor is a 29hp New Holland w/loader and backhoe; amazing what this small machine can accomplish. Jerry Raithel used a tool I'd not seen before: an small electric device that takes the place of a transit. He could readily find the elevation off the floor at any given time by punch of a button. I should've gotten a picture of the $700 piece of technology. Dale also came to insulate and coat again the outside west concrete wall and install the drainage pipe on the foundation of the west wall. Plumbers used the New Holland loader tractor to cover with aggregate before Dale covered with filtration fabric. The rains came on Tuesday evening and have not stopped as of Saturday October 7 collecting 4.05" so far. 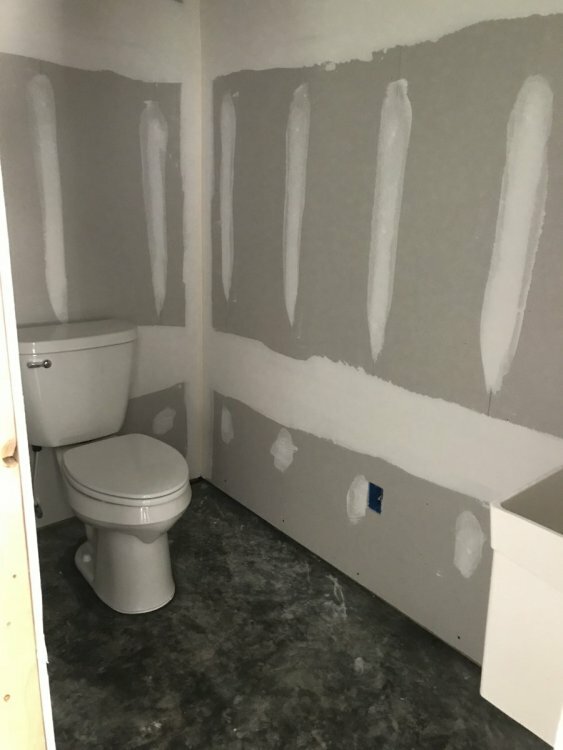 Shop will have a bathroom w/stool and utility sink located next to the stairway to the attic. 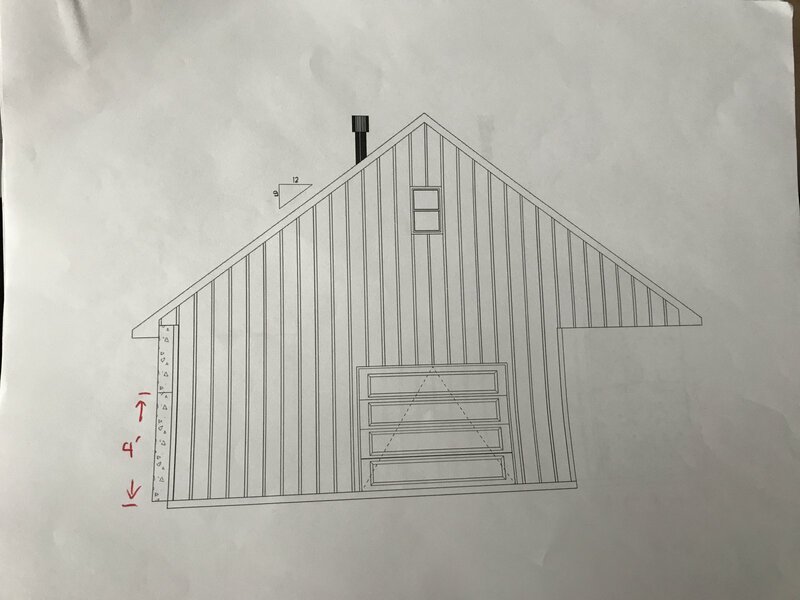 Wood stove on north wall, 14’ garage door & 2 walk-ins. 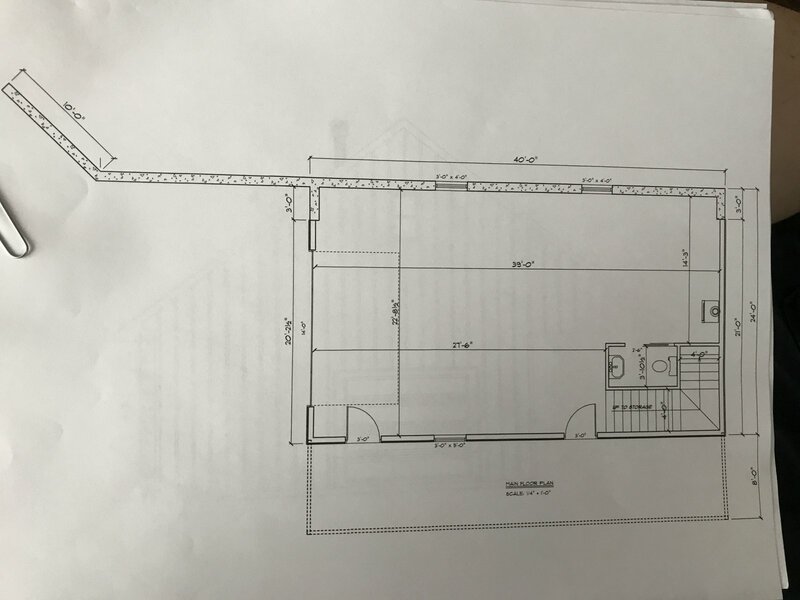 Have decided on scissor trusses in front 1/2 to allow more vertical workroom area. 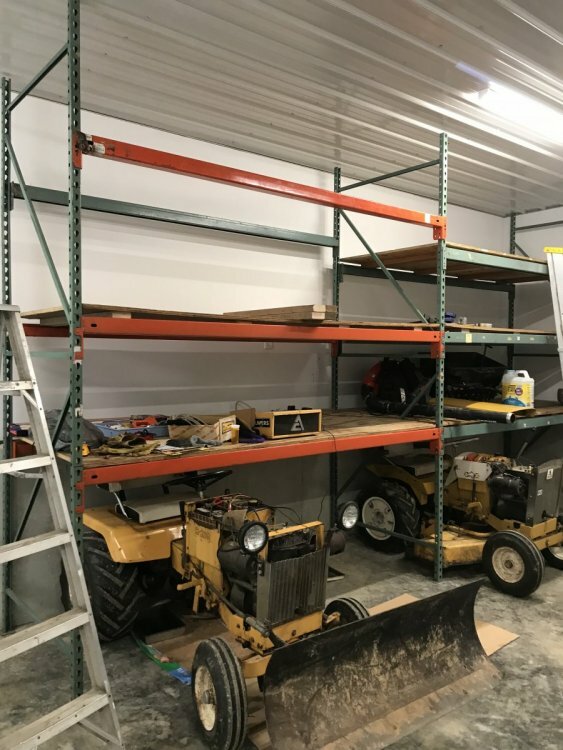 20’ of upstairs storage should be enough and, I’ve found a person fills up whatever storage they have so I decided to limit that for me (and Linda). A rough idea of the front (south facing) view. 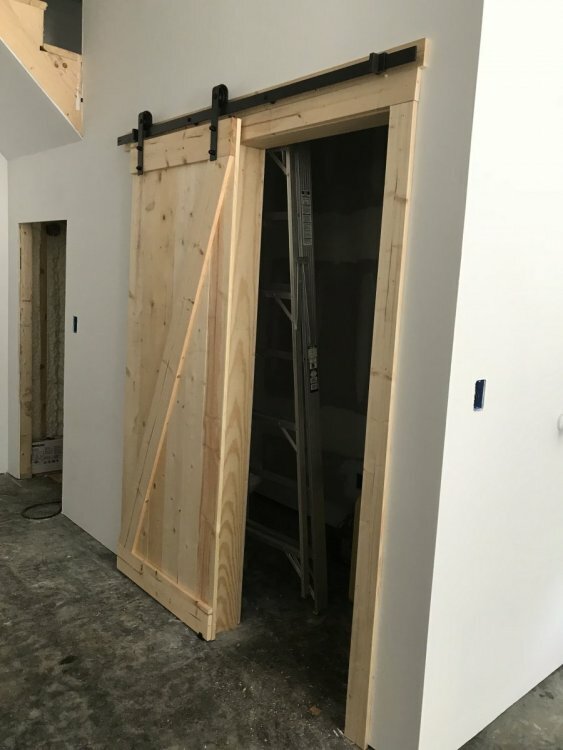 Overhead door will be significantly larger than it appears. October 14, 2017: we've made no progress w/exception of me scooping dirt from the footings that washed in w/the rains. 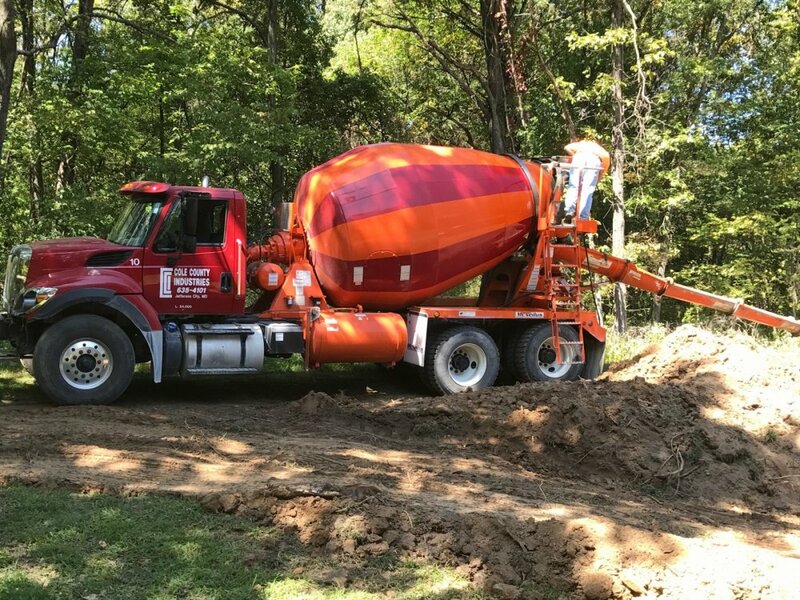 It's been dry this week and warm for October, but not warm enough dry the dirt to get cement trucks into the job site. Today, a cold front is scheduled in that may bring more rain. October 27, 2017: today is windy, overcast skies temp in the low 40s. Dirt is working nicely for Mike Schneiders. He backfilled w/dirt from excavation and gravel hauled in by his brother Ron. My contractor is on huricane mission work duty in Houston, Texas this week and he will be pleased we've progressed. October 28, 2017: I finished replacing the starter/generator and hydrolift belts and throttle cable on the 3012. 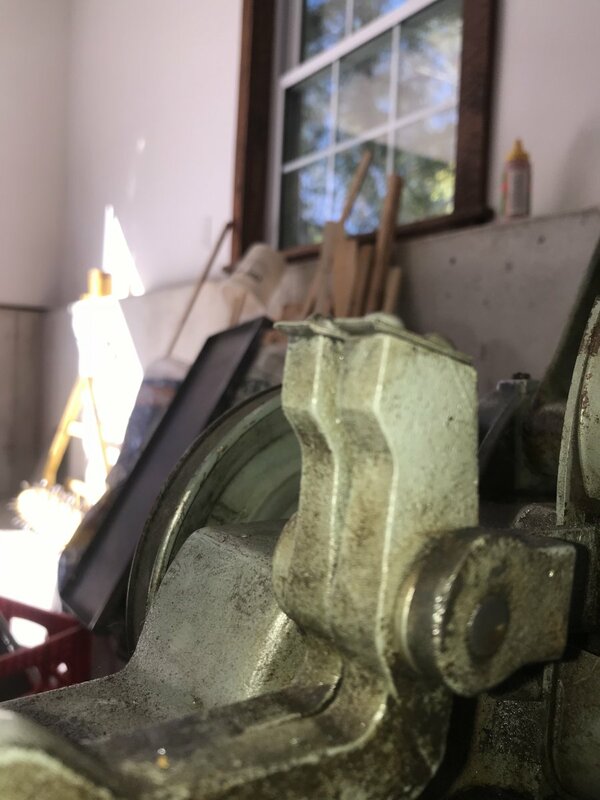 The original pull/twist throttle had been replaced by a simple lever off a lawn mower at some point and earlier this week while bringing in wood the cable broke. I found a throttle lever and cable from a AC 712 on the parts shelf. I like these and have converted several flat hoods, however the 712 cable was too short so I opted for a cheap choke cable from O'Reilley for now. 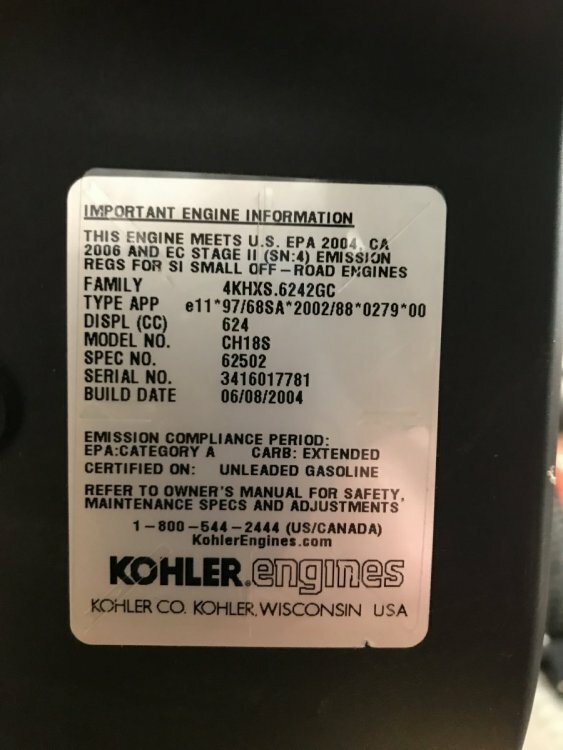 I also replaced the badly worn starter/gen belt and found the O'Reilly cross over to be too short and $2 higher than the correct (2)157524(sm) from the Simplicity dealer. Hitched the Brinly disc I got from Howard Tews (aka HTews) several yrs ago, worked the soil around the building site, and sewed wheat for a cover. Tuesday, November 21, 2017: concrete floor pour. Thursday, November 30: Lumber delivered for framing. 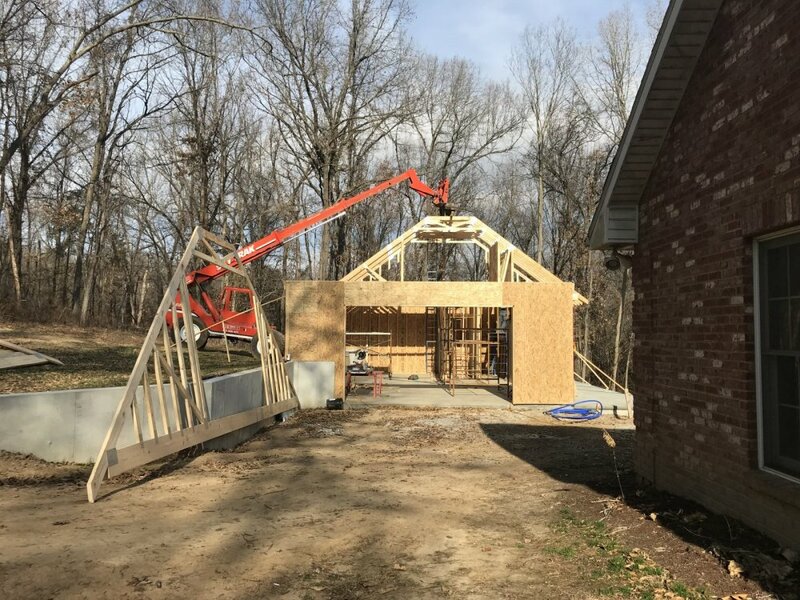 Monday, December 4, 2017 While I attended the Missouri Farm Bureau Annual Conference with Missouri Department of Agriculture Director Chris Chinn, look what was happening at home. 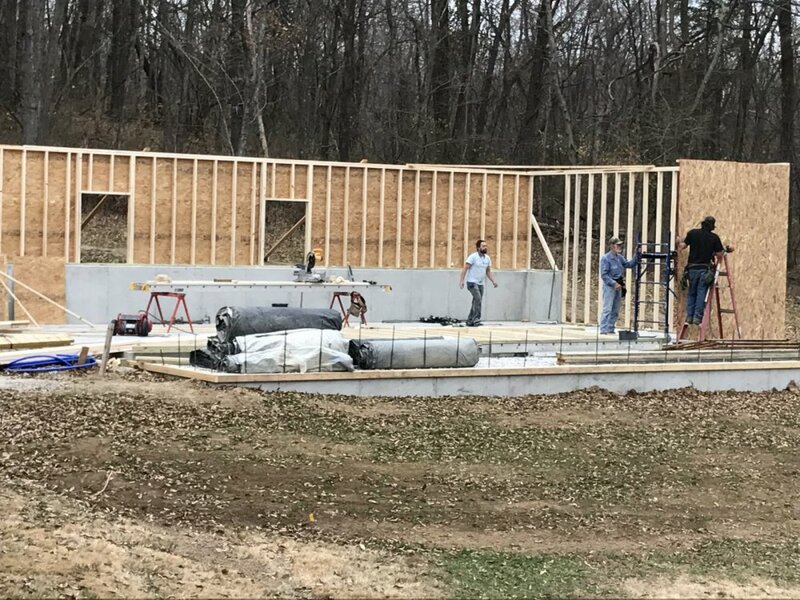 Linda text these two pictures of the crew framing. You'll probably pick up some revisions made. 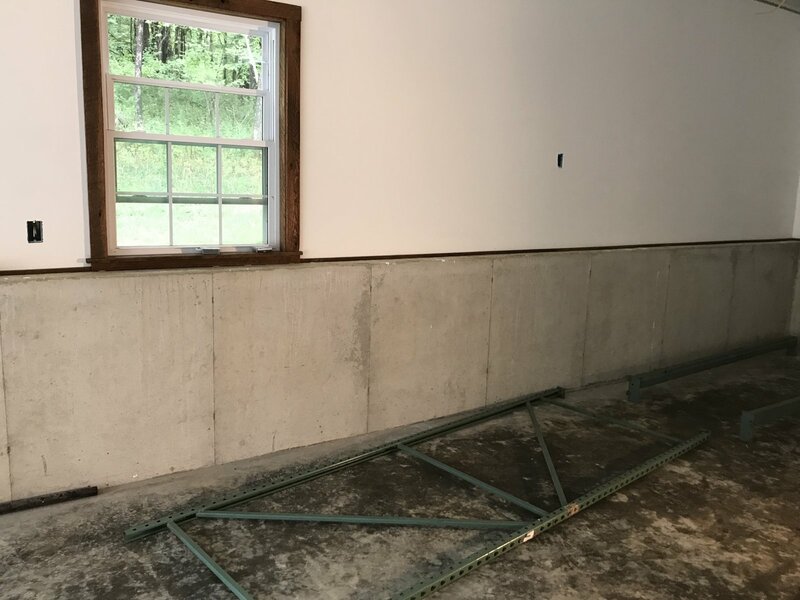 6' framed stud wall on top of the 4'concrete (west) wall. When I came home from work last night, December 5, 2017 the cement porch had been poured and finished and all walls up. The temperature was to drop to low 30s and the blankets were laying there, so I texted Greg to see if he cared if I covered. I guess the crew was supposed to do that but instead, Linda and I did that at about 7:30p. The structure looks big right now. Guess it's the 10' walls that make it appear that way. 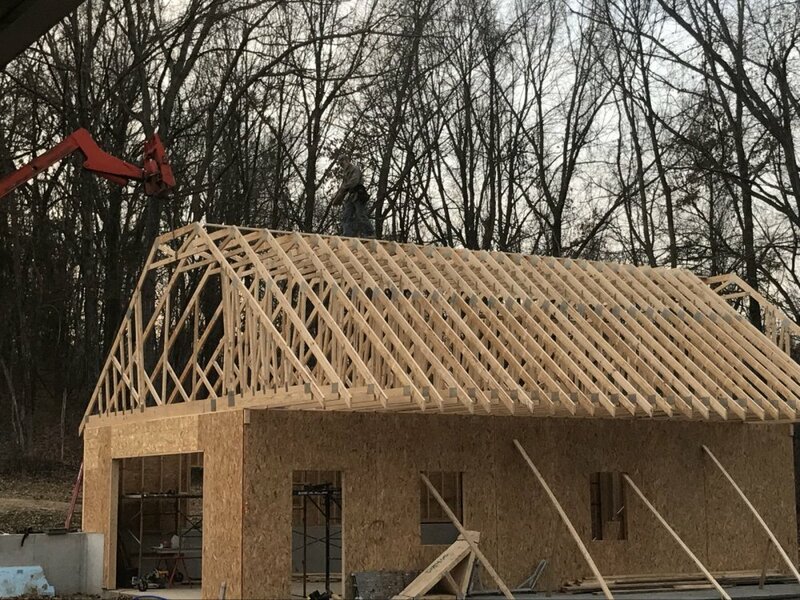 Trusses arrived a day early on December 20. And were set on December 21 rather than after Christmas as earlier scheduled. Trusses weighed 300#+ so a boom truck was brought in to do the heavy lifting. 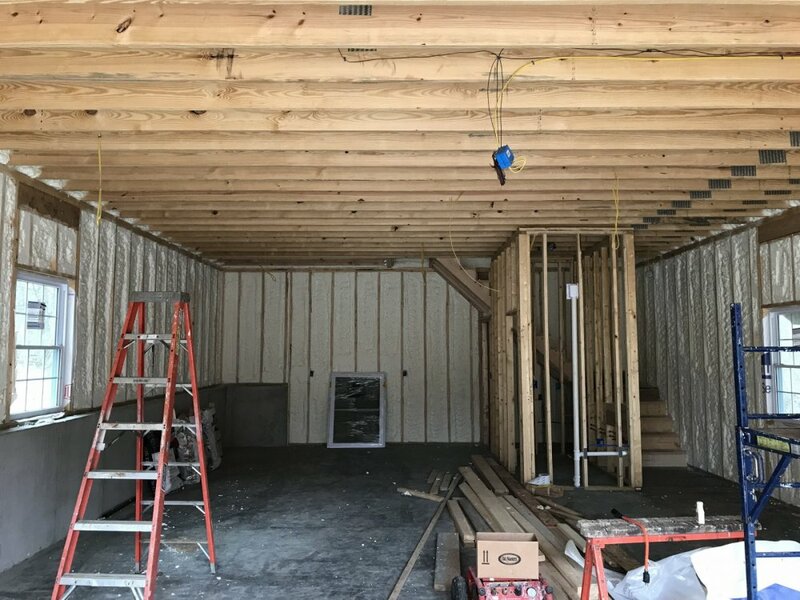 Starting to take shape and I am beginning to get a visual of what it will be. 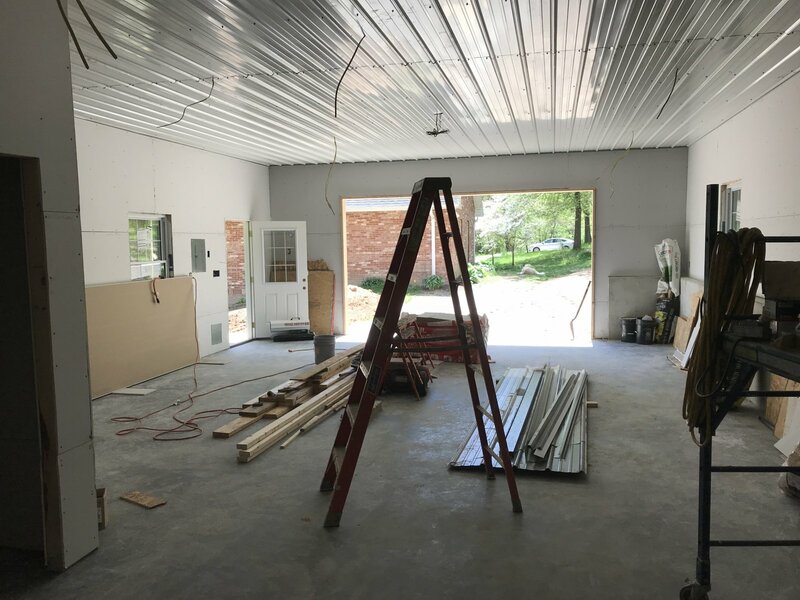 The next 2 pics are from the shop door on the southeast side looking to the northwest corner. 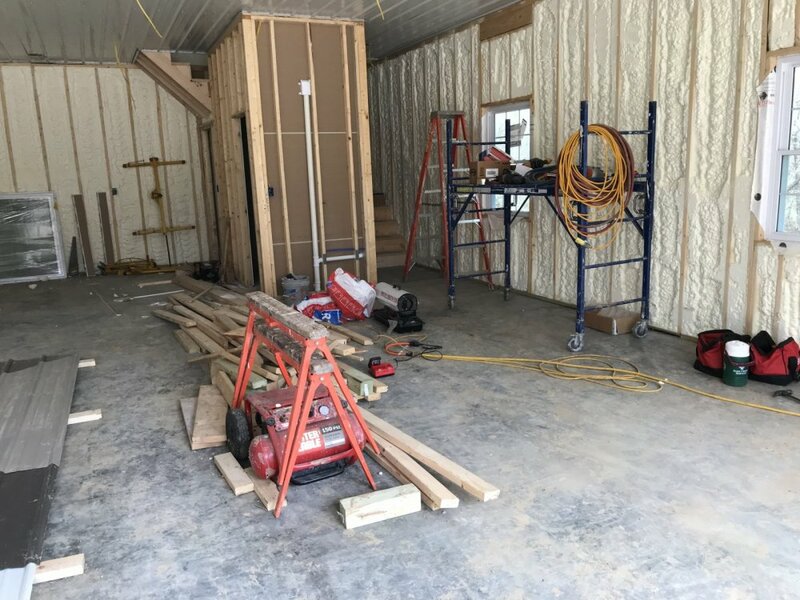 From the walk-in door looking west. 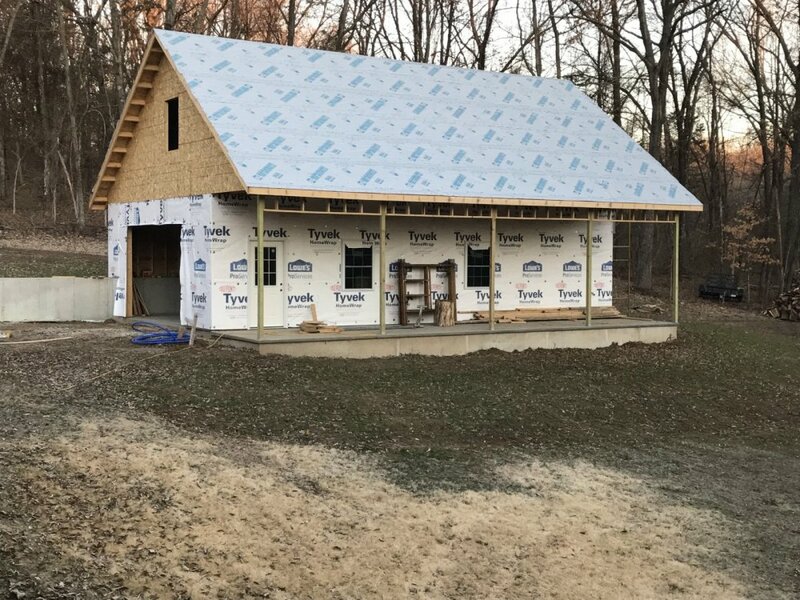 Trusses w/tiptops on and a view of the porch. Progress is slow. Missouri winter weather has caused some delays. 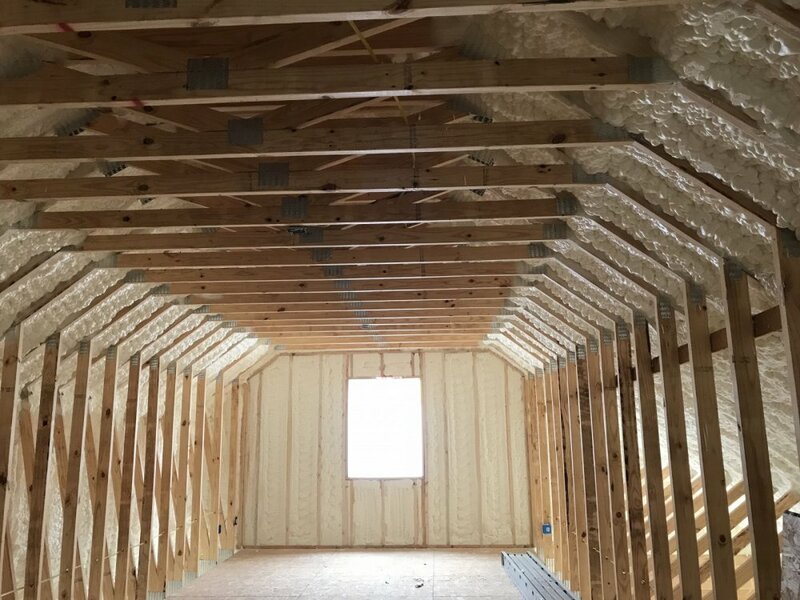 Fully boxed in and 1/2 the roof has decking. 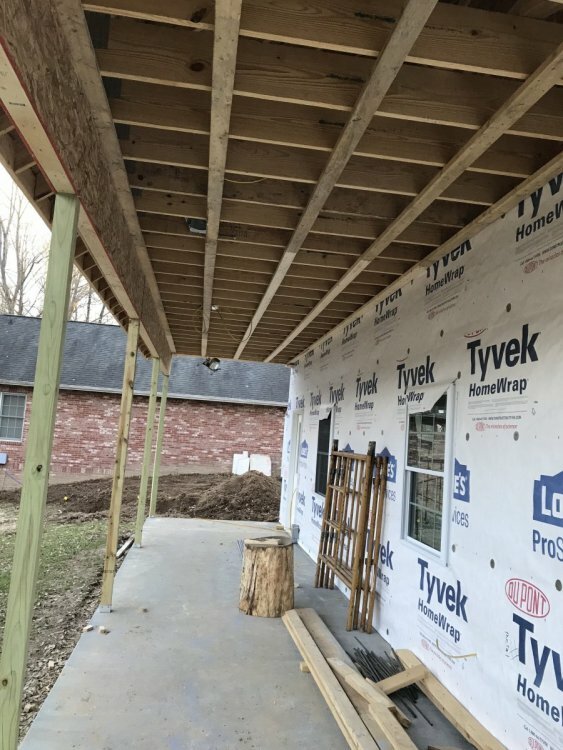 Crew worked to get the roof decking on 1 side and covered w/Titanium before a winter storm is supposed to come through. Prediction of freezing rain and zero temps. Titanium overlay is touted to shed rain for up to 6 months and not curl like felt. 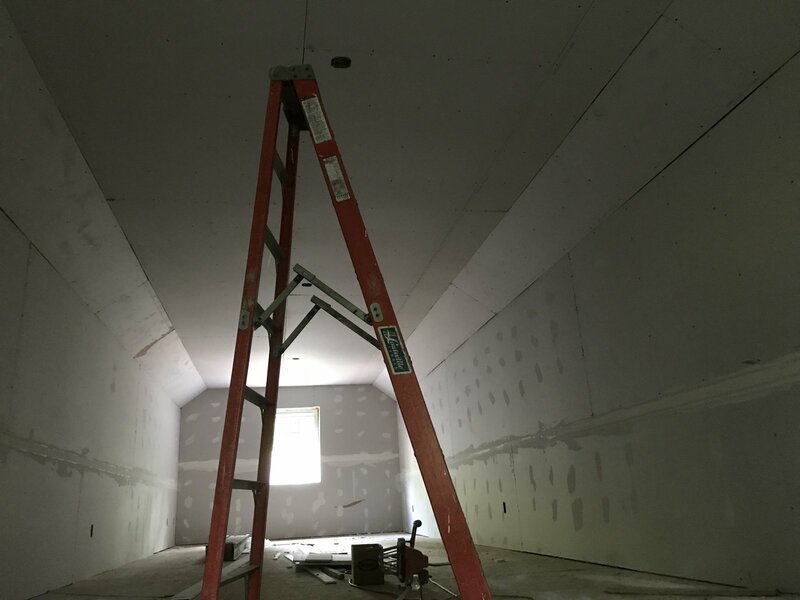 4' steps will allow a wide load to navigate the stairway for those big storage needs. A look at the upper room. Picture taken from the steps southward toward our house. 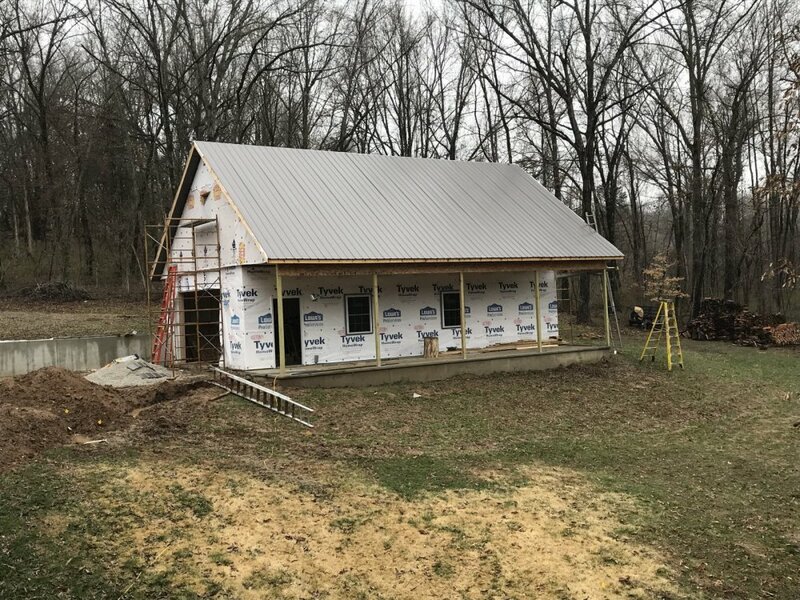 Roof sheeted & covered, windows ordered, ready for foam insulation & outside wrap. March 2 photo below. 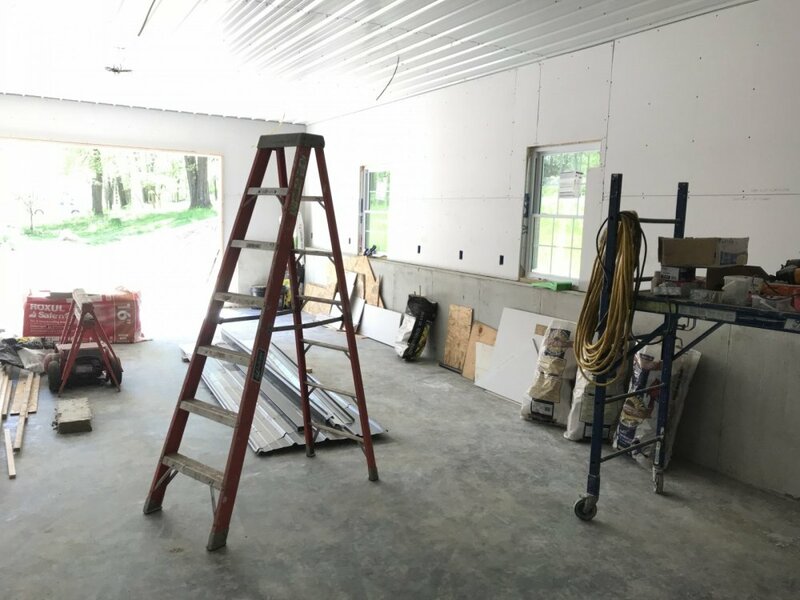 Windows & walk-in door in about 2 weeks ago. 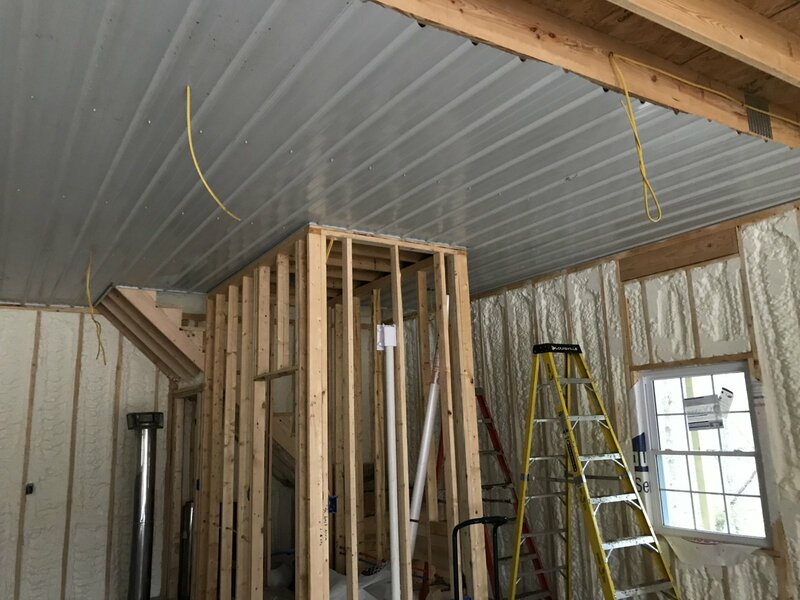 March 6: electricians began wiring and finished bldg work on March 7, 2018. Dale dug in the water line and electric from the house. 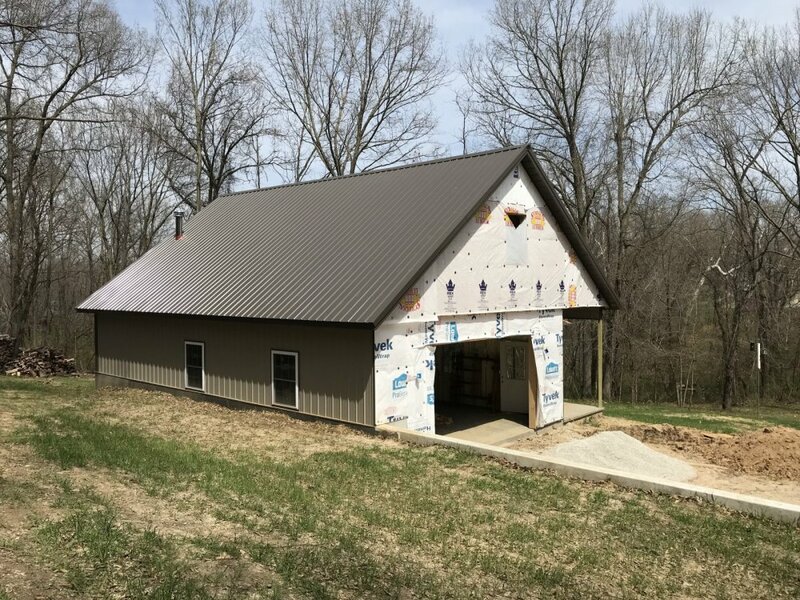 And, I contracted to have the roof and 3 sides metal installed late March. Sometimes communication just doesn't come easy. 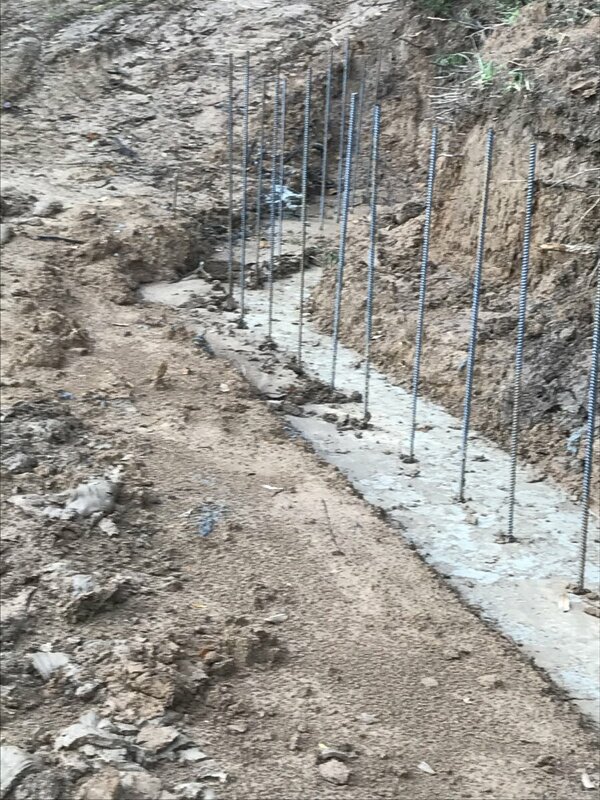 When I instructed the contractors that I wanted conduit imbedded in cement to bring electricity into the building they heard it. 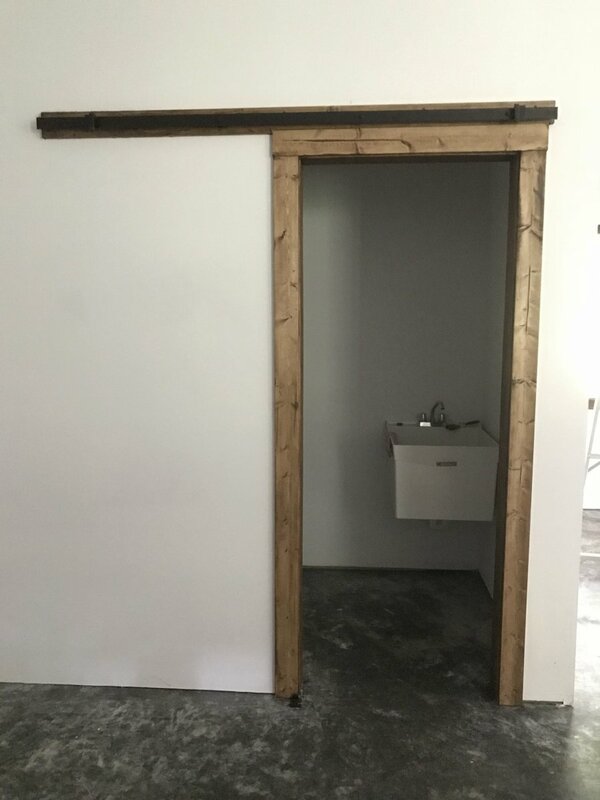 However the conduit was placed on the outside wall and beside the walk-in door. So now I have a box on the outside and this on the inside to get electrical service to my breaker box. All will be hidden inside however a little extra expense. Although not far from the house I wanted a simple bathroom out here w/a urinal and a utility sink. Linda put the kibosh on a urinal so a stool sits here. And the utility sink here. Next challenge, no room to swing a door into the bathroom w/o hitting the sink. Solution: we will be modern and have a sliding bathroom door in this shop! 2 electrical outlets on the porch and a frost-free hydrant. 4 canned neon lights out here and a white metal ceiling. 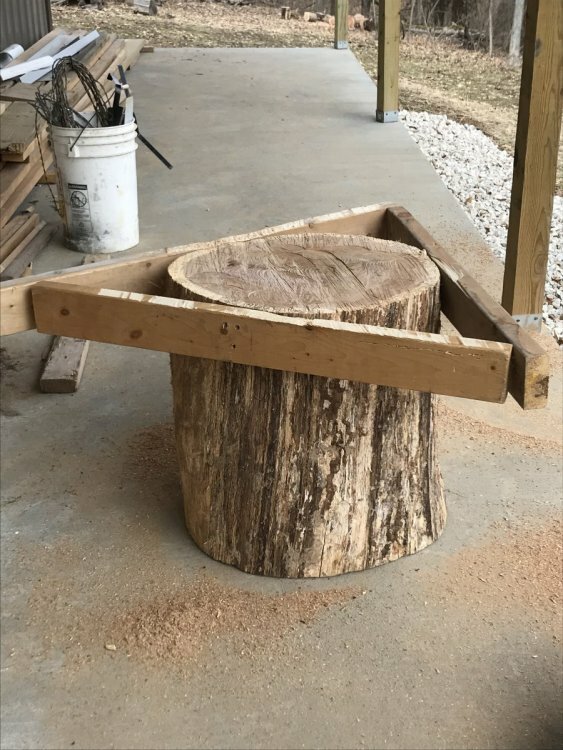 The stump is for the anvil (I'll cut it to correct height). From shop door toward north wall. The foam really brightens it. 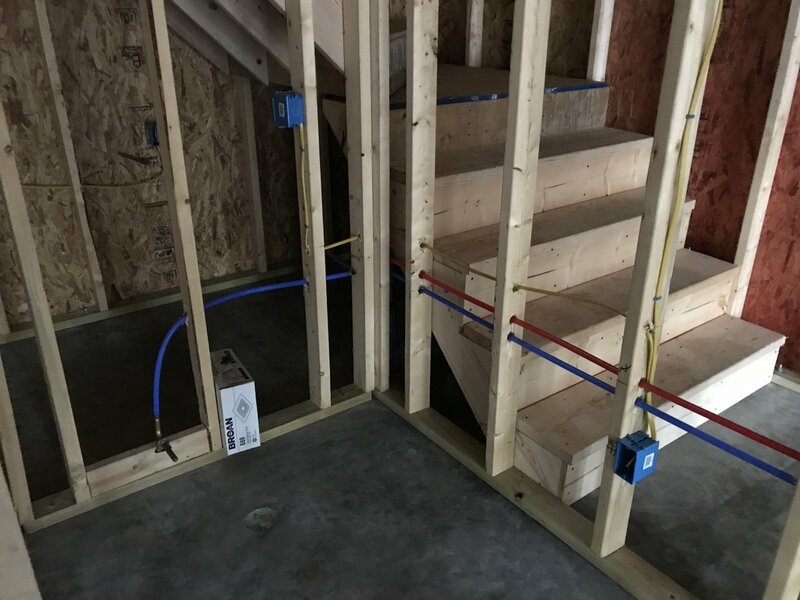 I had them foam the stairs/risers in the utility room/area behind the bathroom and under stairs where the water heater will be. Will also install a H20 shutoff in our basement. 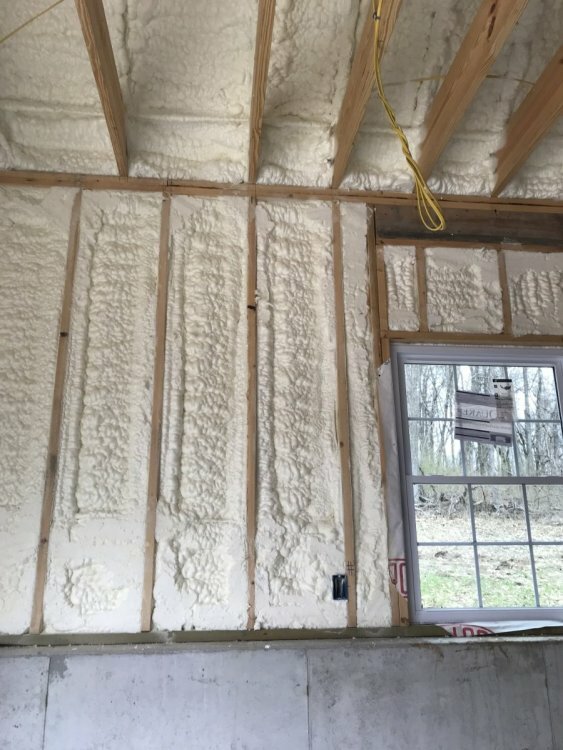 Foam in the upper room. Picture taken from stairway toward the south wall. Standing at the south window in the loft facing west and downward. 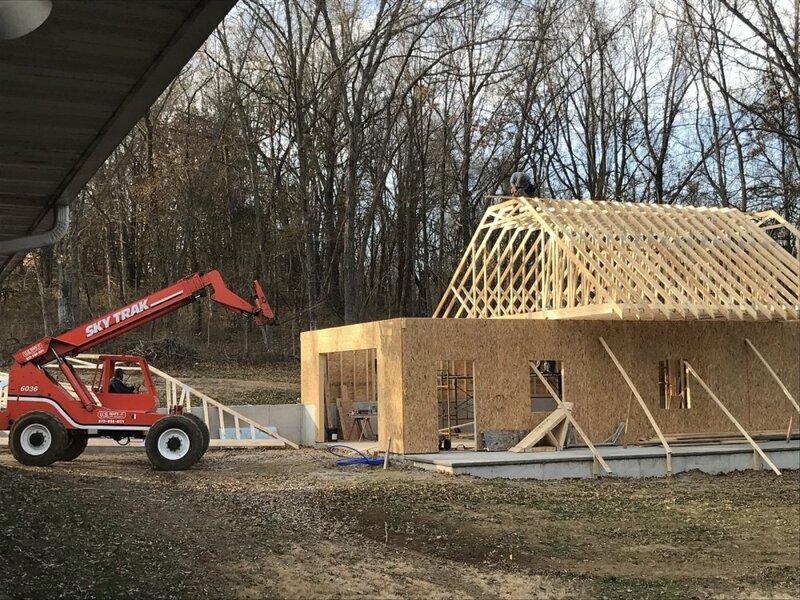 Caleb Zimmerman (A-1 Construction) and his crew from High Point, MO. 2018 Spring is cold, many days in 30* w/wind, snow and rain. Caught this picture of the crew unloading on the best day they worked. From this day forward they worked in rain, sleet, snow and mud. They had to catch the nicest of part of the days to do the high work. March 29, 2018 - Finally a little sunshine for a decent picture. 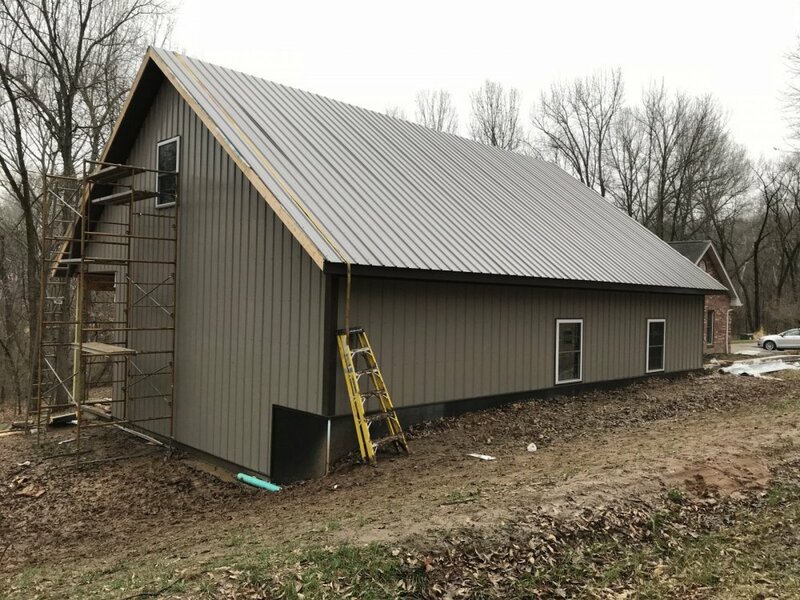 North and west sides show the all metal exterior look. Those side windows are exact mower hight so this may be interesting..
Left the front for Linda. She wants the shop to look good with the house. 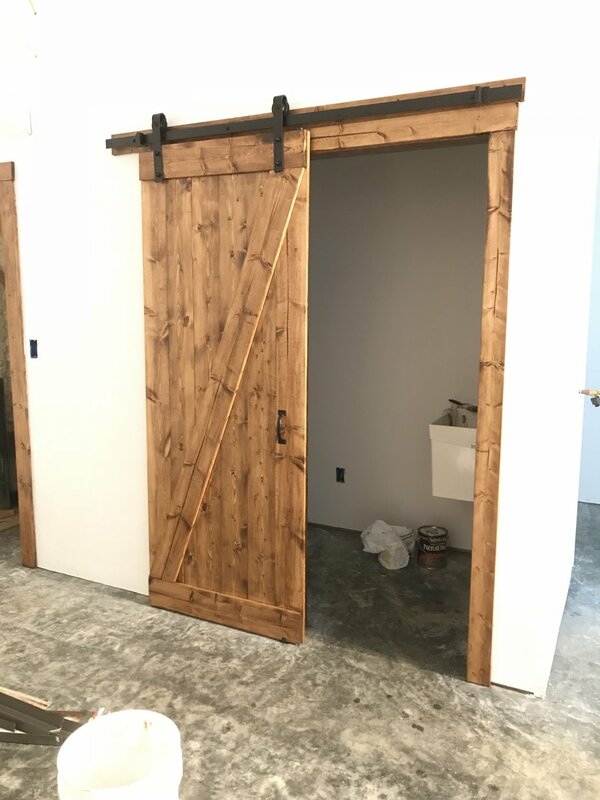 Initially the porch was for storage..7' trailer, wood, etc. Now looks like a great place for bbq grills, lawn chairs, and some maybe some dry wood. 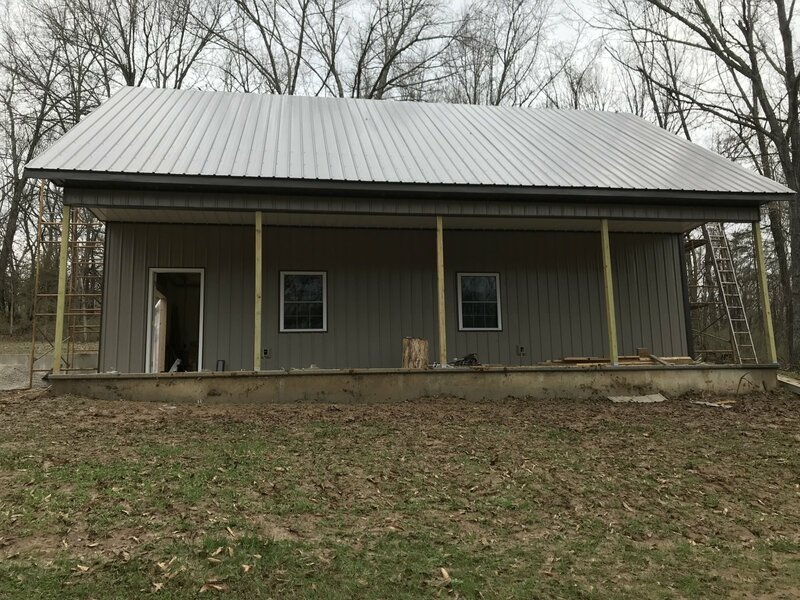 April 4, 2018 Metal workers finished and pulled out. 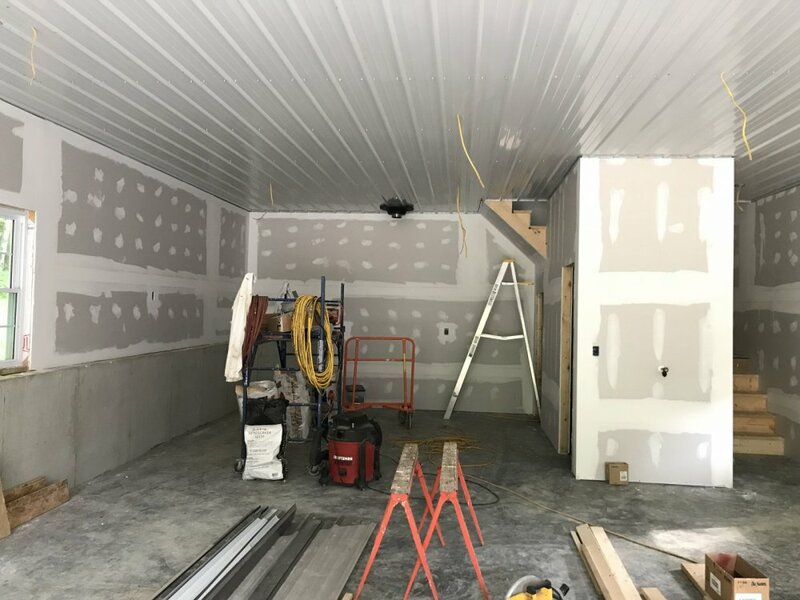 April 9, 2018 Drywall on bathroom begins the downstairs finish. 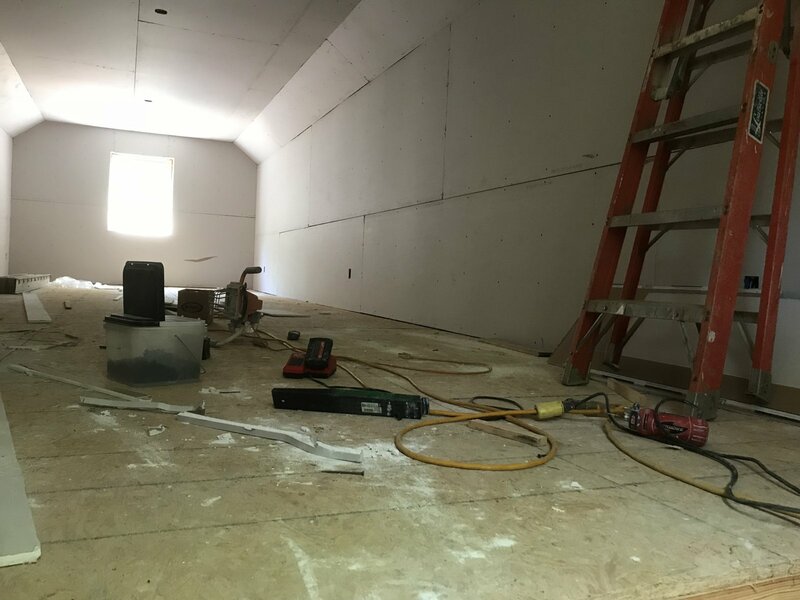 Dale Feeler, my general contractor and friend along with another friend, Bob Bell are my drywall crew. 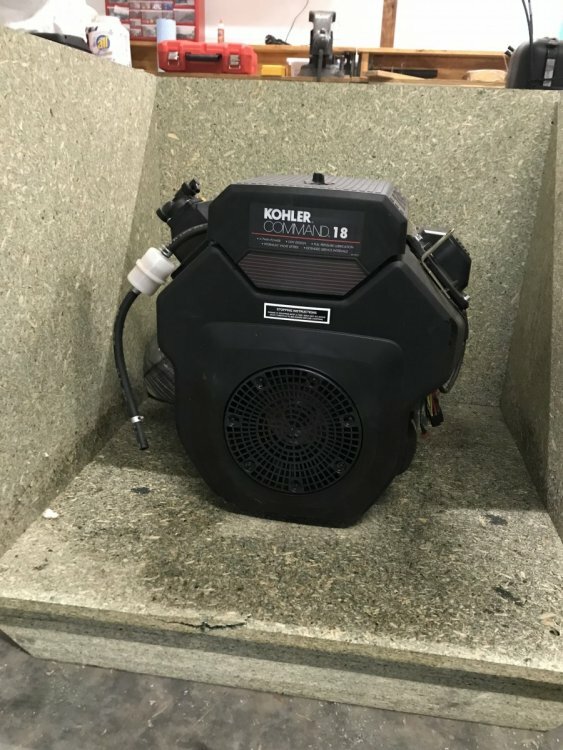 City inspectors approved a wall vent for the bathroom drains. 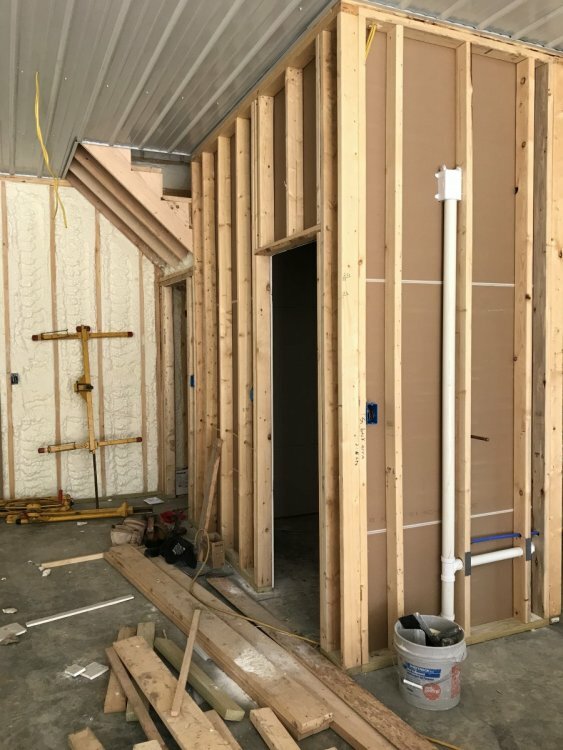 A look into the utility cubby under the stairwell and the bathroom. This picture taken on April 9, 2018 at noon. 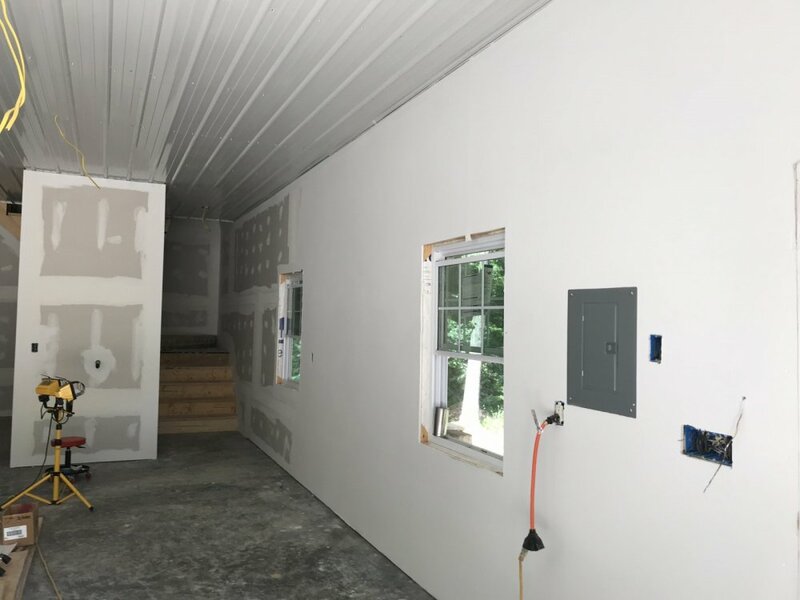 It was a partly cloudy day in Central MO but with the white ceiling and white foam brighten the shop. 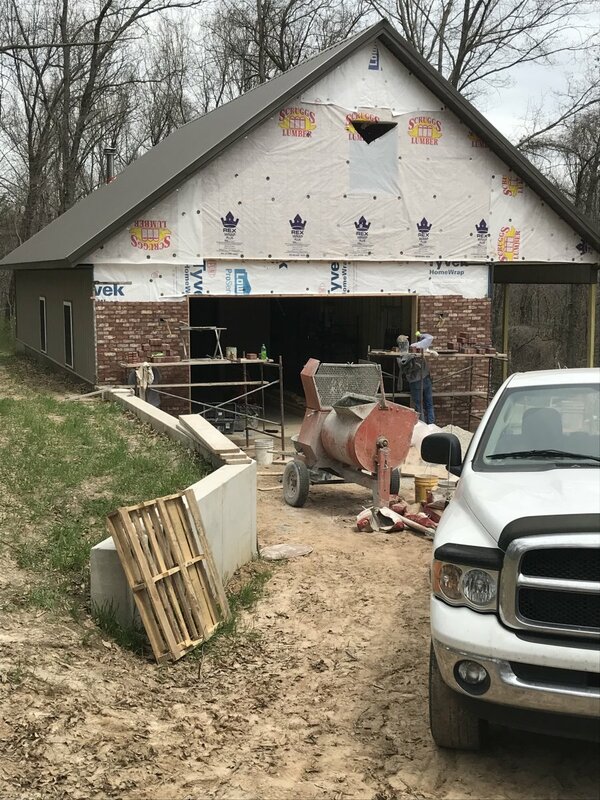 Late friday April 20 Gerry Lage started Linda's brickwork. Saturday 12:50p picture (he doesn't mind working weekends). The brick used on the house is still available from Midwest Block & Brick here in town; has a few more black bricks than original but Gerry pulled those or placed them low so the house and shop look similar. Gerry finished around 6p Saturday evening. He enjoyed winding down for a short while over a Sam Adams. April 30 - May 3 I attended a regional milk regulatory seminar in Reno. 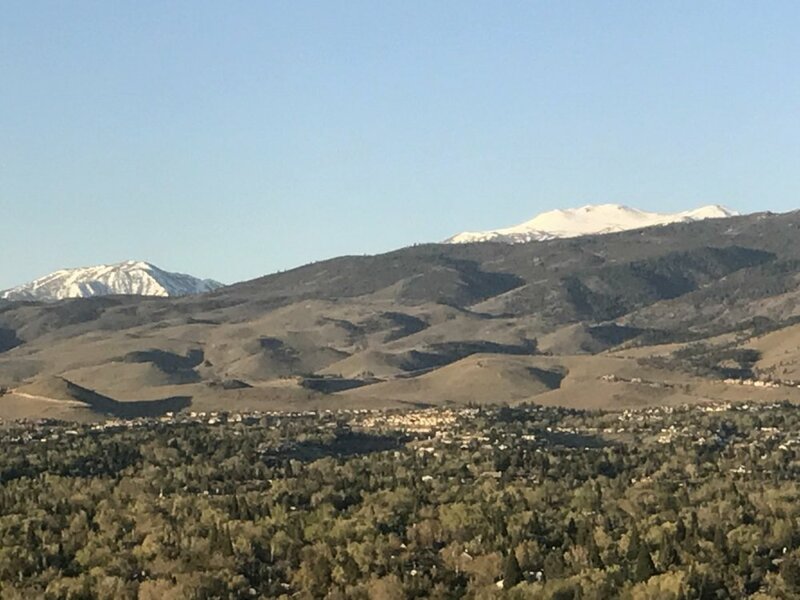 Rooms were a bargain at Silver Legacy and look at my view! 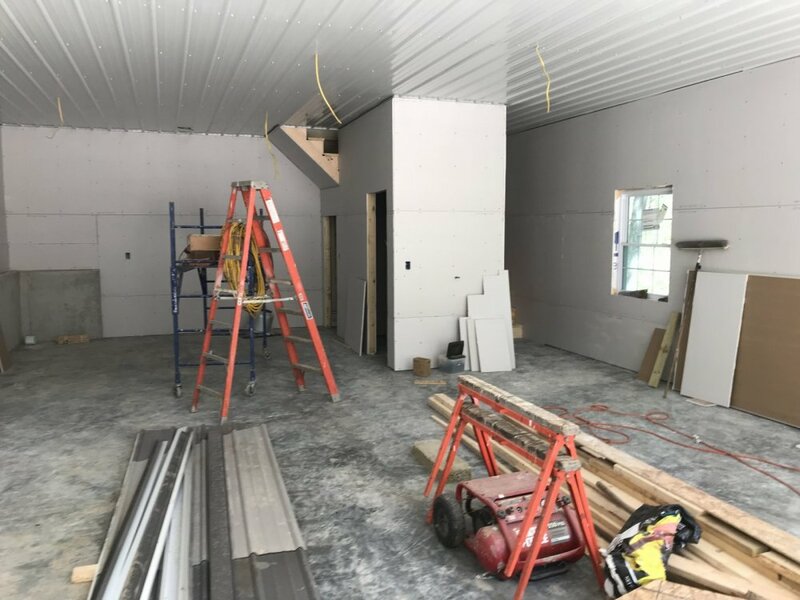 May 3 & 4, 2018 Dale & Bob hung drywall. 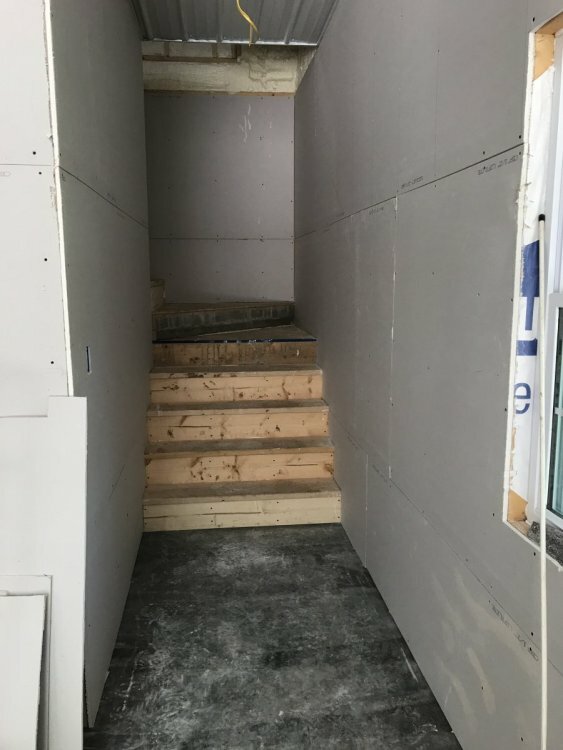 Picture toward the bathroom, stairwell & north wall. With only natural light it’s not bad in here. 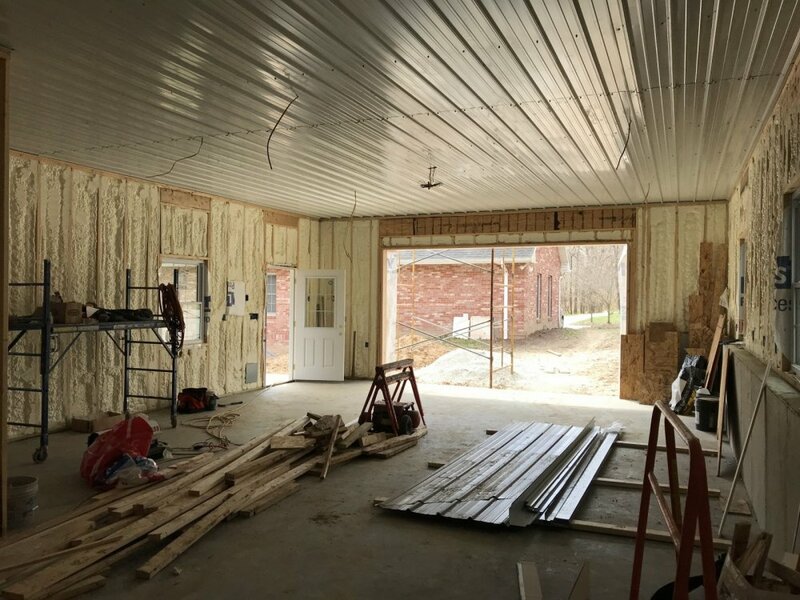 From the north wall looking toward the shop door. Another picture showing the light through the shop door. 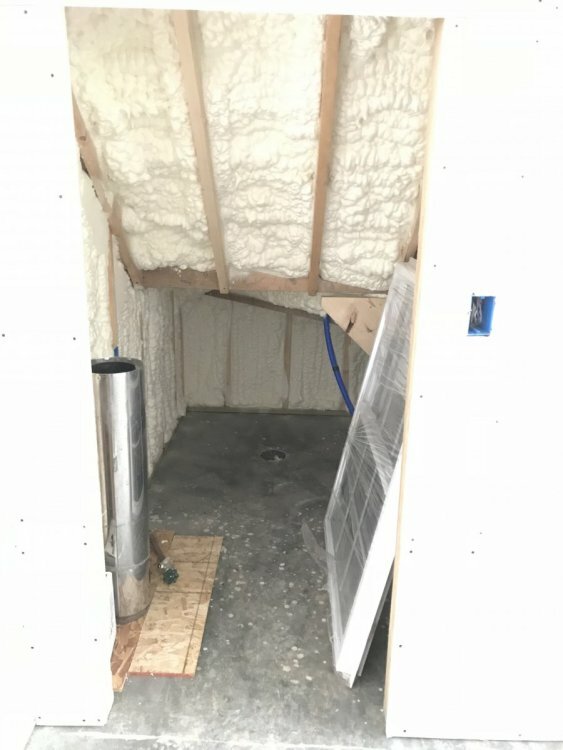 Inside the utility cubby under the stairs. 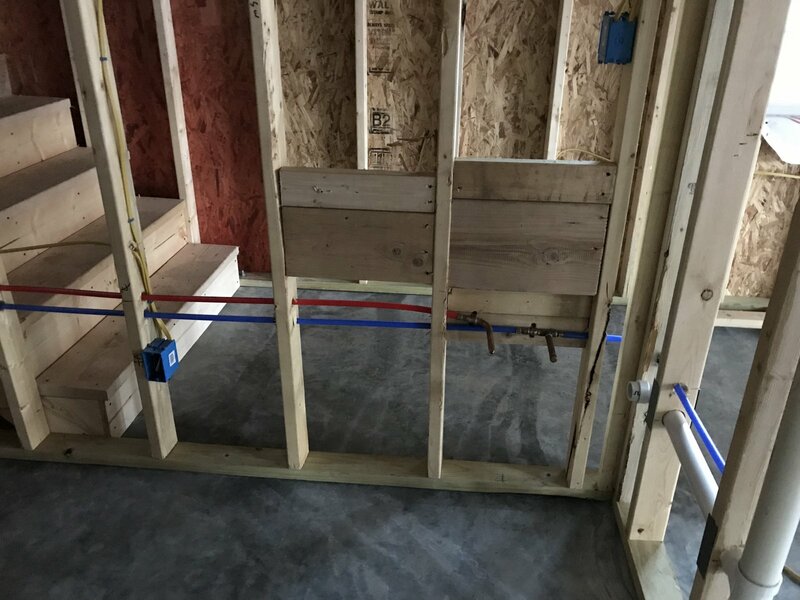 Drain is for the water heater. 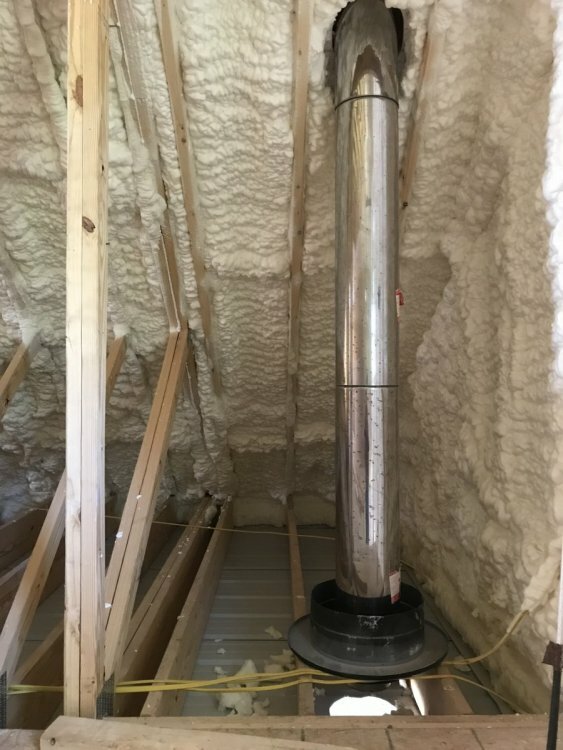 I bought the 6” insulated flu pipe along with a wood stove from a fellow who inherited a cabin from his in-laws at Lake of the Ozarks. 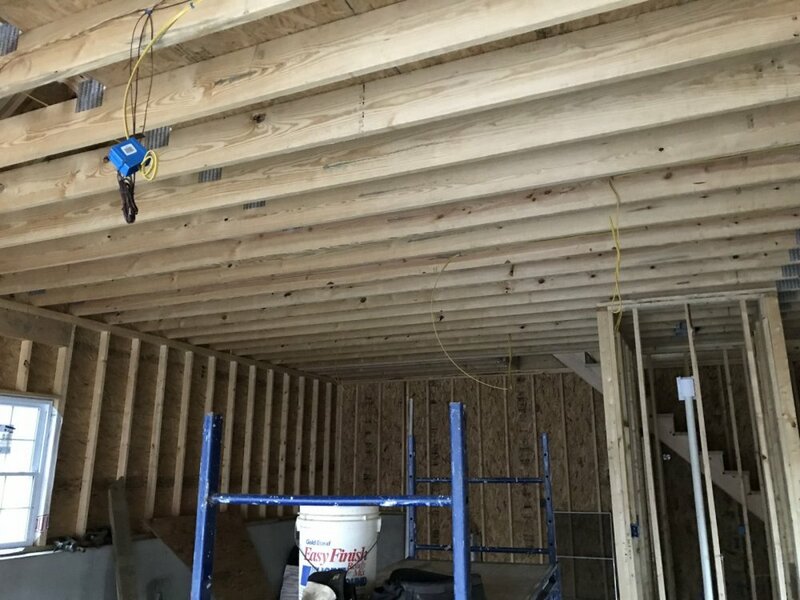 When the guys located the flu holes in the roof and ceiling they didn't have the black flange that was to be boxed between ceiling joists. 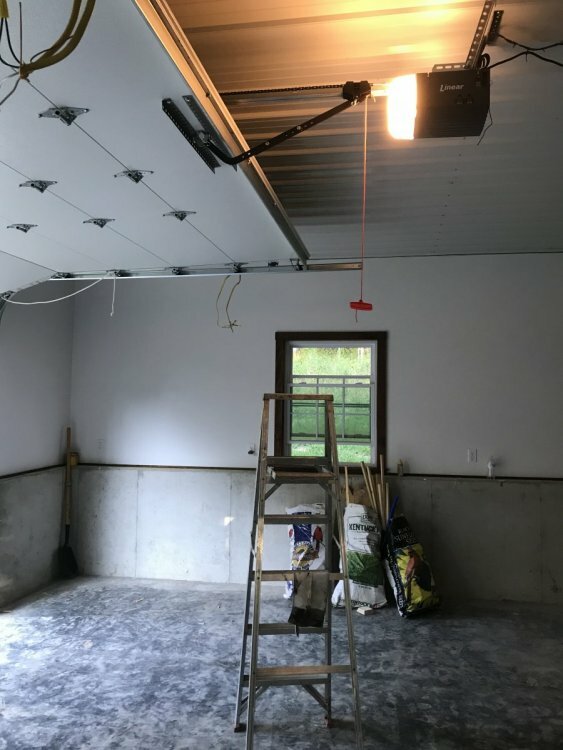 As you see, we will improvise and run the black stove pipe through the metal ceiling connecting into the flu here. Will need to pull a staple, move the wires, and secure the black flange to the truss. Also buckled the roof boot when we repositioned the flu so will need to get someone on the roof to fix that before long. 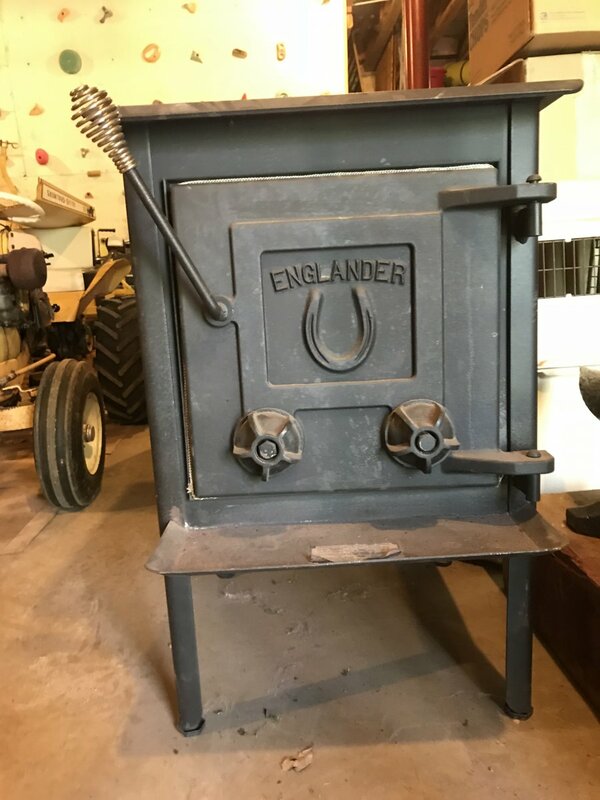 Englander wood stove I bought when I first started this idea. 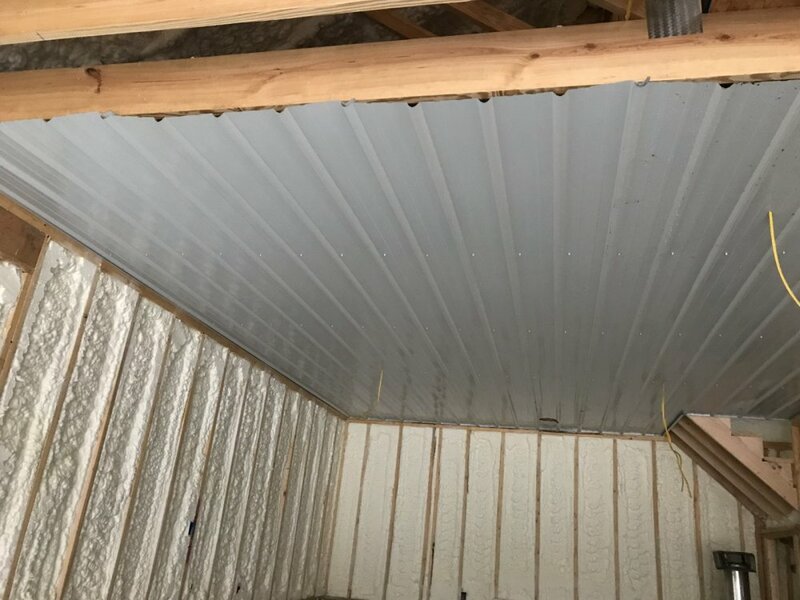 It's in excellent condition, firebrick show little use, as does the insulated flu & stovepipe. Looks like I have 2 - 35” joints flu pipe left over if someone has need. Stairwell is a bit dark but wide steps & risers are a pleasure to navigate. Neon lights will help. Loft. There was a Carolina Wren nest w/fledglings in the truss so the crew worked around them on Friday. By Saturday May 5 the babies were gone from the nest. I'm told this is a sign of good luck so I'll take it. 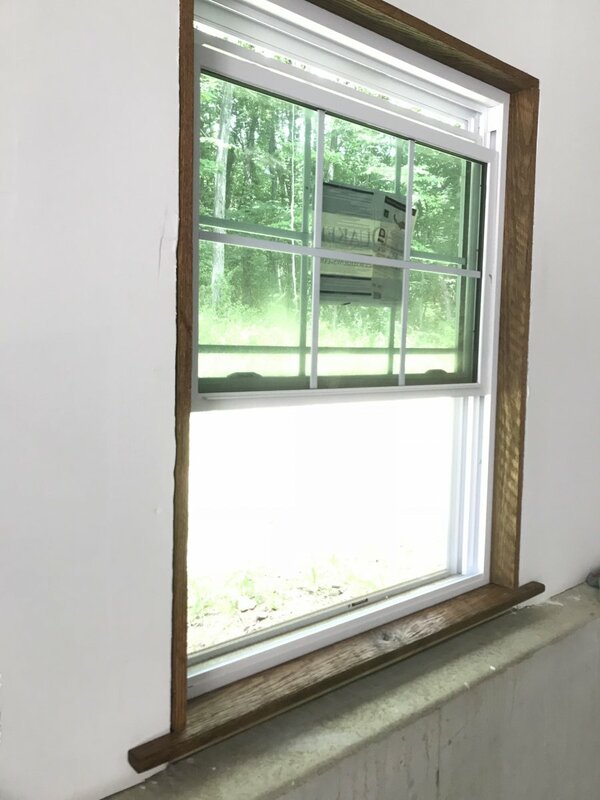 May 30, 2018 Tuesday following Memorial Day. 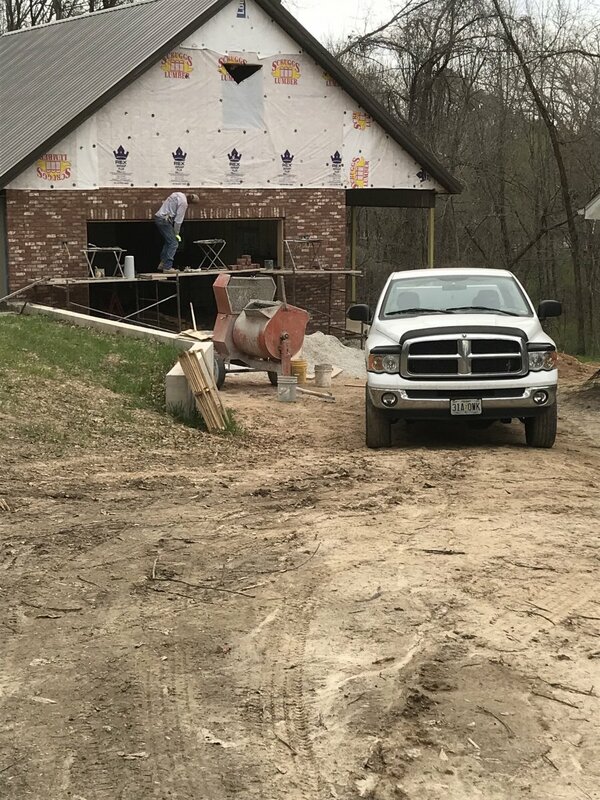 While I am away on business in St Louis and then in Lake Ozark 3 contractors converged at our shop. Caleb and A-1 crew arrived at 5:45a to install the vinyl siding for front gable and to position the flue. May was the hottest on record for Missouri so crews worked when cooler. 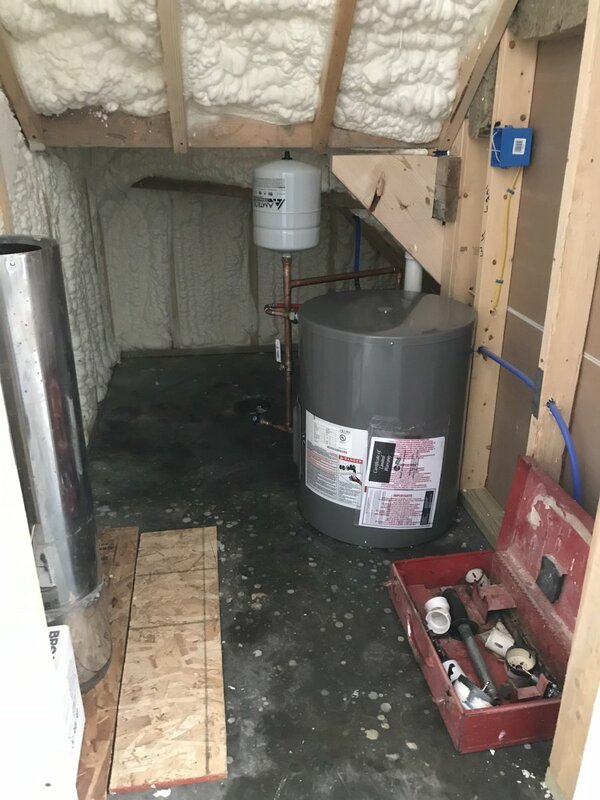 and installed the water heater in the utility cubby. Decided on a 20gal rather than my original planned 6gal. May want to wash something big. 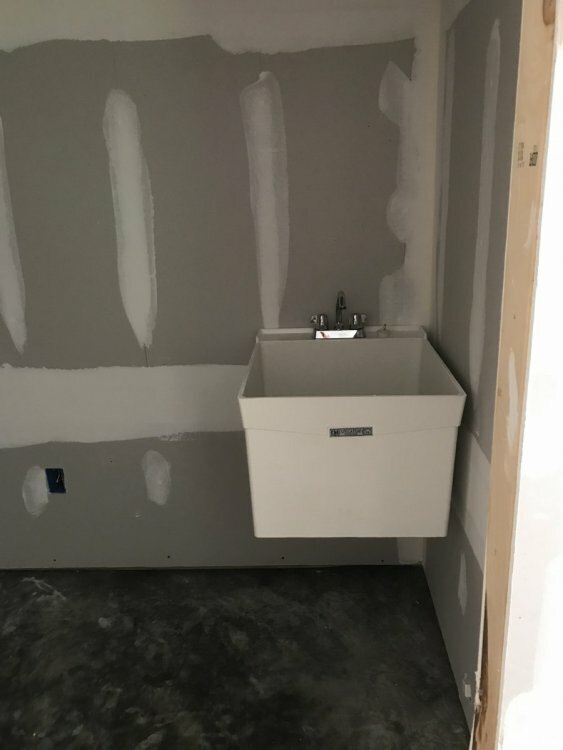 And a utility sink and stool in the bathroom too. Dale mudded and taped before leaving May 31 for a 3week cruise around Alaska w/his wife Dr Lory. 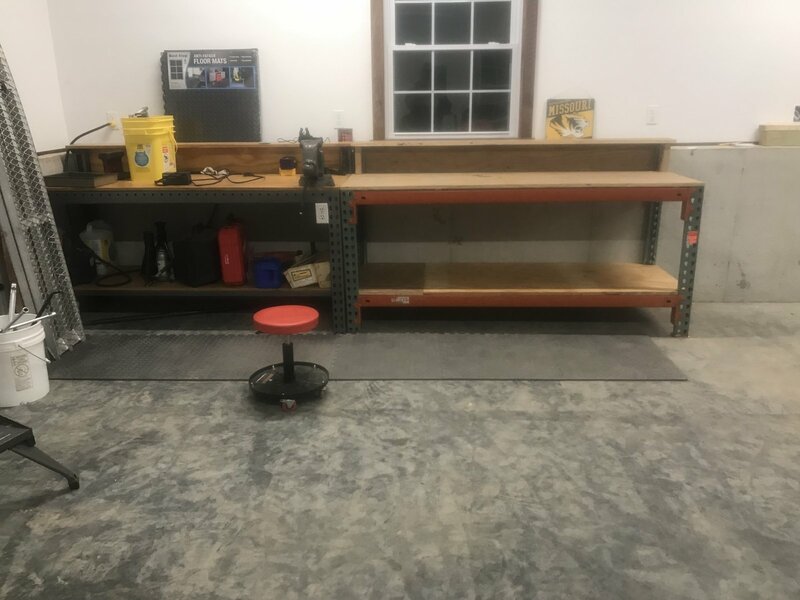 While he was gone I cleaned, painted, and did some other small jobs to ready the shop. 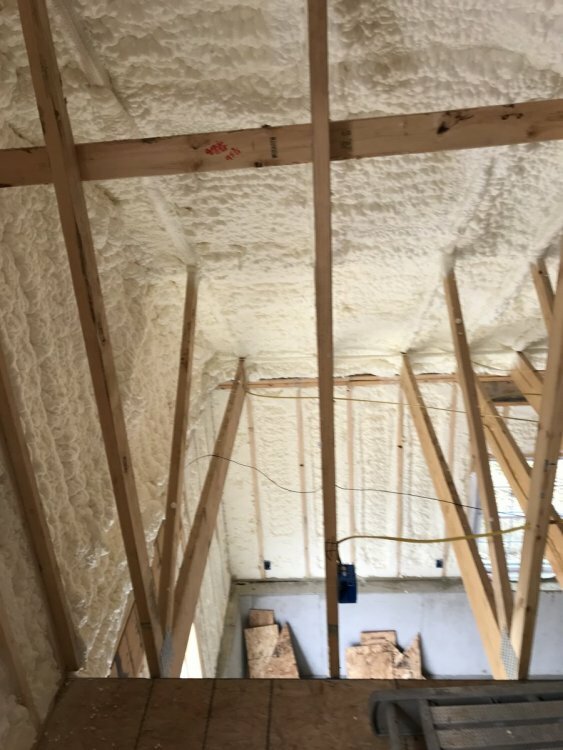 I've been surprised so far how the foam insulation really keeps the upstairs at a bearable temp during the hot days. 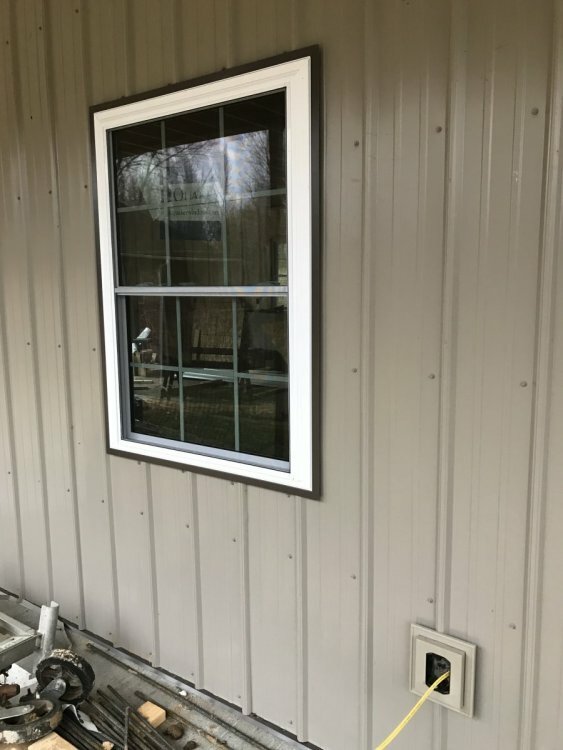 I am not installing an air conditioner initially but holding the option for heater/air conditioner wall unit later if needed. June 14, 2018 I told someone yesterday they have to understand, I am working on a year-long project that's taking 3 to complete. I do have a lot more patience than I did 30yrs ago! 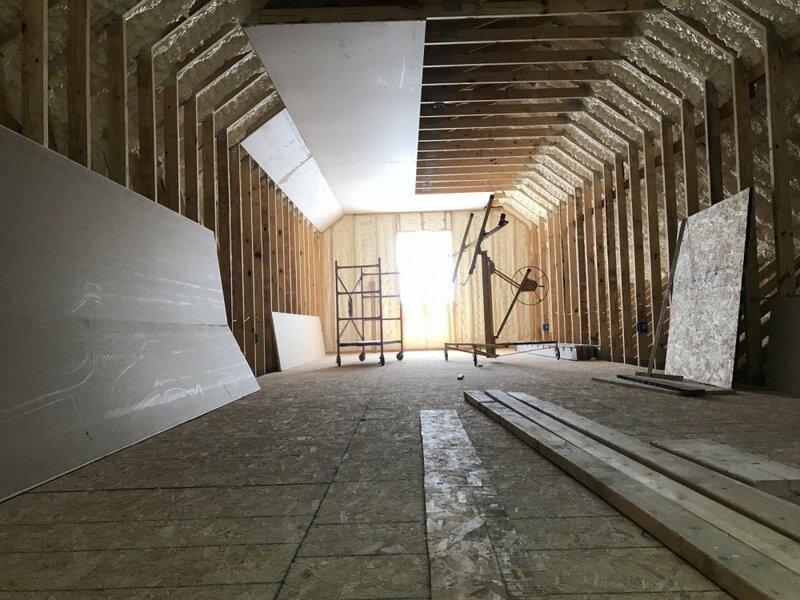 Between work and family trips I am starting to cut in the ceiling, corners, windows/doors, etc so I can roll paint on the walls (and ceiling upstairs). 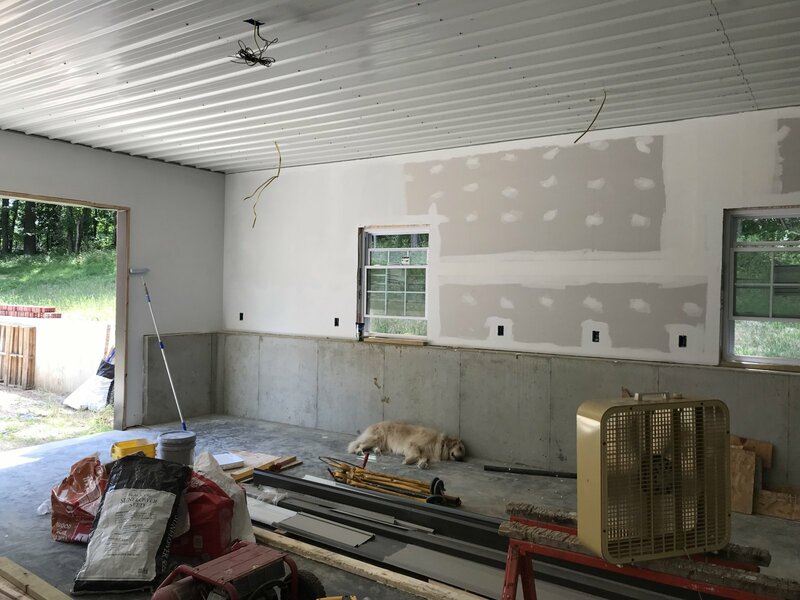 Electricians are ready to come back when painting is complete so pressure is on me. Leave Sunday for a week long FDA training in Dallas so hope to get some paint slapped on b/f I leave. Dale returned June 20. 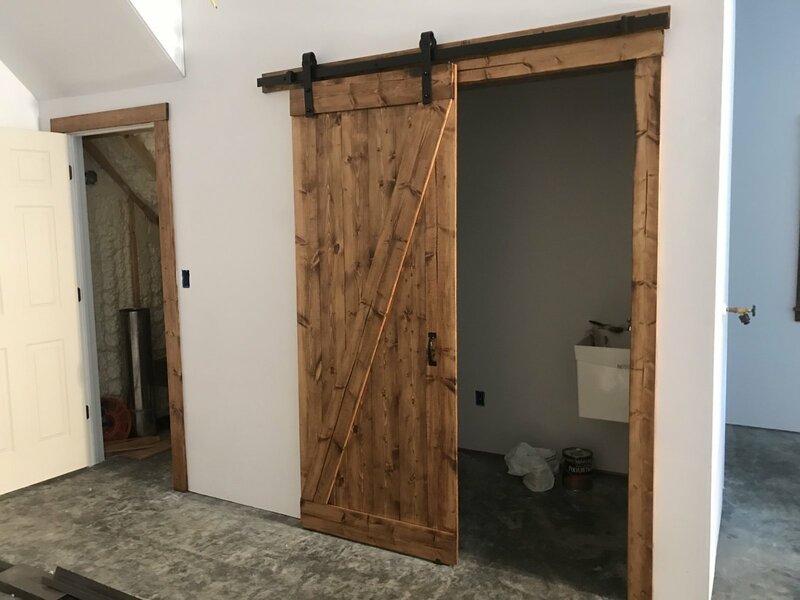 He finished mudding upstairs, built the barn door for the bathroom, and installed trim around the bathroom and walk-in doors. June 22, 2018 I returned from Dallas on a 6a flight to St Louis. 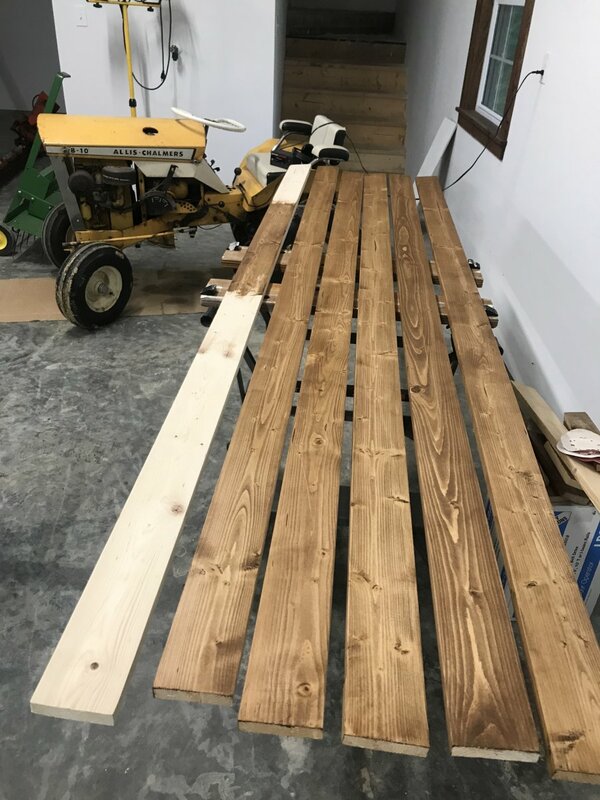 Our neighbor Mark Blume has offered to cut, stain, and install window trim made from old ruff sawn oak fence lumber to give the shop a rustic look. 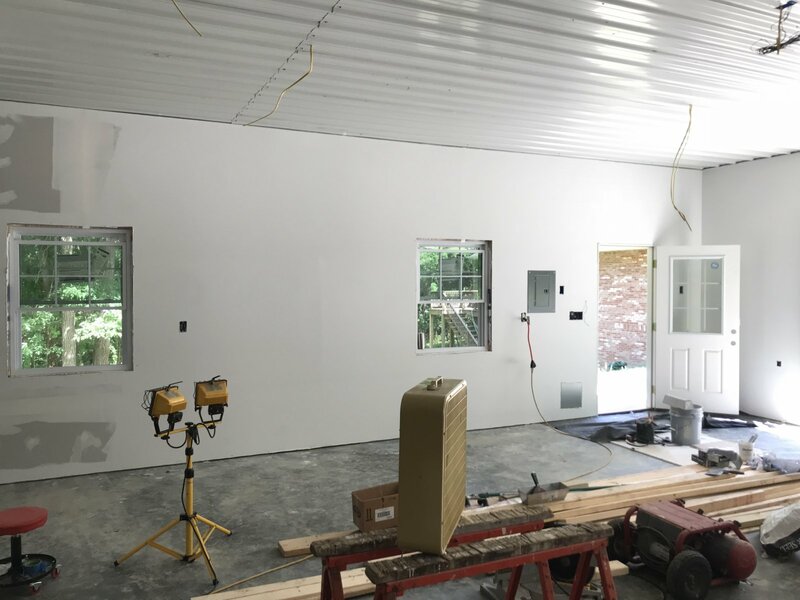 I am painting all walls and ceiling upstairs white as well and will summon the electrician as soon as finished painting. 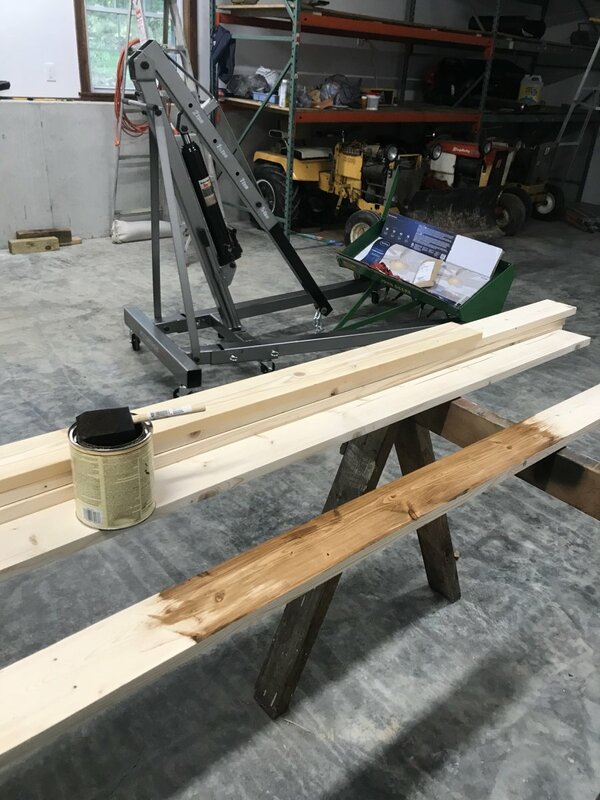 Walls painted, windows trimmed, 10’ tall pallet rack ends & 8’ rack supports ready for assembly. 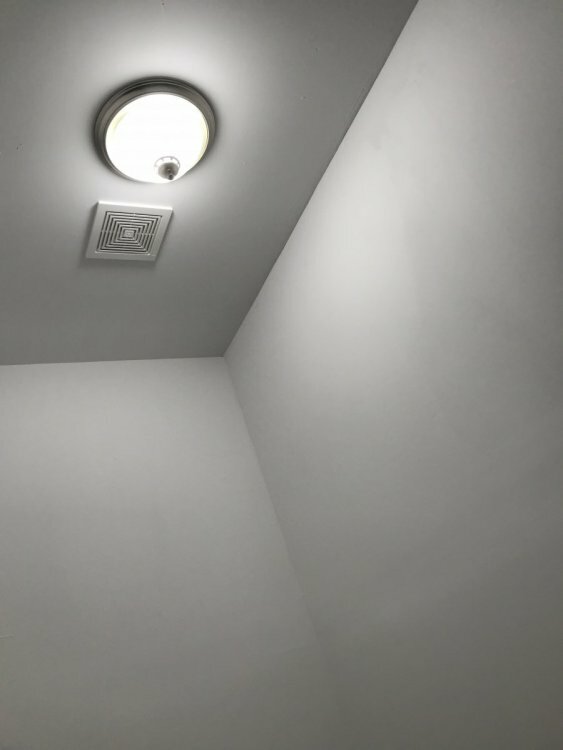 I see one ceiling light will need to be moved from directly over the rack. 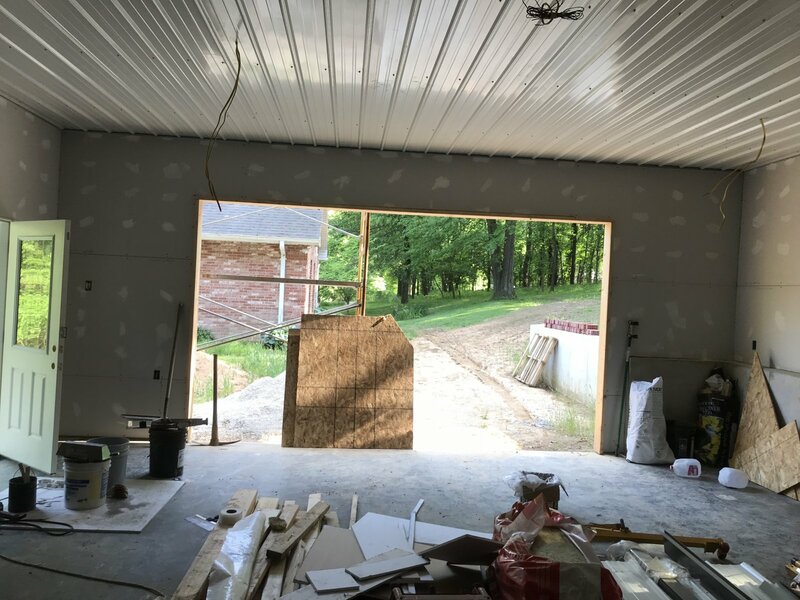 July 25, 2018 Trimmed out the garage door with metal. 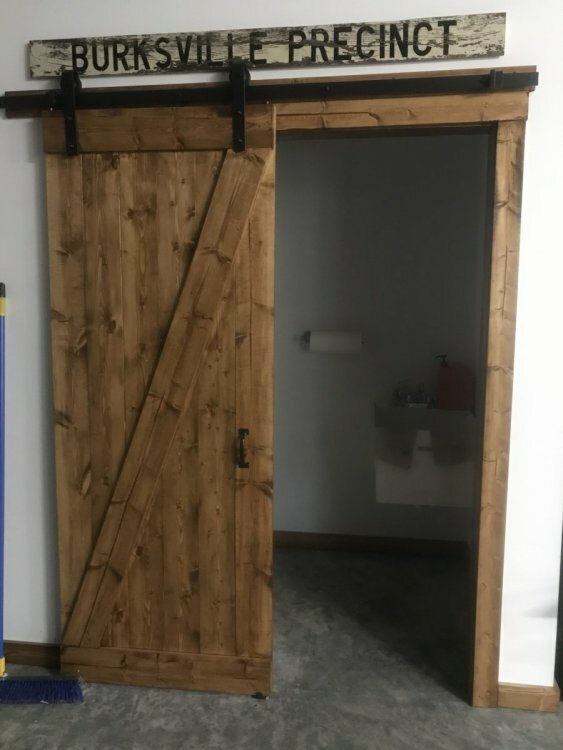 I liked the look and would have stained or painted the wood anyway. 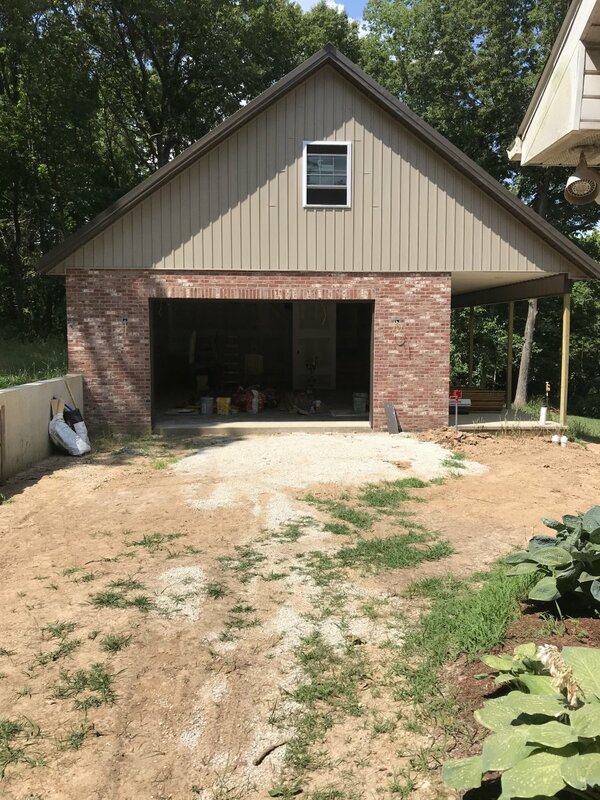 July 30, 2018 Mark Blume is retired, my neighbor, and woodworking is his hobby. He offered to trim the windows in old rough sawn oak and after that he said "why not use some scraps to trim out the wall. 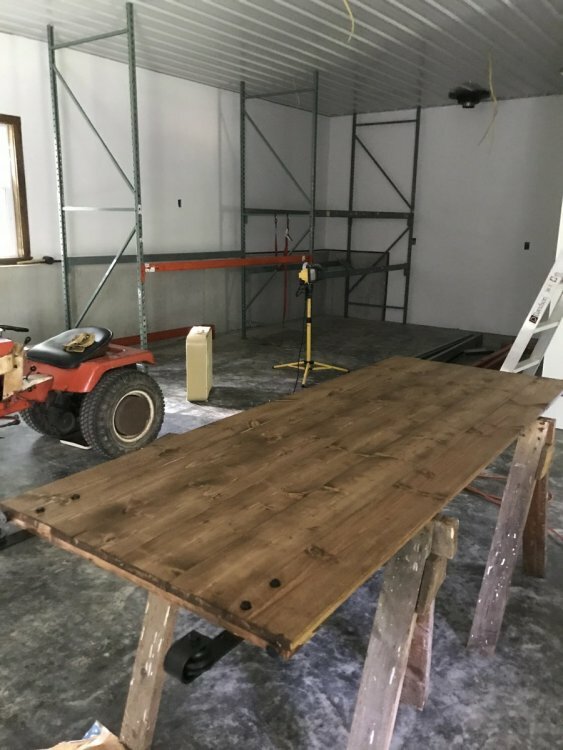 Today after church we cut, sanded, stained, sealed and nailed 3/4" trim to the wall where the workbenches and pallet racks will stand. 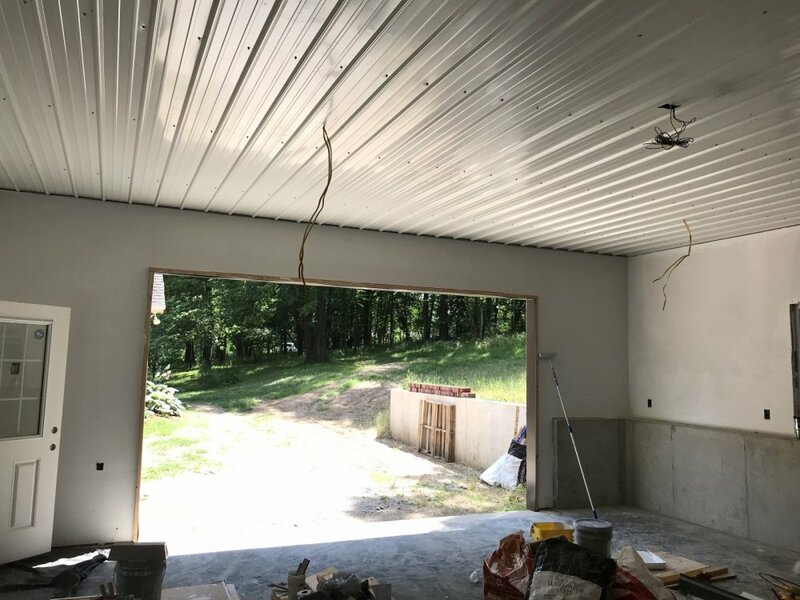 July 31, 2018 14' overhead door installed. My builder told me the insulation and door would keep the shop cooler in summer and he is right. Working inside on pallet racks, trying out different shelf heights, and its much nicer when the door is closed & fan running. Figured and reconfigured the pallet racks. These were used and some a bit abused I think so the erection didn't go as easily as I thought it should. Also, I couldn't set them up exactly as I had planned because you do what you can do with used right? This will work or I'll buy some new parts to make it work later when I determine my needs better. 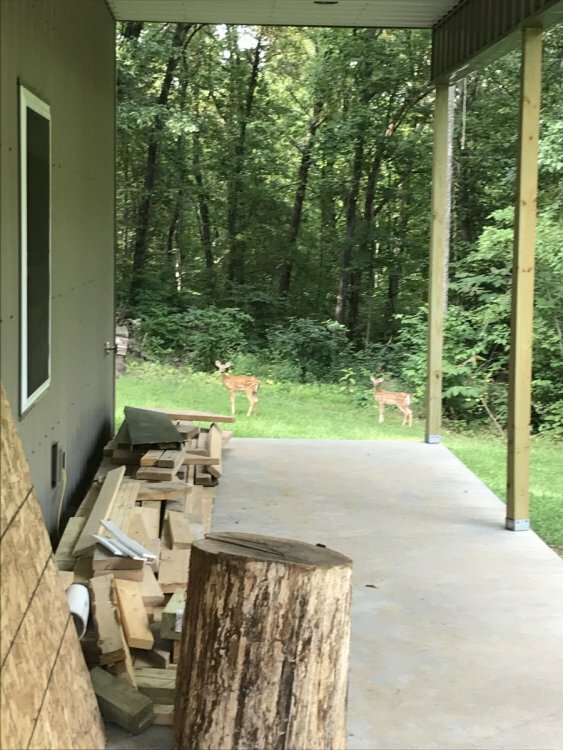 Throughout this project Cooper and our resident deer have been pictured a lot. In August 2018 these two fawns, their mother, couple of doe friends and a buck are frequenting our yard and backyard. Linda sprays the costa every week to keep them from feasting so much. 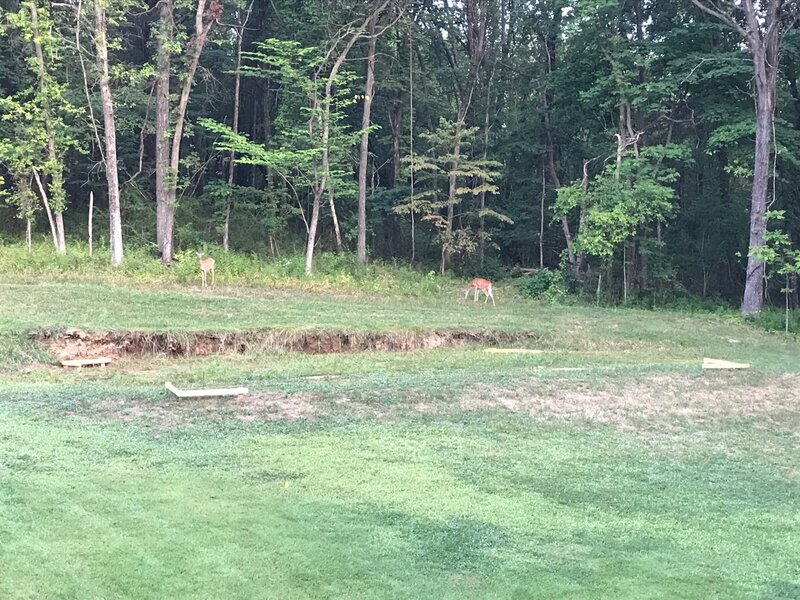 Today as I walked to the shop after work these two fawns were as interested in watching me as I was them. My view from the porch. August 27, 2018 Electrician has been swamped and hasn't returned. 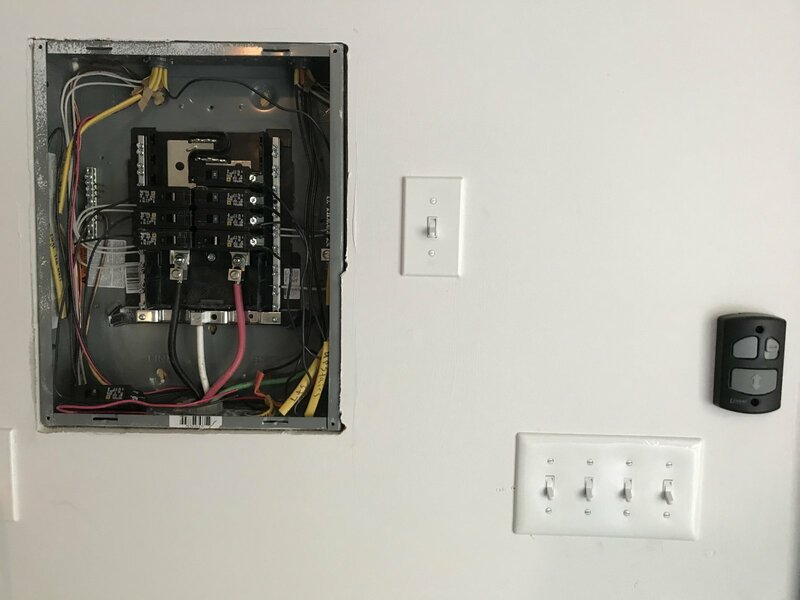 According to code I have to either use a licensed electrician or I can do the work myself. So, for the past several nights after work I'be been installing breakers, tracing wire, installing GFCI and regular outlets and switches. Linda picked out the bathroom light fixture. A little big & bright but well lit necessary room. Overhead door works smoothly but the contractor charged me for, yet didn't install, the wireless keypad and 2nd remote. They told me to drop by & pick them up - no problem for me to install myself. So I deducted the cost of 1 remote ($30) and 1 wireless keypad ($45) and sent the check. Ordered new wireless keypad remote from eBay for $20. September 4, day after Labor Day holiday Gary Schulte called to finish the electricity. 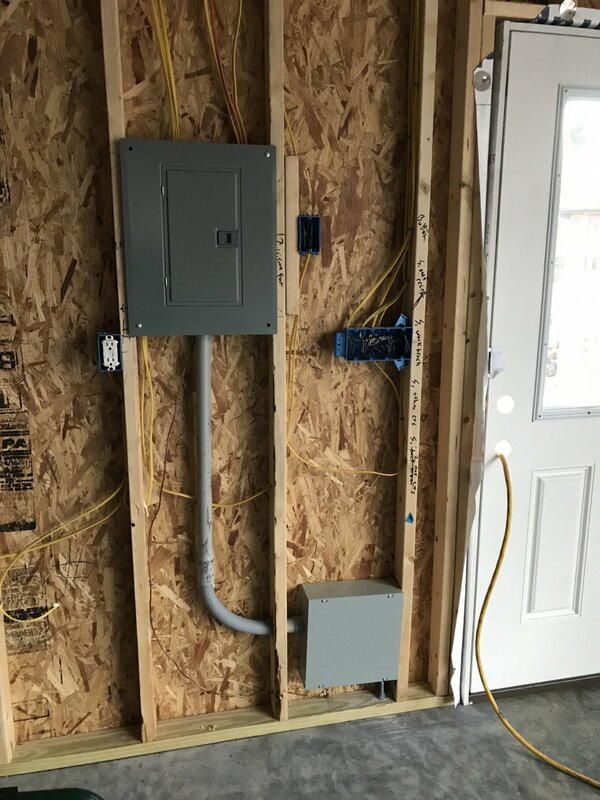 He didn't change out much of what I did; changed out 2-15a breakers for 20a, changed out the LED bulbs & replaced w/LED fixtures on the porch, and pretty much left the rest. Passed city code inspection so Woohoo! Electricians installed the hallway 3way switch & asked Linda to get matching lights to those we used upstairs from Lowes. 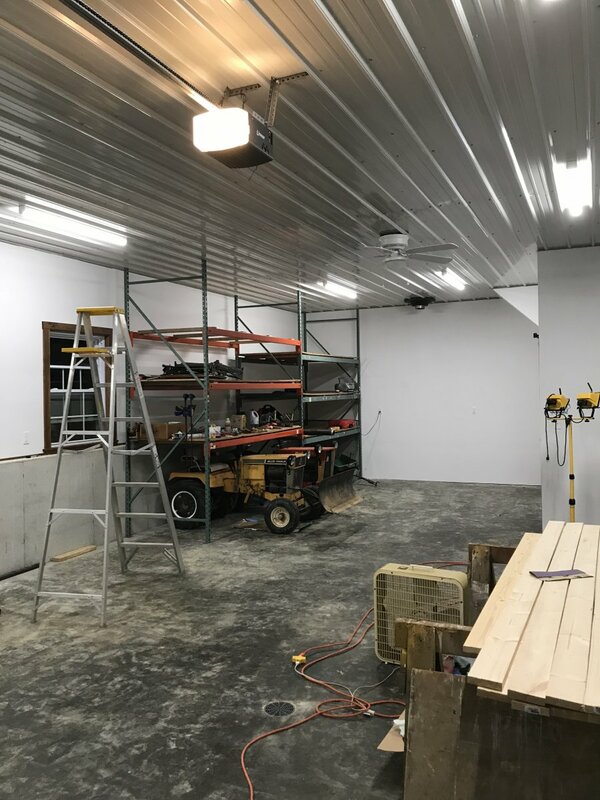 LED lights installed in the workshop area really brighten the place! Took picture below at 8:00p September 3 after finishing over seeding the backyard. Trip to Ft Collins, CO to see our son, daughter in law & especially the grandkids so I'm off shop duty for a week. Upon return I needed to mow our property at the end of the street. I use the Bumblebee 10 out there; its rough and tumble and the B-10 handles it very well. 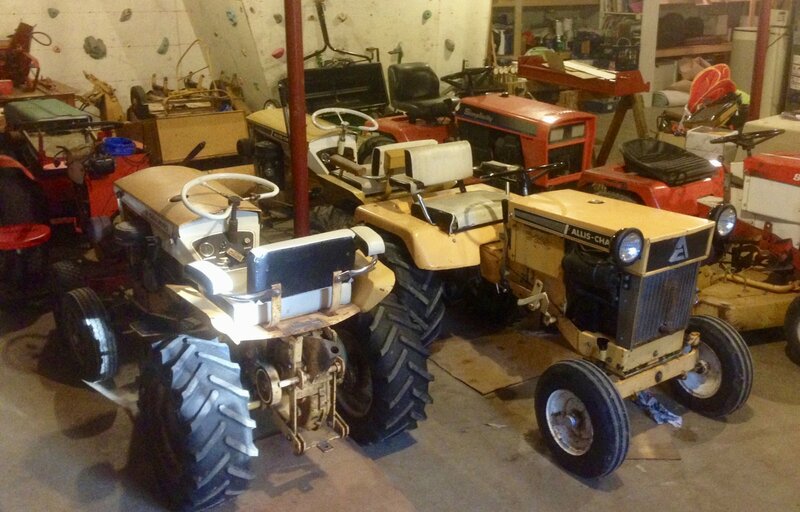 When done I parked it inside the shop so now we have 3 resident vintage foot dragger Simpletractors. In the foreground you see more 1x8 pine boards. Neighbor Mark Blume & I will sand, stain, seal and nail up these baseboards downstairs. 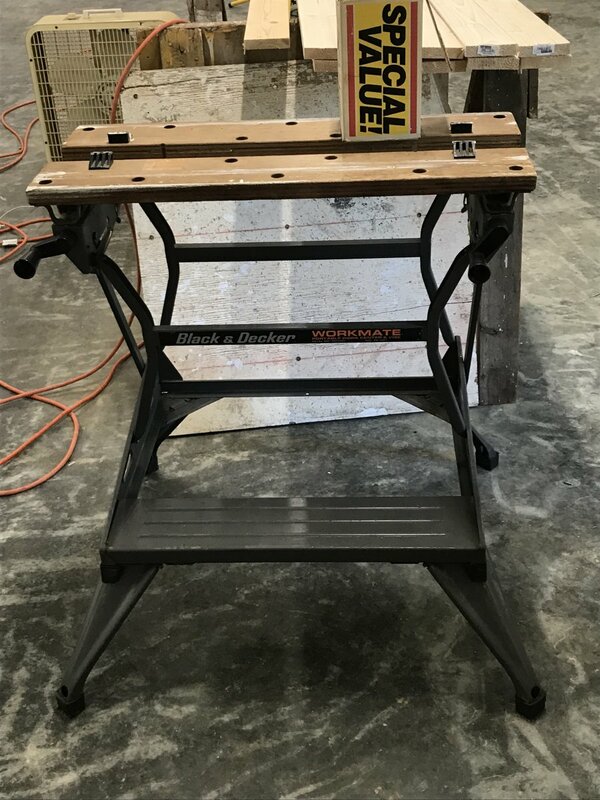 Newest acquisition for the shop is FB Marketplace find: Black & Decker Workmate 200 for $25 delivered. 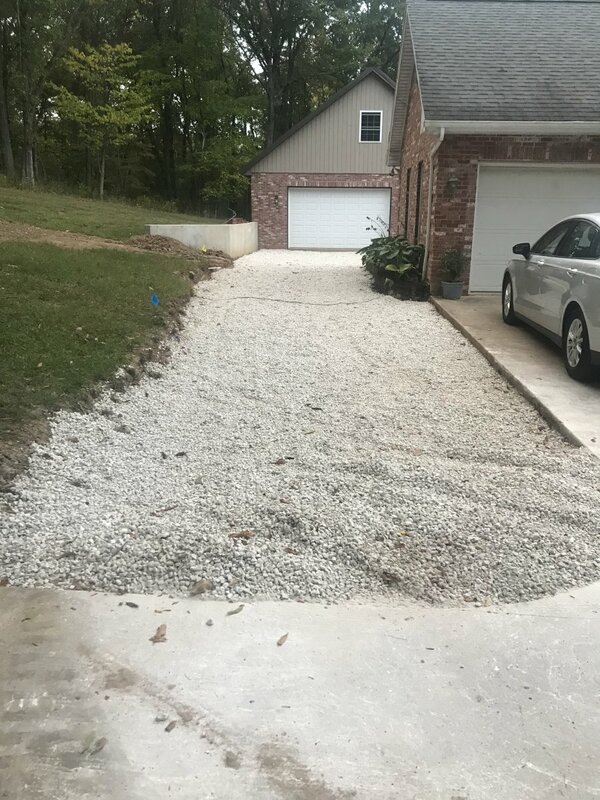 October 1, Mike Schneiders excavated the new drive and spread the gravel base for the concrete. Had to remove a dogwood tree. 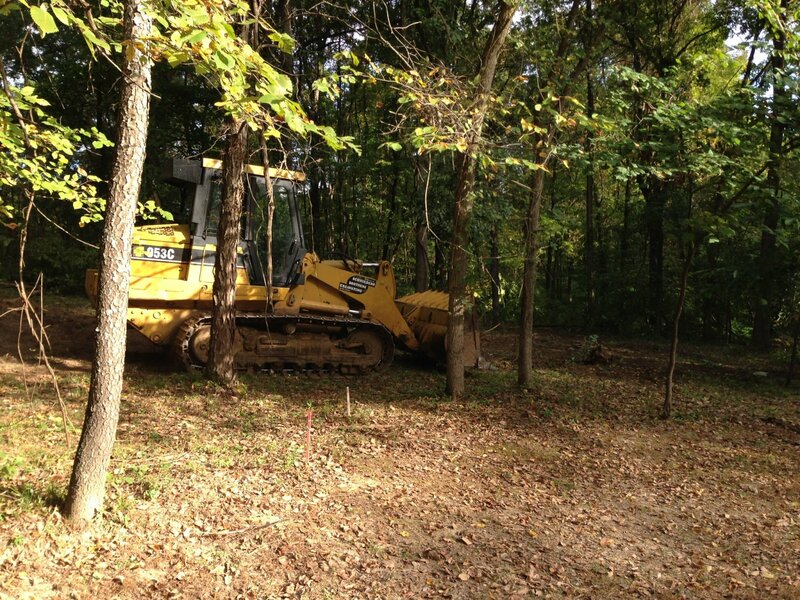 Mike moved it into the woods behind the shop. 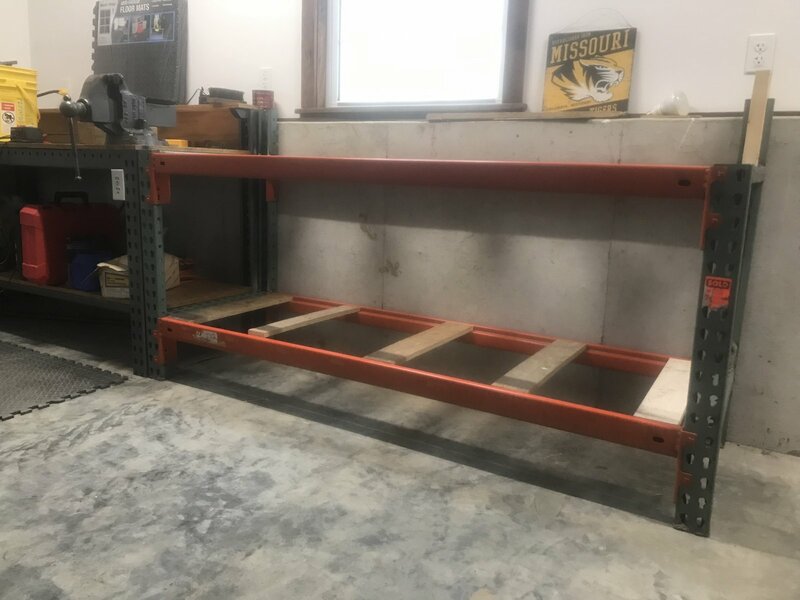 October 3, 2018 I had to really beat and pry to get some of the pallet racking up and when finished the uprights were visibly whopperjawed. So I measured and found I had 3 different length cross bars. Tore down the left side (mostly orange crossbars) and reconstructed until I had 2 crossbars left - one orange 96.5" & one green 97". The lower orange crossbars are all 96". October 6, 2018 The move has started. 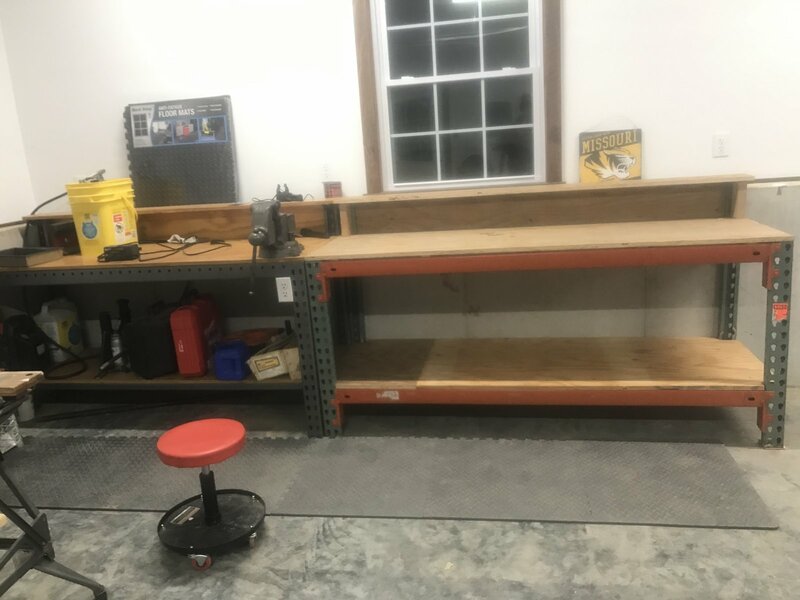 I need my tools in the shop instead of the basement. Put the equipment to work moving my Craftsman tool boxes and power hack saw. And put the cross bars on top with help of my daughter visiting from Boston. 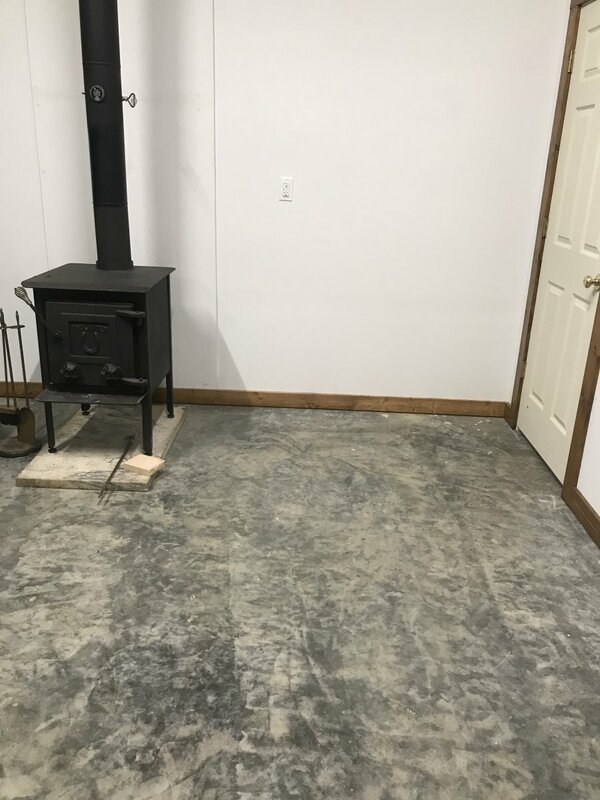 October 14, 2018 Stained 1x4s for baseboard and picked up backer board and screws to erect behind the wood stove. 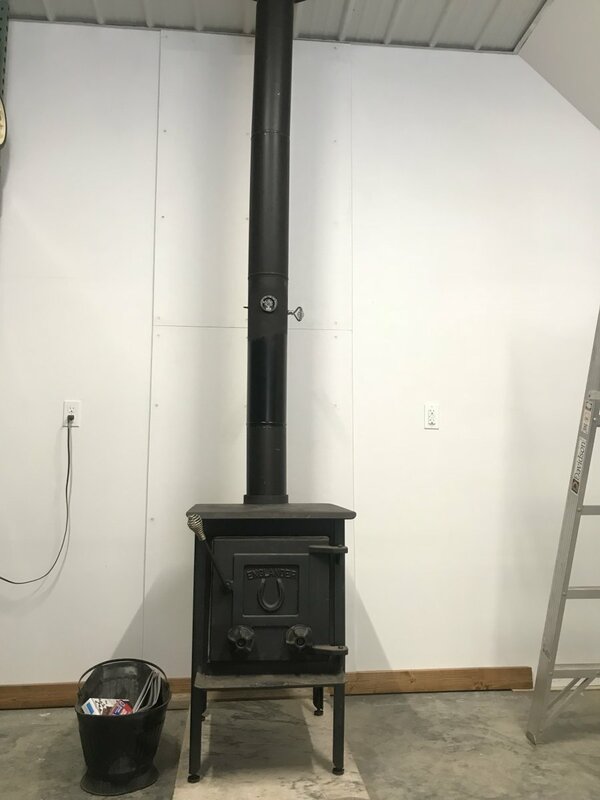 October 27, 2018 Wood stove up. Earlier this week we screwed 2-3'x5' 1/2" cement backer boards to the wall directly behind the stove. 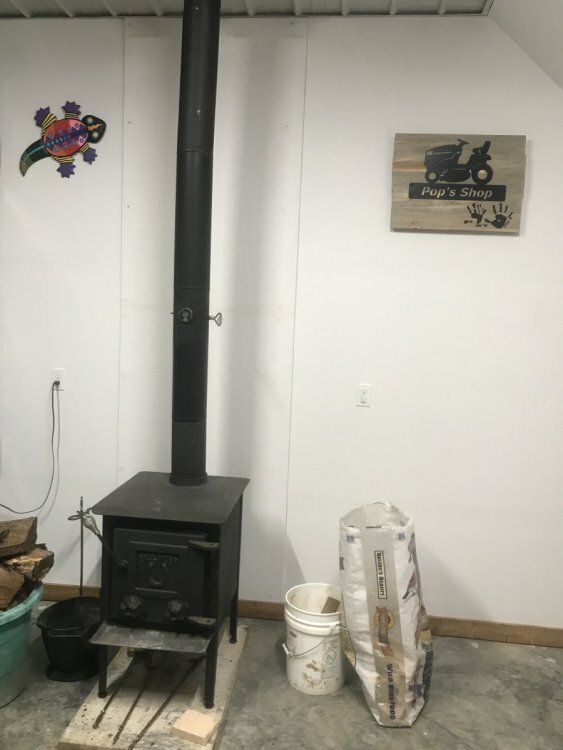 After firing yesterday I may likely sit a stove board against the wall behind the stove too as it gets pretty warm back there. 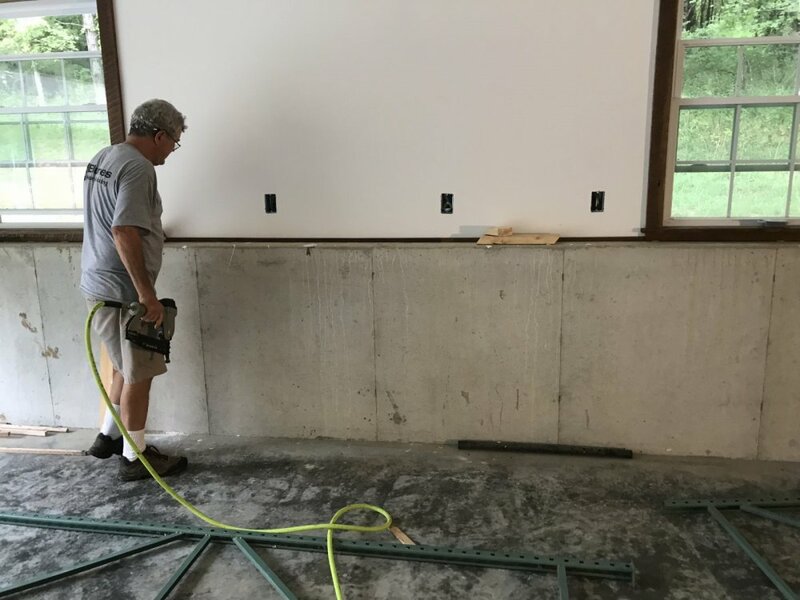 Neighbor Mark is installing the baseboard. Personalized things a little. Lizard was given by by girls back when they were in middle school. It was a crazy gift but a gift nonetheless. Their mother wouldn't display it in the house so I've hung it in my shop for 20+ years. Pop's Shop was this year's birthday gift from my grandkids. 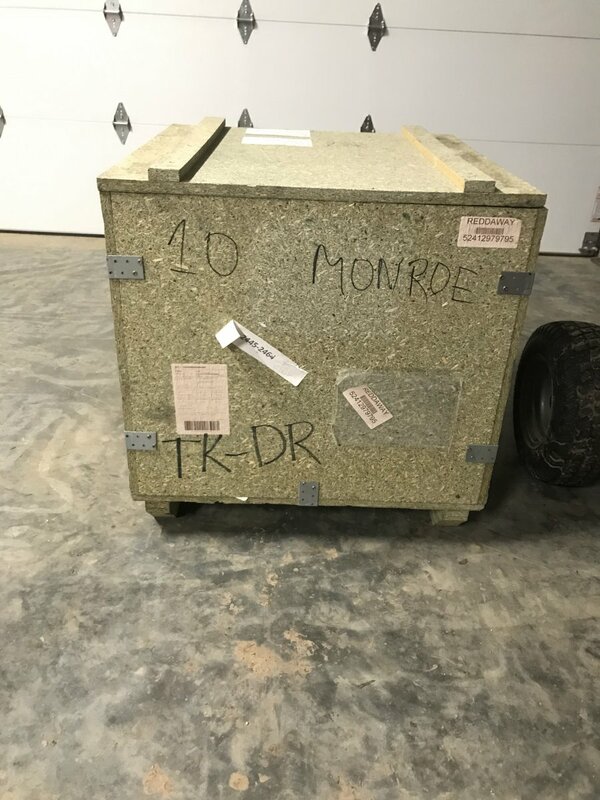 Tank looked like this when I received it. Well actually I'd already cleaned it up when this picture was taken. 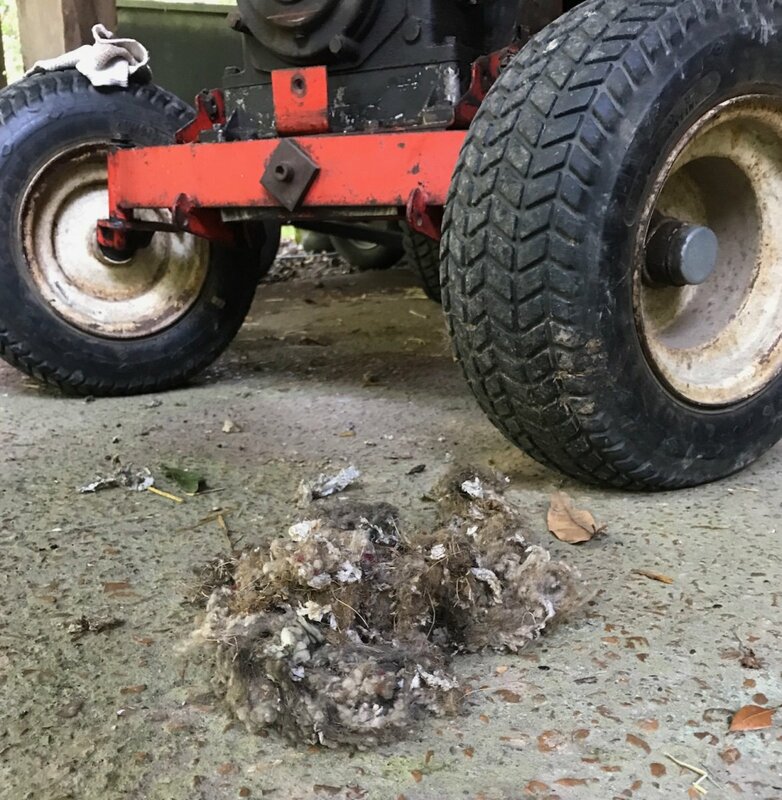 May have been setting under trees in a mower graveyard somewhere. So I tried to clean the black spots off w/cleaner but no luck. Today I took some fine sandpaper and rubbed lightly. We've received much needed rain here last two days. Sunday a nice .7" all day rainfall allowed me a little tractor maintenance time. I have not overworked the 3012 Sovereign since acquiring last spring but I've really not taken time to examine it completely either. 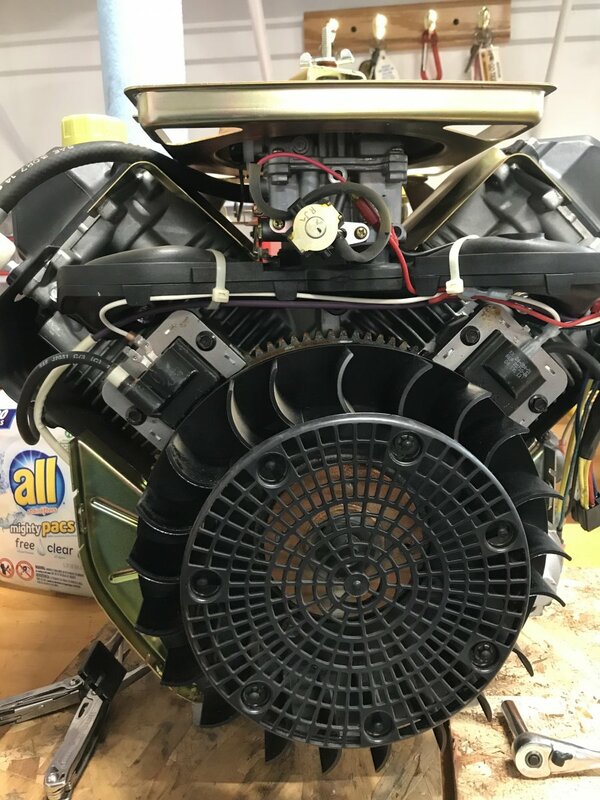 So, rain keeping me from outside activity I took advantage to check behind the blower shroud on the Briggs 12hp engine. Look what I found, and destroyed. While the grill was removed I added the missing axle travel stop from my parts stash. Productive day for me but destructive for Mr. Mouse. As I finished I felt extra vibration and found one of the heim joints on the pitman to be really worn. When you consider the revolutions and speed these machines operate, there is no doubt there will be wear points. Not sure how it held together till I finished actually. 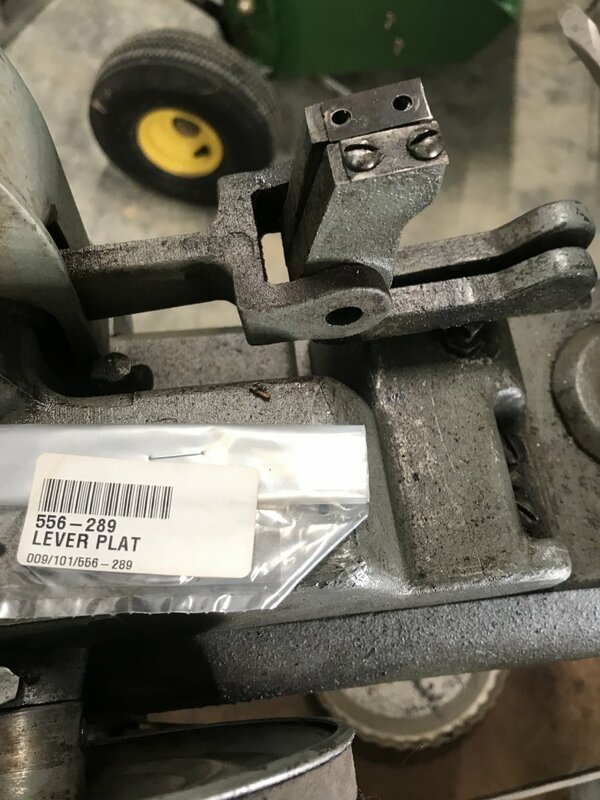 McMaster Carr to the rescue! 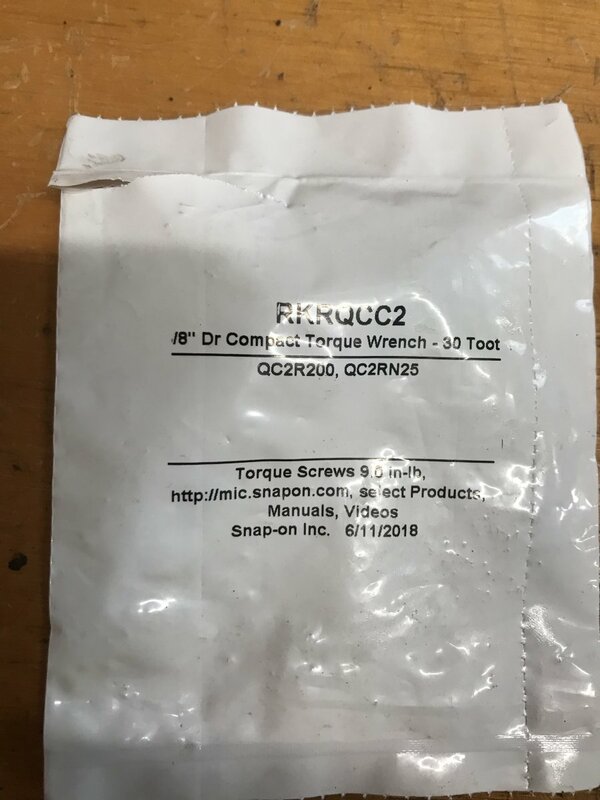 I measured and ordered the part one day and took delivery the next day. That is service! Heim joint installed and ready for the next mow. We're experiencing a beautiful June 24-25 weekend in Missouri with mild ('70's) high temps and low humidity. I'm batching it right now so I planned to get the foot draggers out for a little work and repair. First, my B210 shucked the starter/generator belt last week while I was retrieving a neighbor's wood splitter from behind couple of houses and a swimming pool. 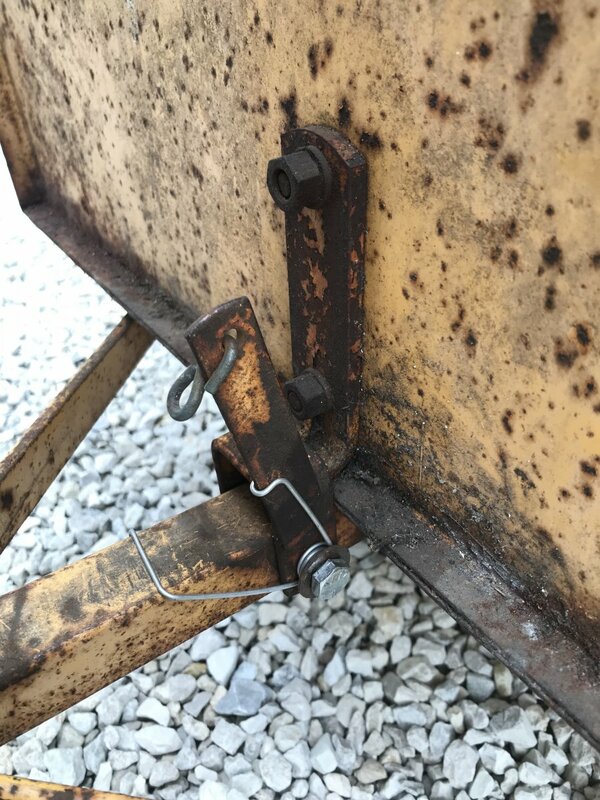 Got to use my repop front/rear hitch for that job. Luckily I didn't kill the engine till the move was finished. So, after work on Friday I started the replacement job with a belt I had removed from a parts tractor last year. Thought I'd just remove the bolts and spacers from the drive shaft, and the hydrolift belt, and slip the replacement belt over the pulleys. WRONG. After skinning my fingers, dropping the spacers in the frame, and finding I just didn't have enough room for my club hands, I decided it would be easier to remove the grill frame and pull the engine. Not sure this is the preferred but it worked for me as those 4 engine bolts come out pretty easy and I could move the engine enough to get the room I needed to work. Finished in time for bed so I felt I had accomplished my mission. After the dew dried on Saturday I pulled the early B10 out for it's first work of '17. 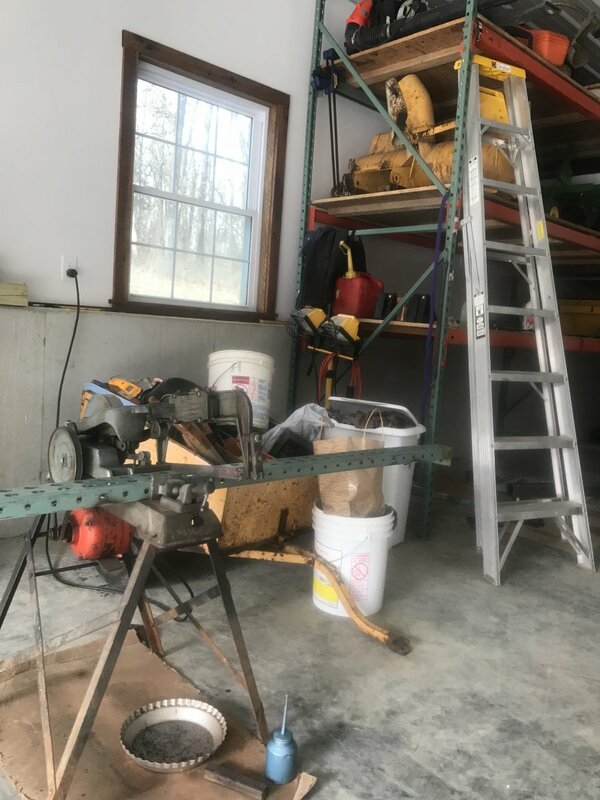 I'd mounted and used a Simplicity cable lift sickle on it last fall and, I had some tall grass and weeds growing along a diversion ditch that runs along the hill above our house. The old 23d Briggs started right up and the sickle ran smooth as silk; well it ran as smooth as a sickle should run. I operate at less than 1/2 throttle on the small mid pto pulley and it'll still shake the tractor a little. I'm trying to post a picture from a frame of the action video I shot but for now here is a picture of when I replaced the fronts with tri-ribs I'd taken in on a trade. Next I needed to try to outsmart a squirrel. For 6 years now I've one upped the squirrels with my pvc pipe atop the bird feeder pole. 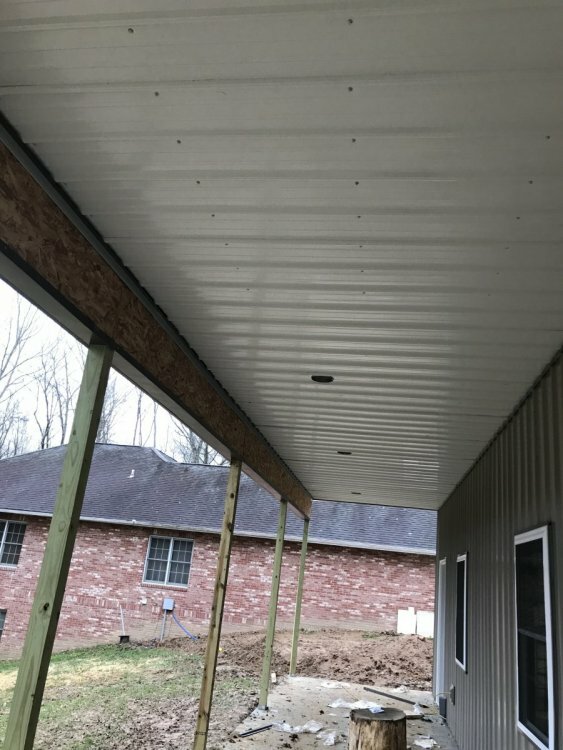 I simply capped a length of 4" pvc, drilled a hole in the cap, slipped it over the pole, and drilled holes for the tarp strap that hold it up there. Squirrels have climbed that pole and gone under the pvc pipe but not on it. This has been a successful deterrent until this year. We have a grey squirrel population mostly and the go up and inside the pvc but not on the outside. I think the smarty may be a red variety. So, a little grease rubbed on the bottom of the pvc and we'll see if the little bugger can climb this. Actually, this was a fun day mowing. A cool breeze, plenty of shade, I only used about 1 1/2 tanks of gasoline, and all belts held. I filled the gas tank, loaded up the trailer, admired my work, and headed home. Pulled in the drive and I noticed gasoline spill on the side panels and frame. I wiped it off and started searching, hoping to find only expansion from the lid. No such luck. Gasoline was leaking into the battery area as fast as I could wipe it up. The tank was nearly full so I had to drain it back into the can. Gasoline never runs out of those 1/4" lines as fast when you're on a planned drain as it does if an accident or an incident. This tank was repaired and lined about 10 years ago. This is what I found. I got a repaired tank along with the 3012 deal so I checked and installed it. No leaks! Another unexpected but successful repair. Now, what to do with the yellow leaker tank? Sunday I wanted to remove the Rube Goldberg stack muffler that was on the 3012 when I got it from Swede. Great weekend to do that outside using my "gas wrench" acetylene torch outfit. 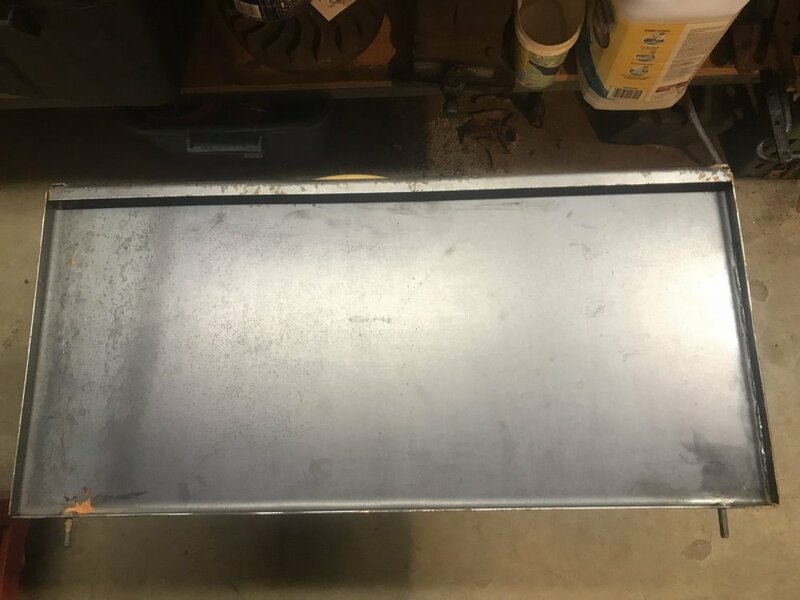 Was pretty darn stubborn so I had to get a spare piece of heavy sheet aluminum (no parking sign) out to shield the heat from the carb, wires, etc. And I finished up Sunday moving some of the wood awaiting the wood splitter to a spot out of the way in case the concrete crew shows this week. I've found a lot of use for the utility carryall box I made earlier this year. 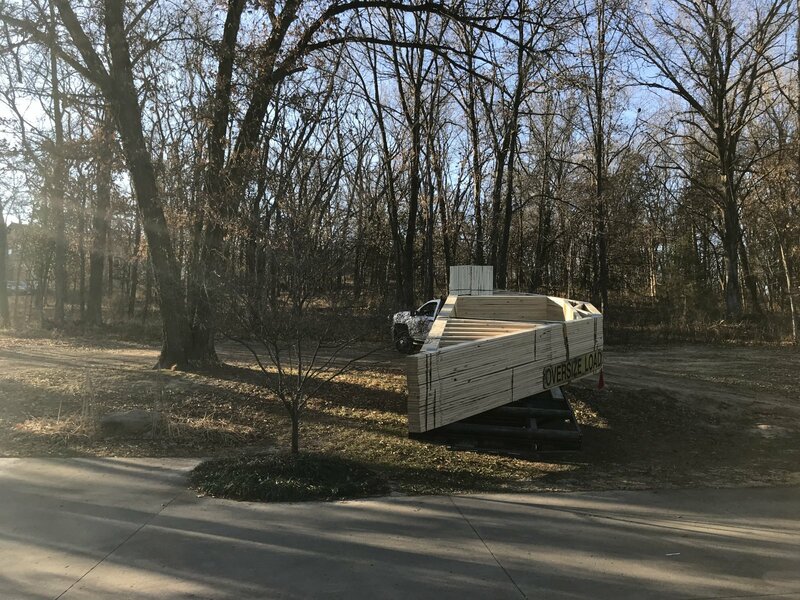 Hitched to the 3012 w hydrolift, I found I could roll the large pieces into the box, lift it high enough to keep them from rolling out, and move to the spot away from the planned construction site. I also used the Agri-fab utility carryall to move the smaller and split wood from to an area out of the way. This is a pretty good start on my winter shop heating. We will always have to make unexpected repairs to ~50 year old machines but that is part of the hobby. Collecting and operating them, listening to the engines lug, experiencing what they can accomplish, and using various pieces of equipment gets my adrenaline running full bore. Hope your weekend was as fun and fulfilling as mine has been. 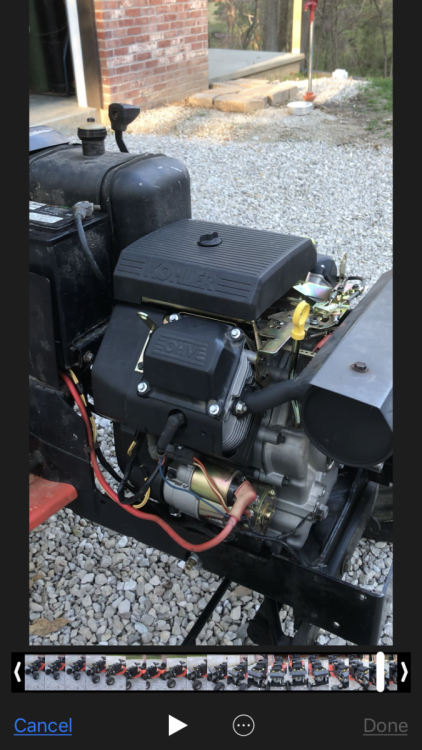 When I picked up the Simplicity 3012 from SimplicitySwede earlier this spring, he told me it leaked gasoline from the carburetor. 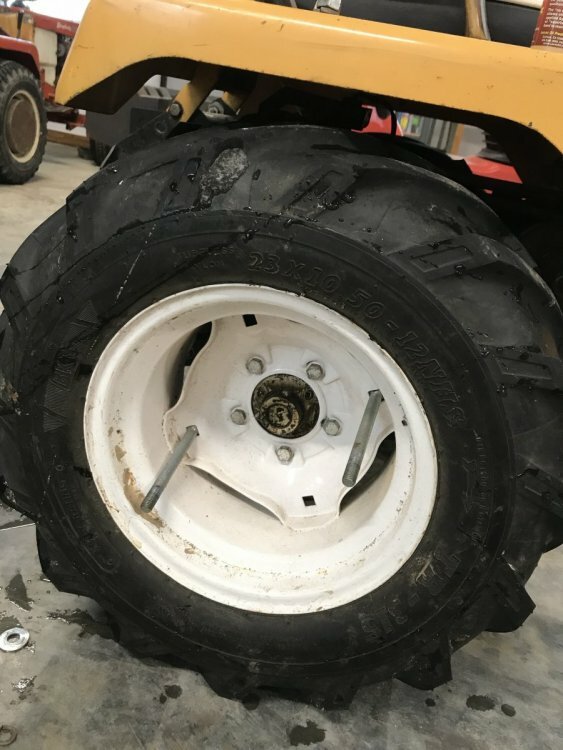 He controlled the leaking while parked by shutting off the valve under the gas tank, however there was a constant drip while operating the tractor as well. 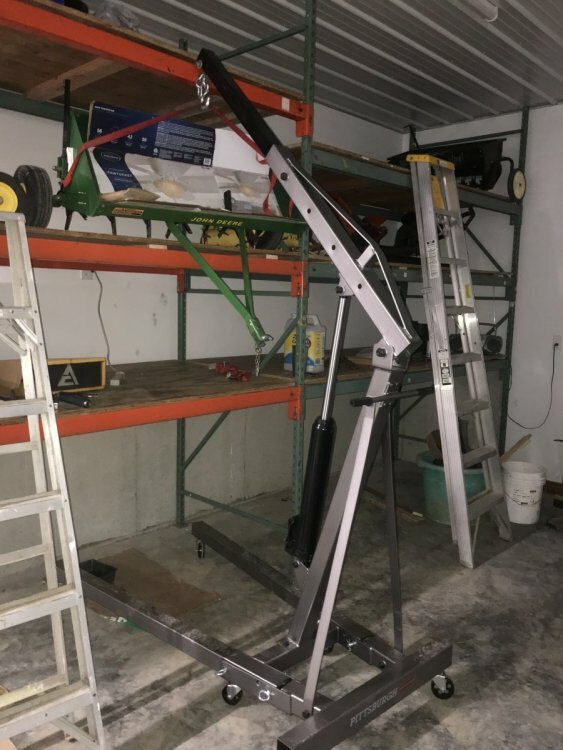 My shop is in the basement of our house and, any slight smell of gasoline permeates the Linda's house. So, I either have to keep these things under control or move the culprit tractor out under the deck (for now). 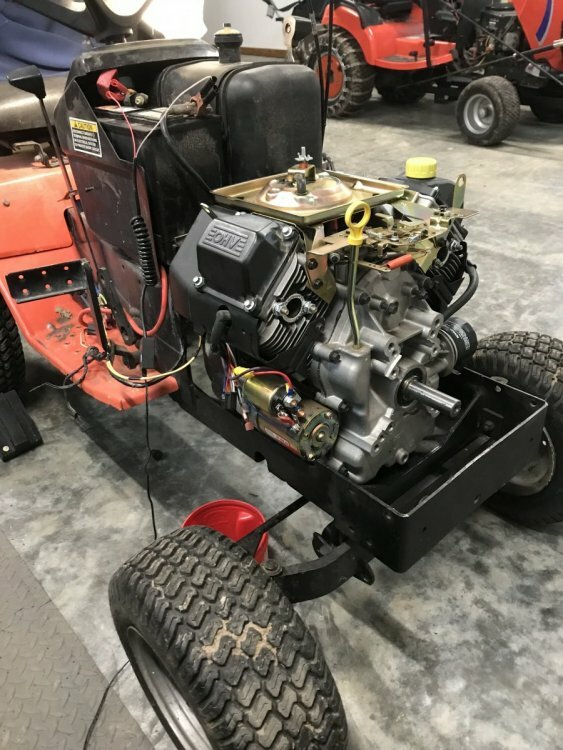 So last weekend I decided to overhaul the Briggs updraft carburetor on the 3012 to keep peace and harmony in the family. Had an overhaul kit on the shelf that I'd bought from Al Eden some time ago (old part number displayed) and I've done this several times so I set about the task to rebuild. This is going to be a piece of cake . Just to be sure I stay on task I pull out the Briggs carb adjustment cheat sheet. 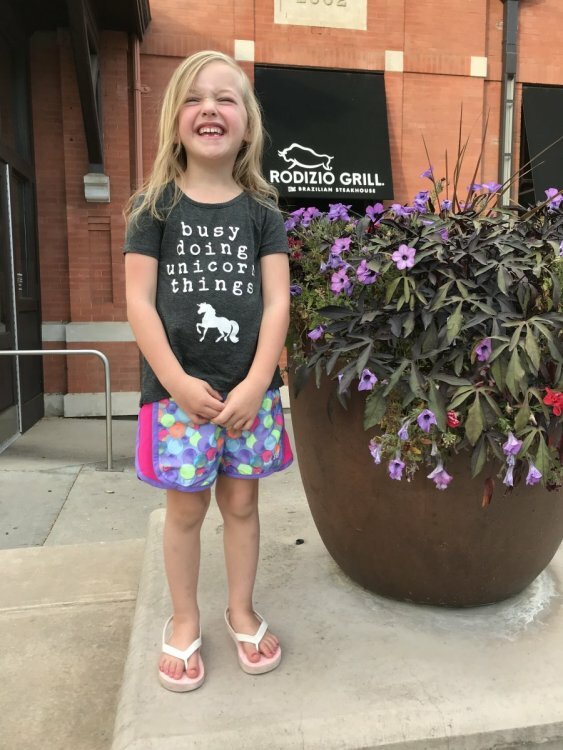 No job is routine! After overhaul the tractor ran rougher than before, wouldn't throttle up or down evenly, and leaked from this hole even more than before my overhaul. 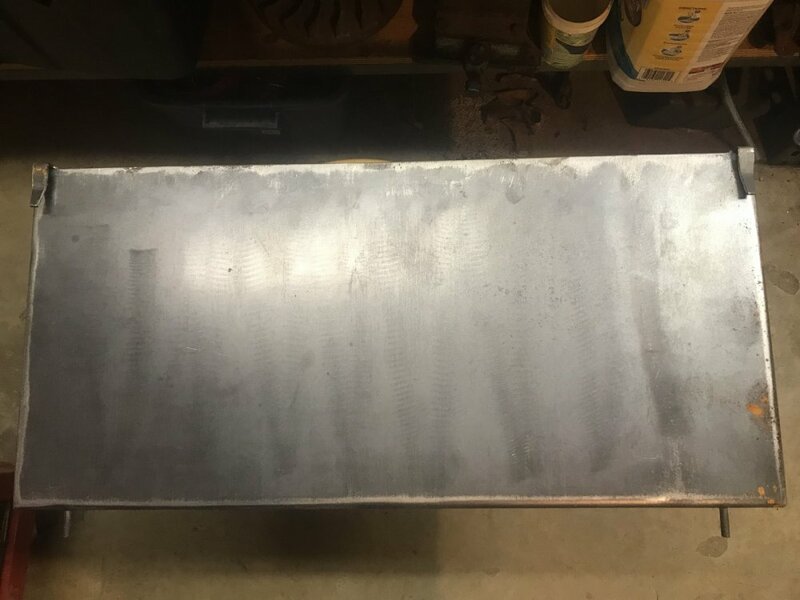 I have a back stock (Linda's term for my inventory) so I pulled the carburetor box off the shelf, got out the trusty Dremel, and cleaned up a different lower body determining this must be my problem along with maybe a float adjustment. After wire brushing, polishing, and compressed air, the replacement lower body was ready for service. Again, back stock time. 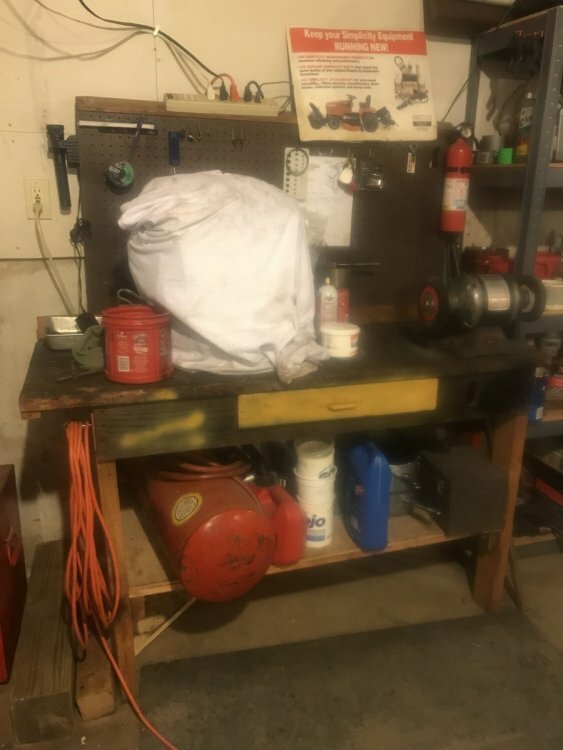 I bought an o-ring kit from my local Carquest auto parts store (no longer in business) a few years ago that's come in handy to rebuild fdt hydrolifts among other things. The smallest 006 fit the tube nicely. I reassembled the carb adjusting per Briggs instructions with the cleaned up 2nd lower body. No leaks while setting or running!! Not only that but, after idling for a full 5 minutes and readjusting the needle valve, the old Briggs 12hp runs like a Singer sewing machine while idling, throttles up nicely and gives off only a light puff of smoke on quick throttle up. Not bad for a 50yr old motor. The heavens opened on Central Missouri this week making it a soggy one. I emptied 1.6" from a Wednesday rain, 5.5" from Saturday rains, and .6" today. 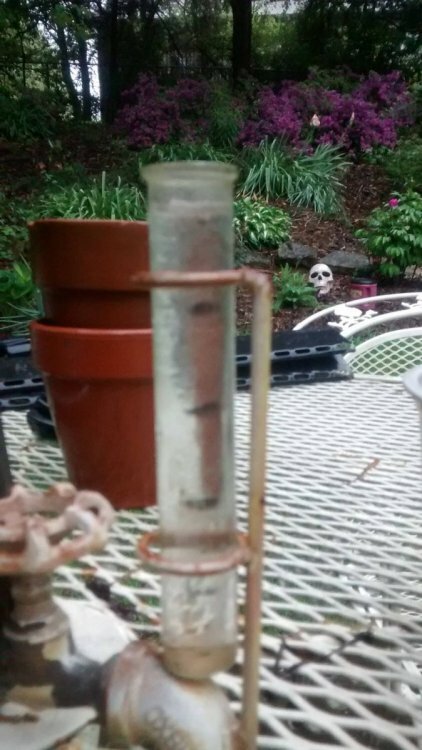 I forgot to take a picture of my rain gauge so this from Paul Jeffery, a college fraternity brother and buddy of mine. No mowing grass or any other tractor work much this week. 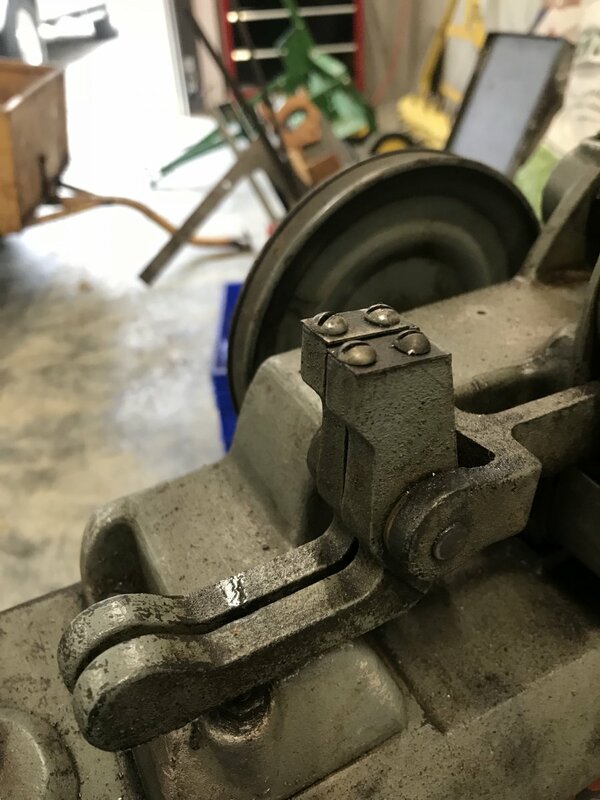 So I pulled the steering wheel (much easier than I expected), removed the bolts connecting the steering shaft to the steering gear, and pulled the steering shaft up to examine. 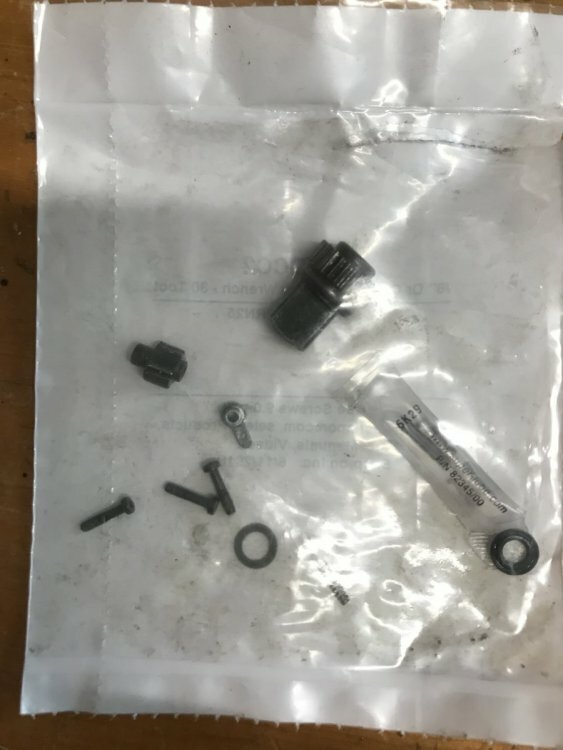 As you can see the OEM rubber bushing is toast and, there are some extra bushings between it and the retaining clip??? Look what I found. The added bushings were 3-rubber washers, maybe garden hose washers, and a short piece of threaded pipe. Guess someone didn't realize the retainer clip could be removed and placed in a higher position? A close-up of the homemade bushings. And another of the worn out OEM Simplicity bushing. Luckily I have a supply of NOS OEM rubber steering bushings I got a few years ago from Ed England and I have a couple of usable used ones too. Turned out to be a quick fix; at least I think its fixed anyho). I reset the retainer clip, drove a good used OEM rubber bushing in place and I took the opportunity to adjust the steering gear set screw. When back together sitting still on cement there seemed to be no steering shaft wobble or steering gear slip. 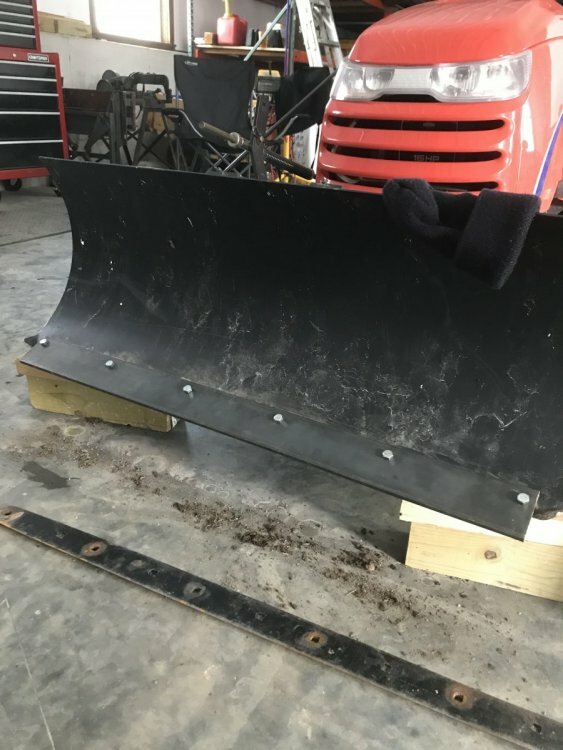 Due to the weather I was damp and cold by the time I finished this project so I packed the tools back into the shop, cleaned up and called it a day. The test will come in action next week. I'm generally a patient guy, especially when it comes to spending cash. Wasn't always that way but age, raising 2 daughters, and a divorce have contributed to that characteristic. Couple of things I discuss in this entry hinge on my patience. 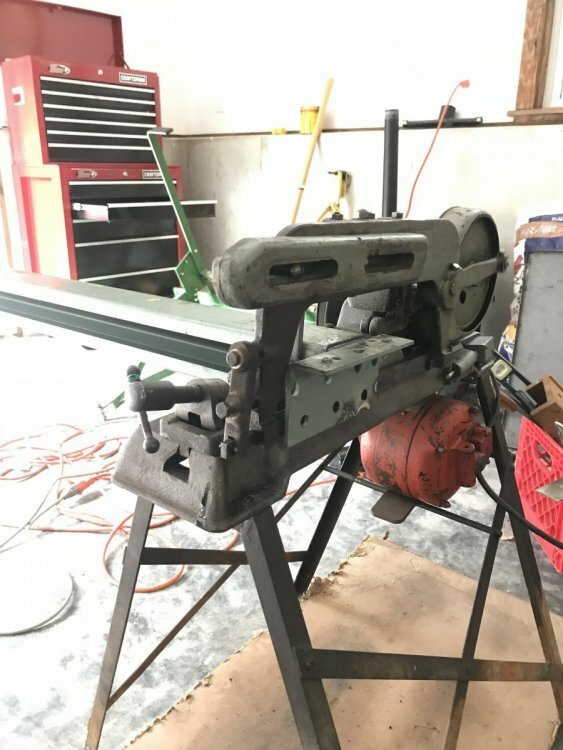 First, I've been looking for a decent 12hp briggs powered fdt since selling my last one, a 3112H, to member ronhruska about 2 yrs ago. On March 1 I decided to contact Jared Olsen aka SimplicitySwede regarding a 3012V package deal he was wanting to sell. We continued communicating and came to agreement April 7 so I made the trip the next day. 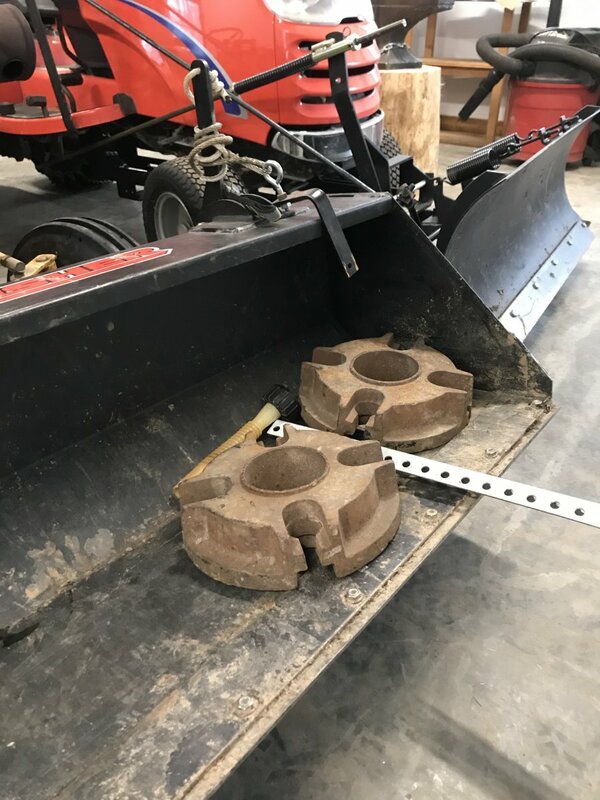 The pkg included an armstrong lift sickle bar mower that needs work, new pr mounted 23x8.50-15 Carlisle Tru Powers, new pr mounted 4.00-8 Deestone tri-ribs, 2-moldboard plows (1-orig AC & repainted Simplicity), pull behind cultivator, & center mounted scratcher along w/misc parts. The 3012 as she arrived. And now, a little cleaner & a doner seat from an AC. Side panel off to inspect the steering for excessive play. The upright pipe is going to come off soon too. 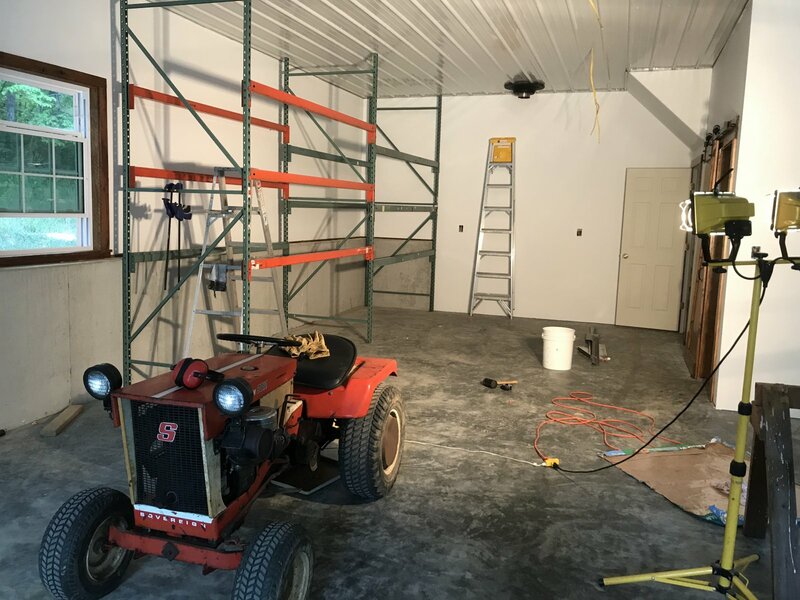 Swede has moved on to collecting and refurbishing Farmall tractors now so his Sovereign has set in the barn for awhile. She started quickly and ran nice as well but after a 3.5 hr trip home the sediment in the gas tank all came loose and I've battled that until today replacing fuel filters and draining out gunk. Today I think I drained the last of the gunk for awhile. As with most used nearly 50 yr old tractors there are issues that need attention so I've prioritized and will get to them as I can. However, in the meantime this old girl is going to have to earn her keep. 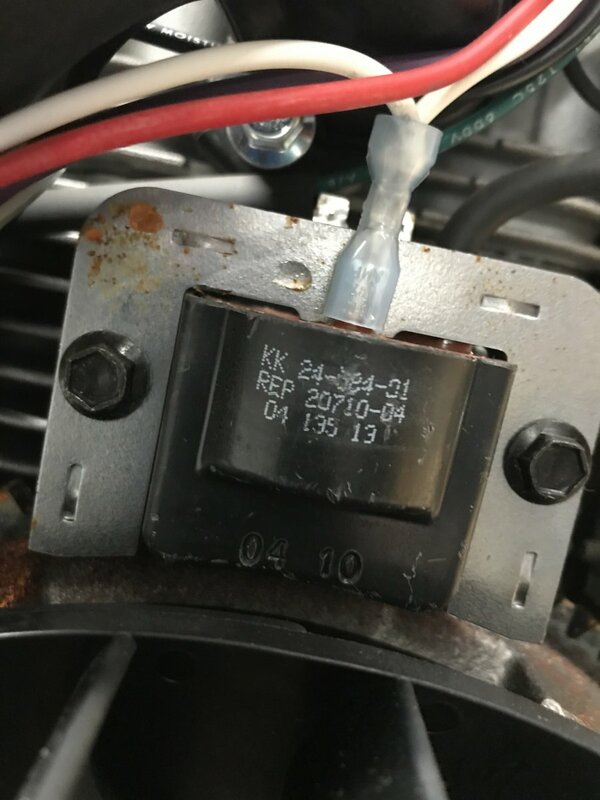 As many of you know the variable speed units are contrary. This one was way out of adjustment so I tackled that first. And 2nd: I'm going to start a series of entries soon on a shop build behind our house. 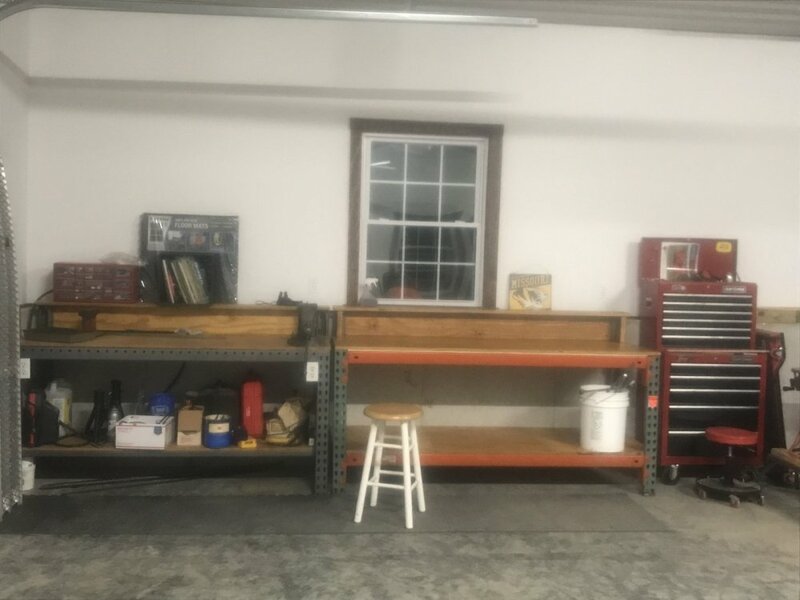 Linda has given her approval to my build, motivated I think because our basement is overflowing w/my ST collection or hoard and she's ready to get it back into her possession. See the climbing wall? Haven't been able to get to it for 5 yrs w/o moving a lot of stuff. Had a tree cut that was too close to the house for me to tackle. 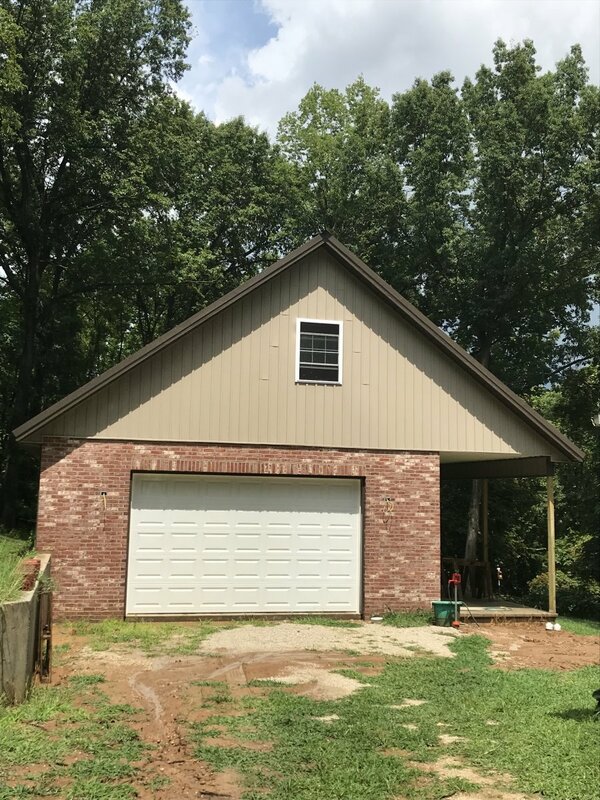 You can see the tree behind those beautiful dogwood trees, and to the left of the garage. Linda loves those 2 dogwoods and that subject will also be discussed later in the shop build. I started on clearing the limbs and small stuff this weekend. 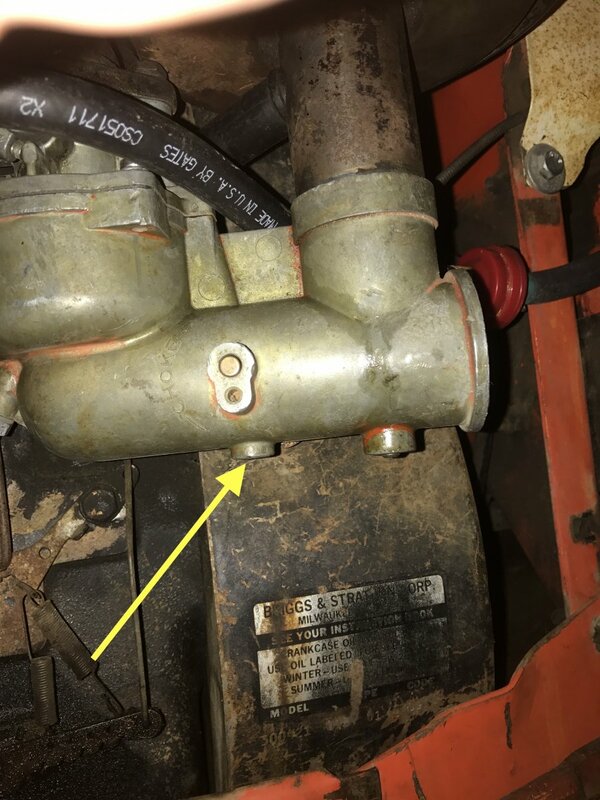 I hate stumbling over those things when I am operating my vintage Stihl 1989 024AV. Limbs cleared and ready to cut up the log for firewood to heat the shop. Agri-Fab Utility 10 Carry-all in action! Its been wet most of the spring and when it wasn't Linda and/or I were traveling. Had a load of mulch delivered in early March. Have the Swisher bucket mounted on the B210 but it doesn't really work well to dump a bucket of mulch on top of the already growing hosta plants. And it takes several trips over the yard and my grass, as you can see, has its challenges anyway. So I decided what the heck, let's put the Agri-Fab Utility 10 Carry-all to use. Here I am backed up to the wet double ground mulch pile in our drive. The silage fork fits easily as pictured so I can scoop from the sides and grab a large scoop full. 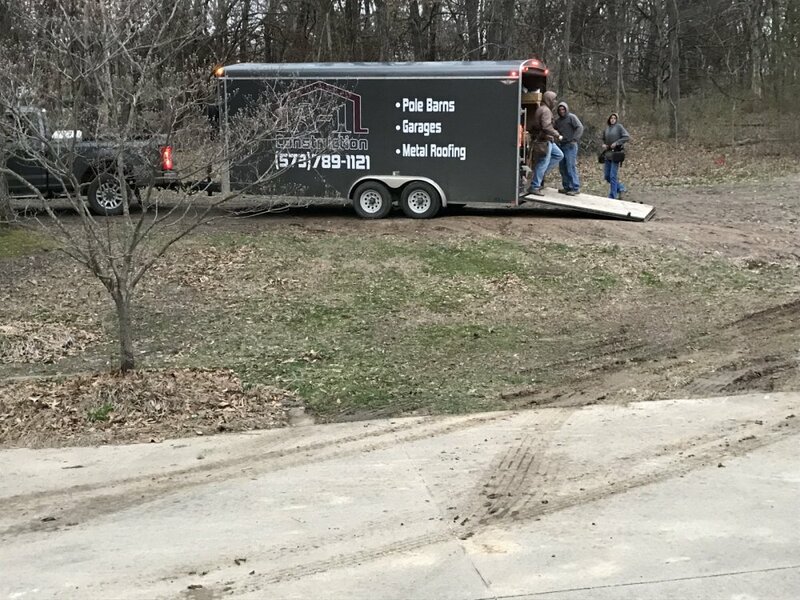 I'd used a larger Agri-fab Utility trailer to haul mulch this week but it holds about 2.5 times more, takes longer to load and unload (not enough built-in breaks), and you have to back it up. I am pretty good at backing 2 and 4 wheel trailers but I have earned the right to make it a little easier on myself when I want. No backing and more breaks it is. Here you see the loaded cart. I backed right over hosta plants and into the bed to. Nearly as handy as a shirt pocket. Cooper photobombed me. This mulch was wet/heavy but the box full wasn't hard to lift. Actually it seemed to break over center quickly making the armstrong lift easier than I expected. I'll post a picture of the hosta garden fully mulched later today. Love these warm, spring days. I am getting a handle on blogging (late is better than never, right?) so bare with me as I cut from the original, paste in new entries, and add more. As I stated, I sought advice from everyone I could think of about measurements, metal dimensions, maybe even buying a well worn Simplicity cart to use. Chris727 shuttered in his shoes when I mentioned I was thinking of "destroying a Simplicity dump cart for the cause. 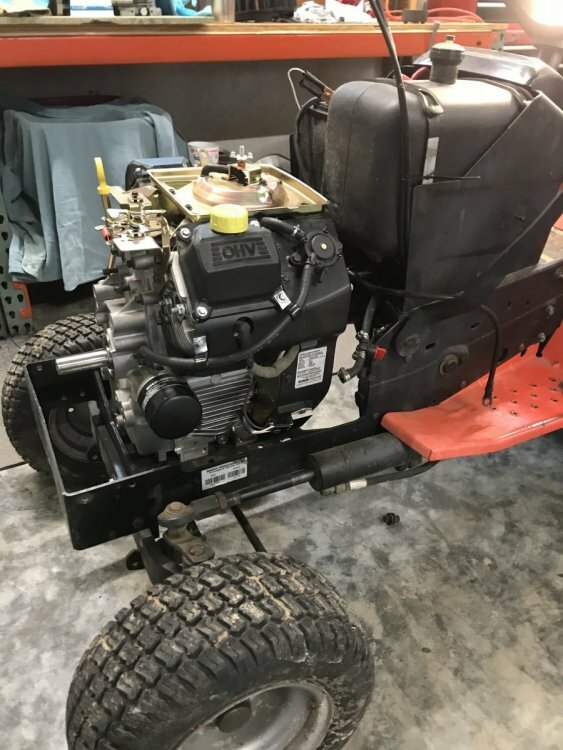 That caused me to rethink and remember a project build I'd followed on SimpletrACtors by snohiker https://simpletractors.com/forums/topic/37363-carryall-update-5-26-11/#comment-413033 Take a look at it and you will no doubt see similarities. Next up I contacted ZippoVarga for metal measurements. 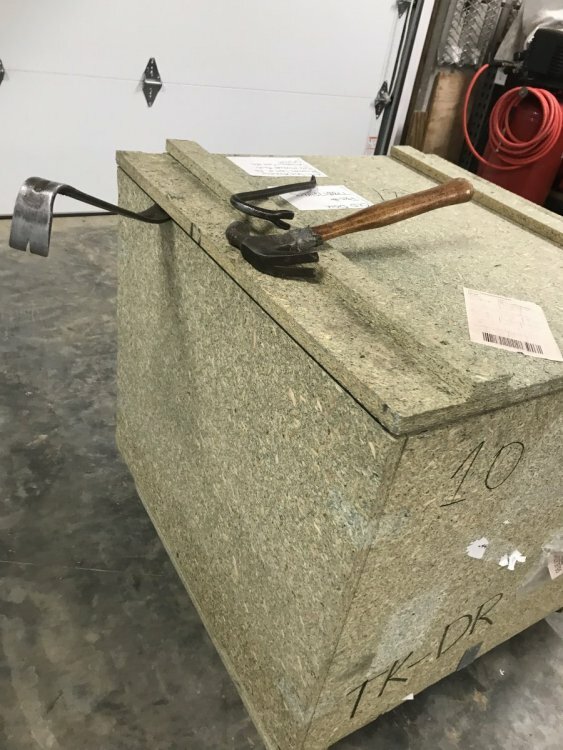 Zippo had bought an old, rough carry-all box that needed a total undercarriage rebuild. Again, you will see the similarity. If that furrow has already been plowed, and its working, all I really need to do is fall in line. 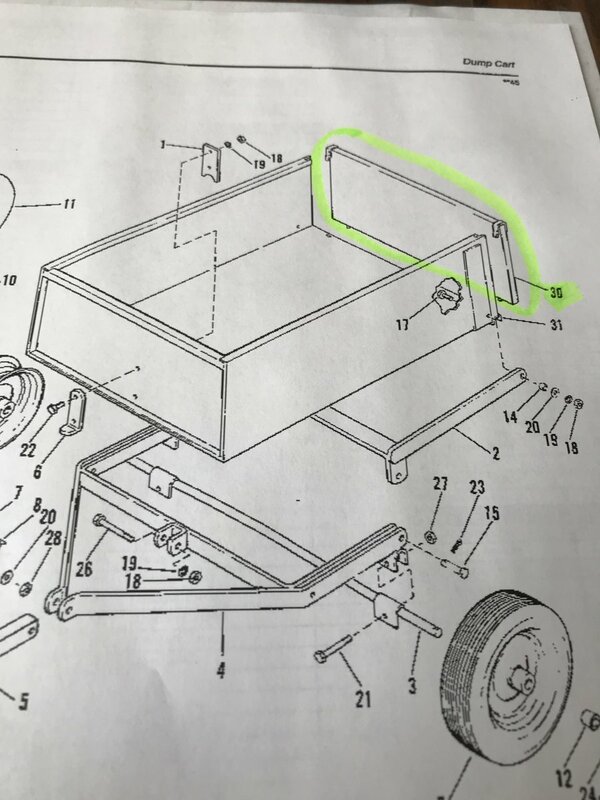 The run-down garden cart I bought from a CL ad was perfect. 2 flat tires and looked terrible but the bed was in nice, shape. I've thought about starting this on a FB post, saying something like: I've ended my life-long search for an Agri-Fab Utility 10 prototype carryall. I read about these "prototype" garden tractors found, one of a kind stuff, modifications like my dad and I would make to farm tractors and equipment to make them work better for us in our particular situation. Also, if we didn't have what we needed, and/or couldn't afford it, then we built it. I made this carry-all box to satisfy my want and save myself some cash. Thought also occurred to me the grandchildren might get a kick out of riding in it later.